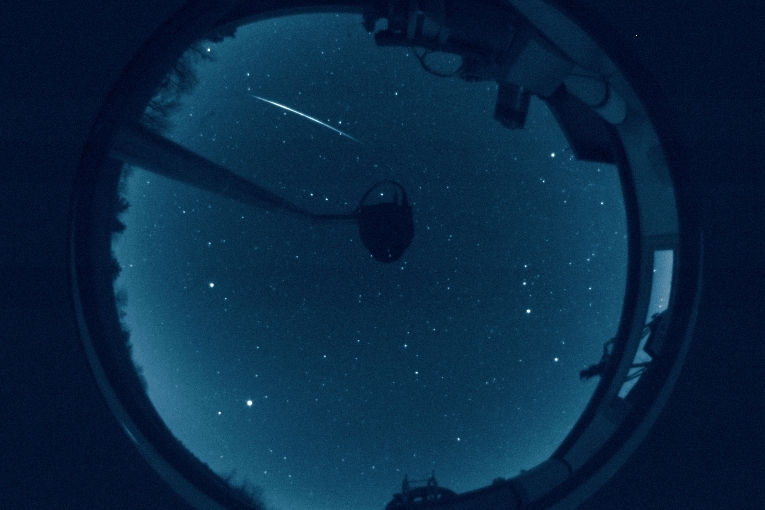 Fireball (about magnitude -12) was recorded at Črni Vrh Observatory on 2019 Mar. 31 morning. The analysis of the fireball trail shows that the body exploded and fragmented upon the entry into the atmosphere. The greenish glitter of the main explosion is beautifully seen, as well as several flashes at the end of a trail, indicating explosions of smaller remains of the parent body. 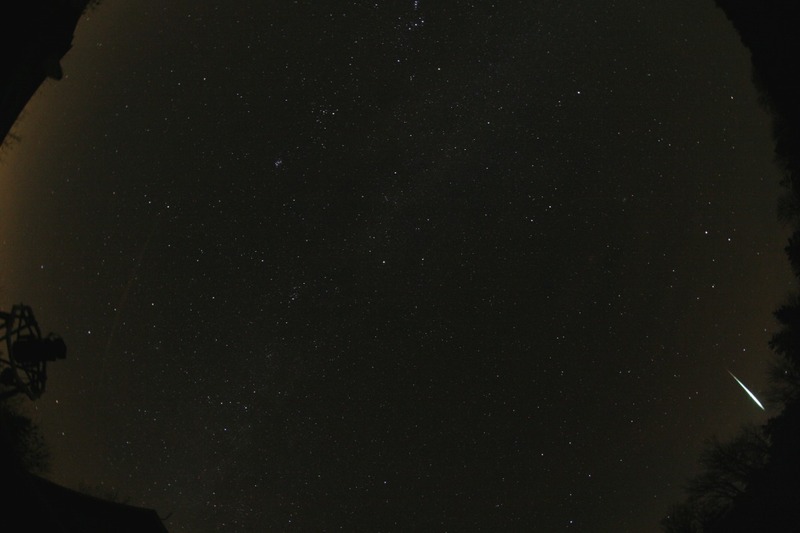 Fireball was recorded with the all-sky color camera and fisheye lens on 2019 Mar. 31 at 00:10:13UT +/-30s. Exposure time was 60s at ISO 3200. Copyright © 2019 by PIKA project, Črni Vrh Observatory. 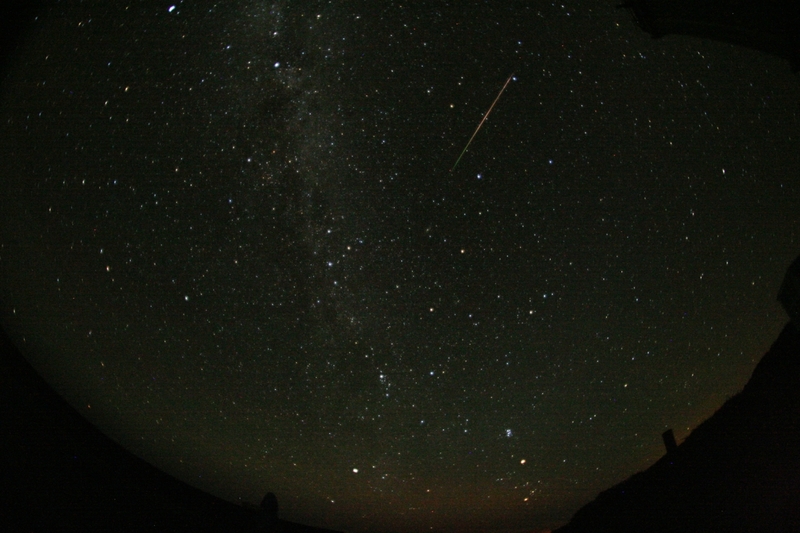 Enlarged view of the fireball path above the southern horizon. Copyright © 2019 by PIKA project, Črni Vrh Observatory. Supernova SN 2018kzc was discovered by S. Matičič on 2018 Dec. 27.961 UT on four images taken with 60-cm, f/3.3 Cichocki telescope and reported on the Transient Name Server. Spectroscopic observations were performed with the Asiago 1.82 m Copernico Telescope equipped with AFOSC (range 340-820 nm; resolution 1.4 nm) on 2018 Dec. 28.87 UT. The spectrum is consistent with a type-Ia supernova about 6 days before B maximum light, assuming a redshift z=0.0378. Details are published in TNS SN 2018kzc and ATel 12337. Discovery images were taken on 2018 Dec. 27.961 - 28.011UT with the 60-cm, f/3.3 Cichocki telescope. Image scale is 1.25 arc sec/pixel. Copyright © 2018 by S. Matičič, Črni Vrh Observatory. Fireball (about magnitude -10) was recorded at Črni Vrh Observatory on 2018 Sep. 11 evening. Fireball was recorded with the all-sky color camera and fisheye lens on 2018 Sep. 11 at 21:47:03UT +/-30s. Exposure time was 60s at ISO 3200. Copyright © 2018 by PIKA project, Črni Vrh Observatory. Enlarged view of the fireball path just above the NE horizon. Copyright © 2018 by PIKA project, Črni Vrh Observatory. 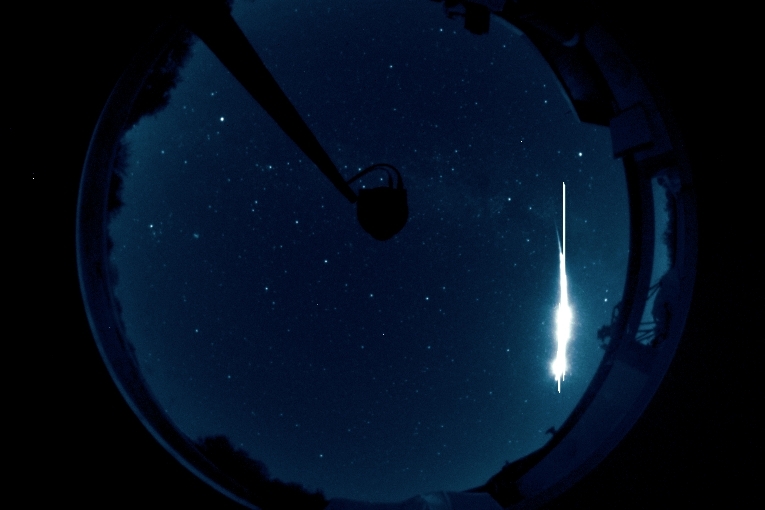 Bright fireball (about magnitude -10) was recorded at Črni Vrh Observatory on 2018 Aug. 28, just before dawn, moving nearly 40 degrees accross the sky. The sky was lit also by 97% illuminated Moon. Fireball was recorded with the all-sky color camera and fisheye lens on 2018 Aug. 28 at 02:43:18UT +/-30s. Exposure time was 30s at ISO 400. Copyright © 2018 by PIKA project, Črni Vrh Observatory. Enlarged view of the fireball path accross the sky. Copyright © 2018 by PIKA project, Črni Vrh Observatory. 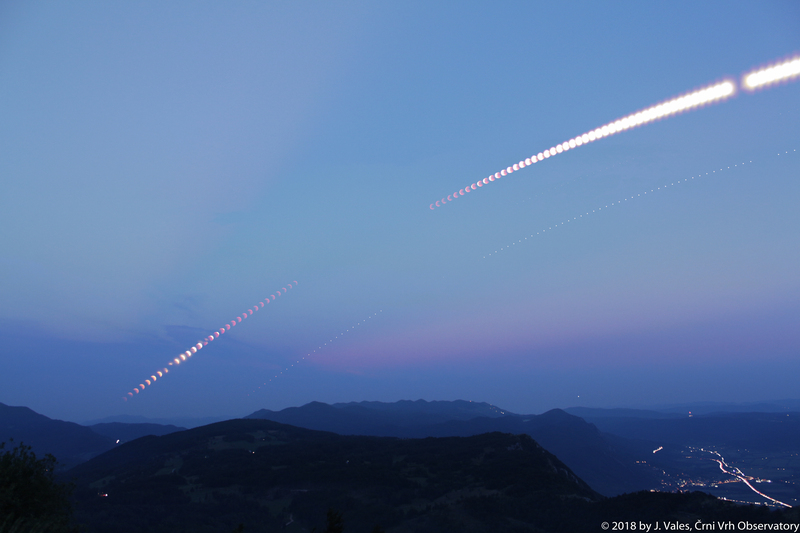 Time-lapse sequence of the Total Lunar Eclipse, composed from images by Jan Vales, obtained from Sinji Vrh (see explanation to 1st picture). Beginning of video also shows the anticrepuscular rays from the setting Sun just below the horizont. Copyright © 2018 by J. Vales, Črni Vrh Observatory. 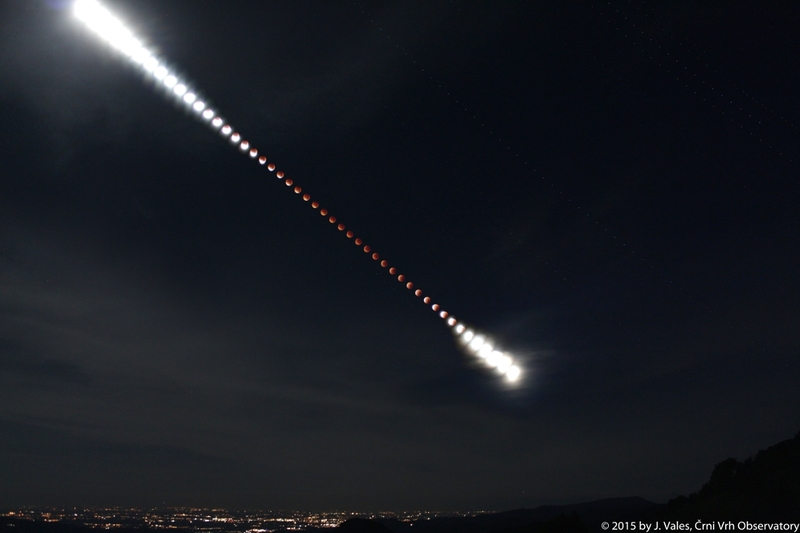 Time-lapse sequence of the Total Lunar Eclipse and opposition of Mars, composed from images by H. Mikuž, obtained from guided exposures, taken at Črni Vrh Observatory (19h44-22h06UT) with 17 mm, f/4 lens and Canon 6D camera. Mars was just below the Moon during the eclipse. Copyright © 2018 by H. Mikuz, Črni Vrh Observatory. Dne 29. oktobra 2017, okoli 16h25 SEČ so bili iz Idrije v smeri zahoda vidni oblaki mavričnih barv. Gre za razmeroma redek pojav iridescence, ki obarva oblak v nenavadno žive barve ali istočasno pokaže cel spekter barv. Ti oblaki nastanejo iz majhnih kapljic vode skoraj enakih velikosti. Ko je Sonce na pravem mestu in skoraj skrito za debelimi oblaki, ti tanjši oblaki znatno uklanjajo svetlobo s Sonca, pri čemer se različne barve različno odklanjajo in zato opazovalca dosežejo iz nekoliko različnih smeri. Veliko oblakov nastane iz kapljic enakih velikosti in bi zato lahko prišlo do iridescence, vendar hitro postanejo predebeli, neenotni ali predaleč stran od Sonca, da bi lahko pokazali osupljive barve. Efekt je podoben nastanku mavrice na tankem oljnatem filmu, ki plava na vodi in je osvetljen s svetlobo. Pojavlja se na oblakih cirokumulus, altokumulus ter lečastih oblakih. V tem primeru je Hleviško hribovje že zakrivalo zahajajoče Sonce in so bile barve na oblakih bolj izrazite in žive. 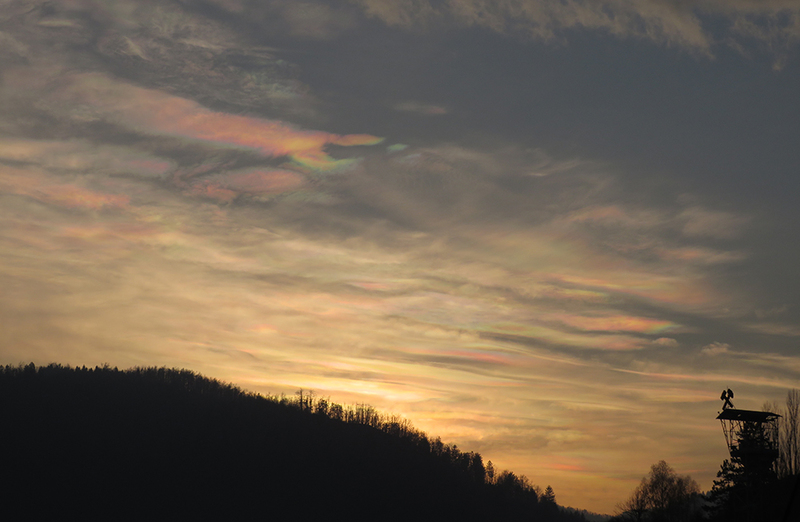 Iridescentni oblaki, posneti iz Idrije 29. oktobra 2017 okoli 16h25 SEČ. Copyright © 2017, Jan Vales, Črni Vrh Observatory. 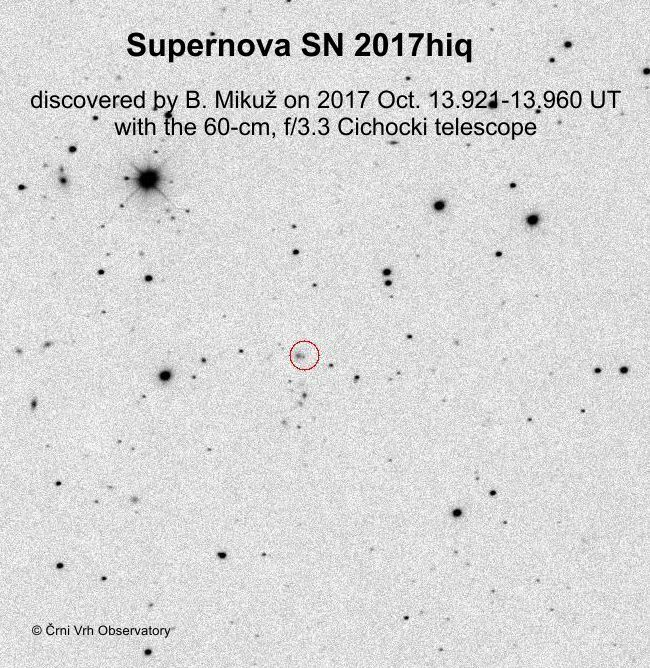 Supernova SN 2017hiq in host galaxy SDSS J005254.06+160654.7 was discovered by B. Mikuz on 2017 Oct. 13.921 - 13.960UT on four images taken with 60-cm, f/3.3 Cichocki telescope and reported on Transient Name Server. Spectroscopic observations were performed with the Asiago 1.82 m Copernico Telescope equipped with AFOSC (range 340-820 nm; resolution 1.4 nm) on 2017 Oct. 17. The spectrum is consistent with a type-Ia supernova around maximum light, assuming a redshift z=0.091. Details are published in TNS SN 2017hiq and ATel 10863. Discovery images were taken on 2017 Oct. 13.921 - 13.960UT with the 60-cm, f/3.3 Cichocki telescope. Image scale is 1.25 arc sec/pixel. Copyright © 2017 by B. Mikuz, Črni Vrh Observatory. On 2017 Aug. 27 (02:48:11 UT +/-15s) the All-sky camera at Črni Vrh Observatory recorded about magnitude -12 fireball above the western horizon. 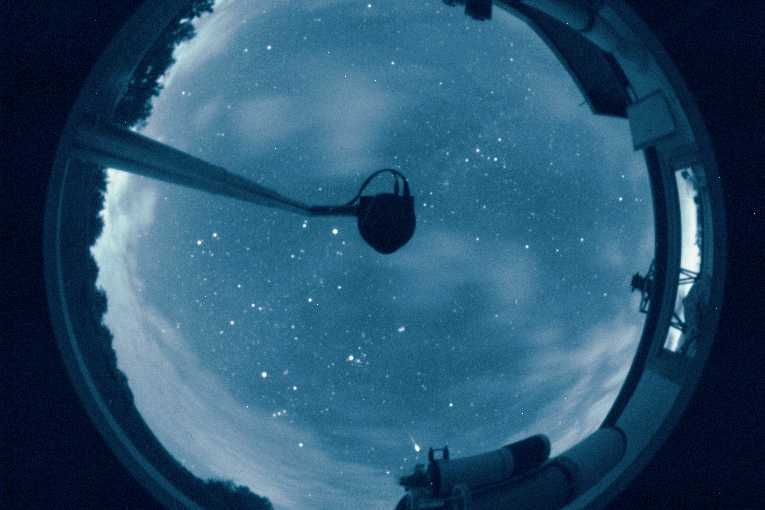 The whole event with weak afterglow is recorded on this night time-lapse movie. Copyright © 2017 Črni Vrh Observatory. Perseid activity observed from Črni Vrh Observatory, during the maximum activity on the night of Aug. 12-13, 2017. Since the bright moonlight interfered most of the night, only several bright Perseids were recorded. Among them also a Perseid fireball at 19h42UT, yet during the evening twilight. Recorded on 2017 Aug. 12 (19h42UT) with b/w CCD All Sky Camera. Copyright © Črni Vrh Observatory. 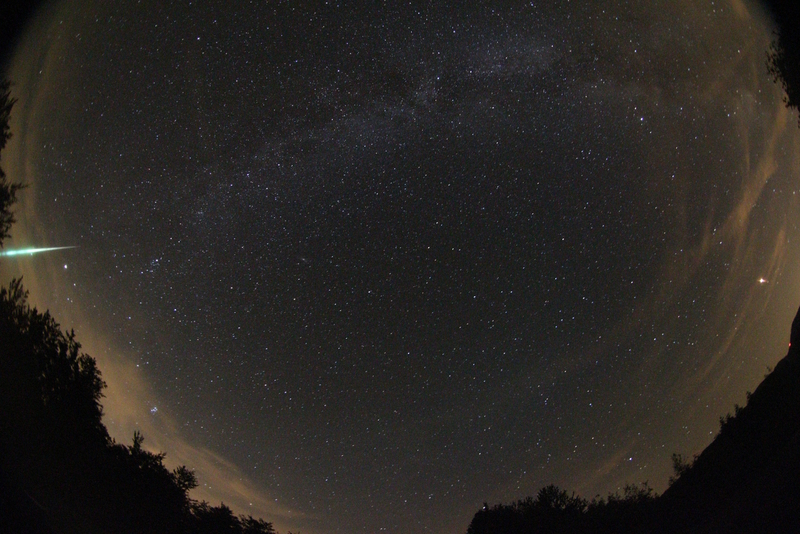 Recorded on 2017 Aug. 12 (19h42UT) with Canon EOS 20D and 8mm, f/4 fisheye lens. Exposure time was 30s at ISO 3200. Copyright © Črni Vrh Observatory. Recorded on 2017 Aug. 13 (2h00UT) with b/w CCD All Sky Camera. Copyright © Črni Vrh Observatory. 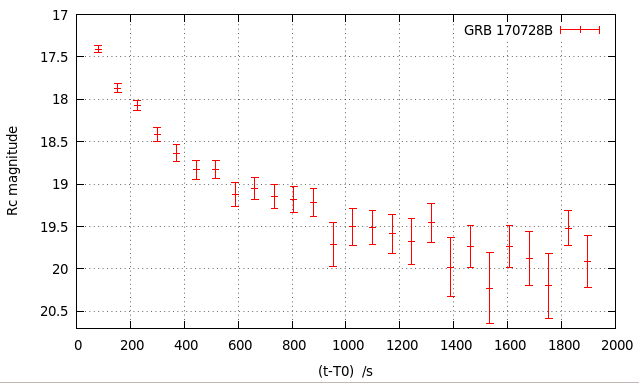 We observed the afterglow of GRB 170728B (Cenko et al., GCN Circ. 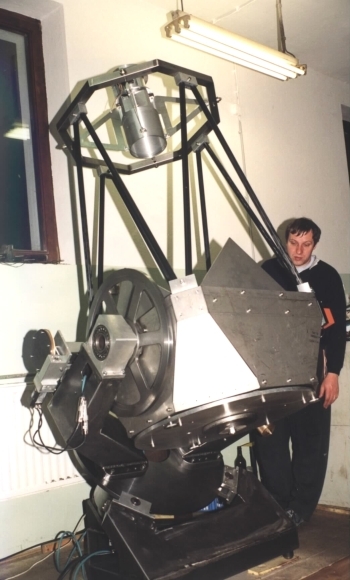 21371) with 60-cm Cichocki robotic telescope at Crni Vrh Observatory, Slovenia. The series of twenty-six 60 second exposures with Rc filter started at 23:04:41UT, 81 seconds after the burst. We confirm optical afterglow at coordinates reported by D’Avanzo et al. (GCN Circ. 21372, 21373). The object was clearly detected on all 26 frames. Complete results are published in GCN 21394 Circular. Photometry results obtained from our Rc photometry data. The table contains the mid time of exposure in MJD, time since the Swift GRB detection to the middle of exposure in seconds, Rc magnitude and photometric error. The magnitudes are derived using comparison stars from the APASS catalog. The 3-sigma limiting magnitude in Rc filter is around magnitude 20.2 ± 0.2. Copyright © 2017 by B. Dintinjana and H. Mikuž, Črni Vrh Observatory, Slovenia. Supernova SN 2017yi in galaxy 2MASX J02592769+1447417 was discovered by J. Vales on 2017 Jan. 29.726 - 29.772 UT on four images taken with 60-cm, f/3.3 Cichocki telescope and reported on Transient Name Server. Spectroscopic observations were obtained with the 2.16-m telescope of Xinglong Station of National Astronomical Observatories of China (NAOC) on 2017 Feb. 2.94UT. The spectrum is consistent with a type-Ia supernova and matches with SN 2003du at t = -9 days from the maximum light. Details are published in TNS SN 2017yi and ATel 10039. Discovery images were taken on 2017 Jan. 29.726 - 29.772UT with the 60-cm, f/3.3 Cichocki telescope. Image scale is 1.25 arc sec/pixel. Copyright © 2017 by J. Vales, Črni Vrh Observatory. Supernova SN 2017nx was discovered by S. Matičič on 2017 Jan. 23.890 - 23.920 UT on four images taken with 60-cm, f/3.3 Cichocki telescope and reported on Transient Name Server. Spectroscopic observations were obtained by The Asiago Transient Classification Program, using the 1.80-m telescope on 2017 Jan. 24.87UT. The spectrum is consistent with a type-Ia supernova one week before maximum light. Details are published in TNS SN 2017nx and ATel 9996. Discovery images were taken on 2017 Jan. 23.890 - 23.920UT with the 60-cm, f/3.3 Cichocki telescope. Image scale is 1.5 arc sec/pixel. Copyright © 2017 by S. Matičič, Črni Vrh Observatory. 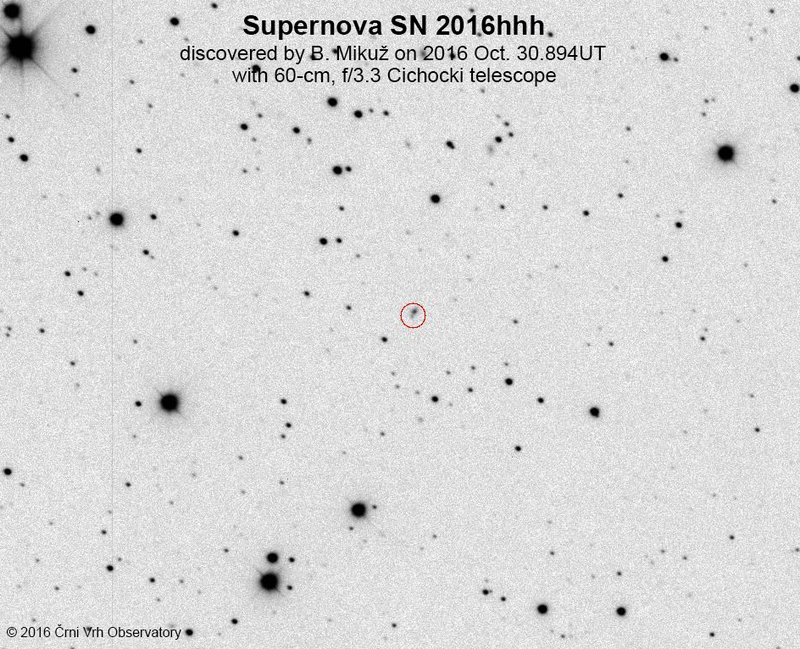 Supernova SN 2016hhh was discovered by B. Mikuž on 2016 Oct. 30.894UT on four images taken with 60-cm, f/3.3 Cichocku telescope and reported on Transient Name Server. Spectroscopic observations were obtained by iPTF (Intermediate Palomar Transient Factory) The spectrum is consistent with a type-Ia supernova. Details are published in TNS SN 2016hhh. Discovery images were taken around 2016 Oct. 30.894UT with the 60-cm, f/3.3 Cichocki telescope. Image scale is 1.25 arc sec/pixel. Copyright © 2016 by B. Mikuž, Črni Vrh Observatory. Objekt 2016 PN66 je 14. avgusta 2016 odkril Jure Skvarč na Observatoriju Črni Vrh. Gre za transneptunski objekt, ki ima orbito z veliko polosjo 31,64 astronomske enote (a.e), kar je le malo več od Neptunove velike polosi. Obhodni čas je 179 let, kar je približno 15 let več od obhodnega časa Neptuna. V družino transneptunskih objektov spadajo objekti, ki so v orbiti okoli Sonca na večji povprečni razdalji od Neptuna (30,1 a.e.). Prvi odkriti transneptunski objekt je bil Pluton že leta 1930. Naslednji (1992 QB1) je bil odkrit šele leta 1992. Danes jih je na seznamu Centra za male planete preko 1750. Največji med njimi je Pluton, ki mu sledijo Eris, Makemake in Haumea. 2016 PN66 je nebesno telo velikosti okrog 10 km, ki se je ob odkritju nahajalo na razdalji 2,88 a.e. od Zemlje. Objekt je pritegnil pozornost zaradi neobičajno velike inklinacije (i=105,1°), to je kota med njegovo ravnino gibanja in ekliptično ravnino. Inklinacija, večja od 90° pomeni, da se objekt giblje retrogradno. Med vsemi znanimi telesi v Osončju (planeti, lune, pritlikavi planeti, asteroidi, itd. ), razen kometov, kroži 99,986% vseh teles v isti smeri okrog Sonca, zato so objekti z nasprotno smerjo kroženja oziroma retrogradnim gibanjem izjemno redki. Objekt 2016 PN66 ob odkritju ni kazal kometne aktivnosti (koma, rep). Glede na to, da se je takrat šele bližal prisončju (13. oktober 2016), bi se kometna aktivnost lahko še pojavila. Zato smo ga skrbno opazovali vsako jasno noč in analizirali njegov svetlobni profil. Dne 1. septembra 2016 ga je posnel Robert Holmes z 1,3-m f/4 astrografom na Astronomical Research Institute (ARI) v Illinoisu, ZDA. Tudi to opazovanje z večjim teleskopom ni pokazalo sledov kometne aktivnosti. Objekt 2016 PN66, posnet 9. septembra 2016 (1h20-1h35UT) s 60-cm, f/3,3 teleskopom Cichocki na observatoriju Črni Vrh. Slika je sestavljena iz desetih 90-sekundnih posnetkov in sešteta z upoštevanjem premika objekta. Copyright © 2016 J. Vales in H. Mikuž, Črni Vrh Observatory. Ob prihodu v prisončje sredi oktobra mu je sij narastel na okoli 17,5m, vendar je njegov profil ostal točkast, kot pri asteroidih ali zvezdah. Sredi novembra je bil objekt že na deklinaciji -25° in se pomika še južneje, zato ga je čedalje težje opazovati iz severne poloble. Seveda ga bo še vedno zanimivo spremljati s teleskopi na južni polobli. Če je objekt v resnici komet, izbruh prahu in plinov še vedno ni povsem izključen. Zbrane meritve so objekt 2016 PN66 zaenkrat uvrstile v skupino Damokleidov, ki imajo periodično kometno orbito, vendar ne kažejo znakov kometne aktivnosti, ker so izgubili hlapno snov. 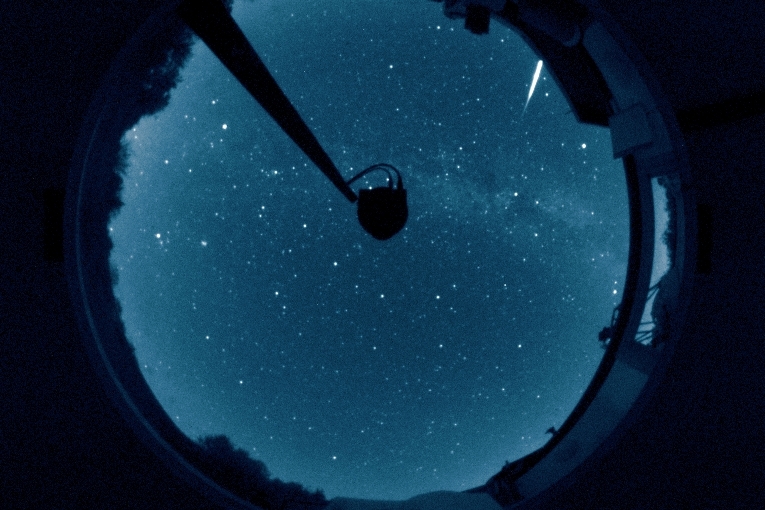 Report on Perseid activity observed from Črni Vrh Observatory, during the nights of maximum activity in August 2016. Several fireballs and many meteors were recorded with newly set up Canon EOS 20D color All Sky Camera, comprising Peleng 3.5/8 mm fisheye lens. The camera lens was stopped to f/4 to give sharper images on standard 30 second exposures. Because the EOS camera is taking images at 2 minute intervals, the omitted observing time was covered with Canon EOS 6D + 8mm fisheye lens and with b/w CCD All Sky Camera that we use since 2004. Occasional cloud passages slightly affected observations. 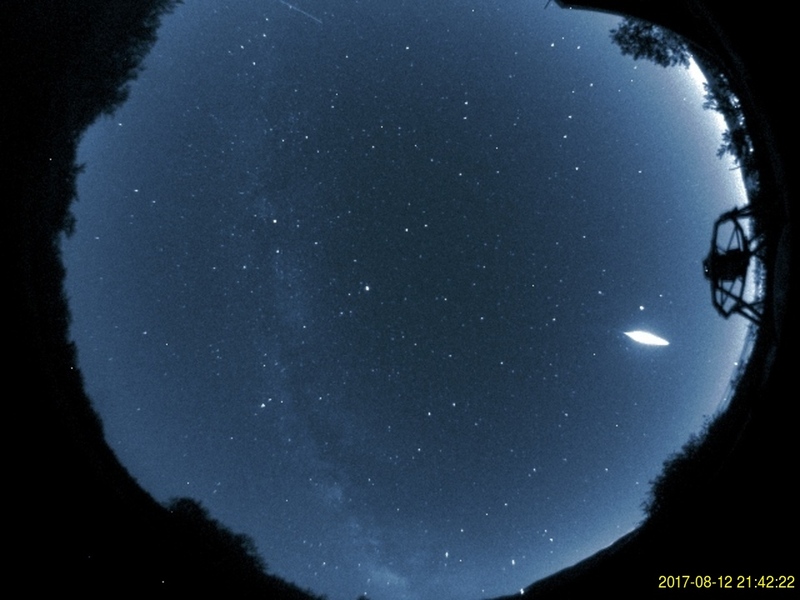 Time-lapse video sequence of Perseid meteor shower recorded on 2016 Aug. 11 (23h18UT - 23h43UT), with Canon EOS 650D + 18mm lens. Animation was composed from a series of 30 seconds exposures, set to ISO 6400. Six meteors and fireball with afterglow were recorded during the 25 minute time interval. Copyright © J. Vales, Črni Vrh Observatory. Ob prehodu nevihtne fronte 5. avgusta 2016 v večernih urah, so se za kratek čas nad observatorijem pojavili oblaki mammatus. Gre za redek tip oblakov v obliki navzdol obrnjenih izboklin, ki se pojavijo ob prehodih hladne fronte v pogrezajočem se zraku. Razvijejo se na spodnjem delu frontalne površine in imajo lahko zelo nenavaden izgled, posebno če so osvetljeni od Sonca. Kljub zloveščemu izgledu ne napovedujejo nastanek tornada, kot se pogosto domneva. Pravzaprav se običajno pojavijo, ko je najintenzivnejše dogajanje v fronti že mimo. Dvigajoči tokovi nosijo s padavinami obogaten zrak proti vrhu oblaka, kjer se dviganje ustavi. Zrak se začne razlivati v horizontalni smeri in postane del frontalnega oblaka. Ker je v njem visoka koncentracija padavinskih delcev (ledeni kristali in vodne kapljice), je nasičen zrak težji od okoliškega, zato se začne spuščati nazaj proti tlom. 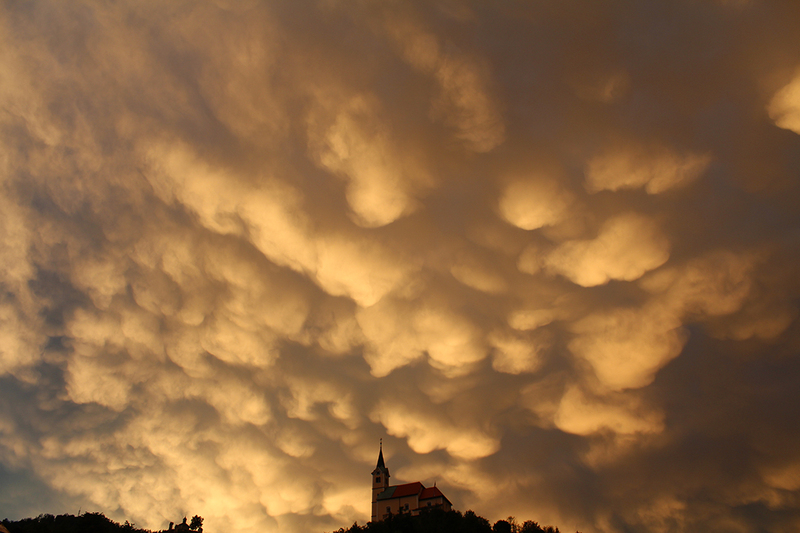 Oblaki mammatus trajajo dlje časa, če vsebuje pogrezajoči zrak velike kapljice vode in ledenih kristalov. Slednje porabijo za izhlapevanje več energije in razpad oblaka lahko traja dlje časa. V konkretnem primeru je pojav trajal približno 20 minut. Oblaki mammatus v smeri jugovzhod, posneti ob 20h05 SEPČ. Copyright © 2016 Črni Vrh Observatory. Oblaki mammatus v smeri sever-severozahod, posneti ob 20h14 SEPČ. Oblaki mammatus v smeri sever-severozahod, posneti ob 20h15 SEPČ. Oblake mammatus je iz Idrije v smeri sever ob 20h23 SEPČ posnel Jan Vales. Copyright © J. Vales, 2016 Črni Vrh Observatory. Supernova PSN J12080010+1944267 was discovered by B. Mikuž on 2015 Dec. 28.091-28.118UT and reported in TOCP. It was confirmed on 2015 Dec. 29.092UT by S. Matičič using the same telescope. Spectroscopic observations were conducted on 2015 Dec. 31 by PESSTO, the Public ESO Spectroscopic Survey for Transient Objects, using ESO New Technology Telescope at La Silla, EFOSC2 and Grism 13 (3985-9315A, 18A resolution). The spectrum is consistent with a type-II supernova around maximum light. Details are published in ATel 8498. Discovery images were taken on 2015 Dec. 28.091-28.118UT with the 60-cm, f/3.3 Cichocki telescope. Image scale is 1.25 arc sec/pixel. Copyright © 2015 by B. Mikuž, Črni Vrh Observatory. 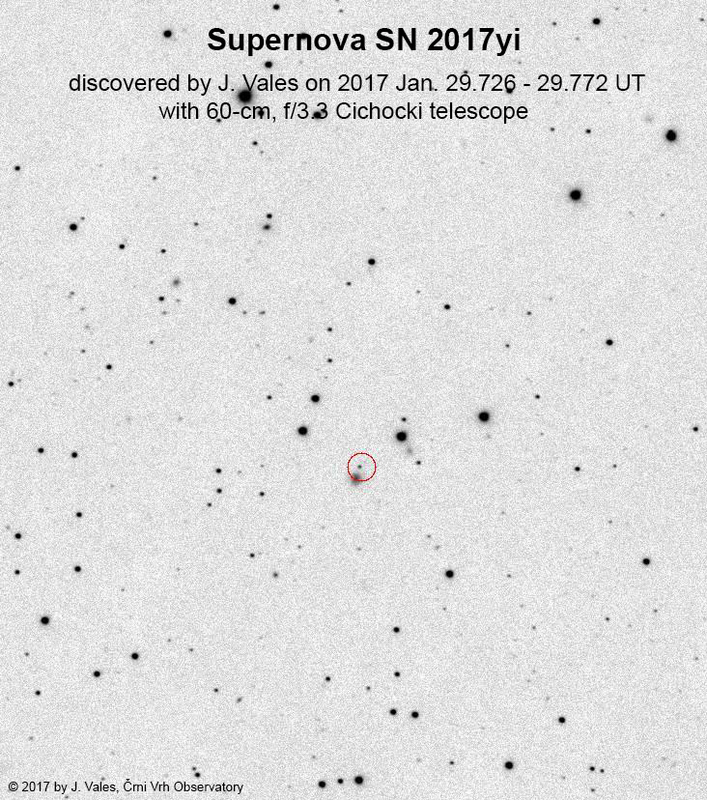 NEO asteroid 2015 YA1 was discovered on 2015 Dec. 16.95 - 16.97UT by S. Matičič on images taken in the scope of Comet and Asteroid Search Program PIKA at Črni Vrh Observatory. At the time of discovery, the object already moved away from Earth and fading rapidly. Anyway, follow-up observations on Dec. 17.90 and 19.0UT at 106 were successful and together with other observers secured enough astrometry for precise determination of orbit. Discovery was announced in MPEC 2015-Y39. According to orbital elements, the object belongs to the Apollo family of asteroids. Discovery image, obtained on 2015 Dec. 16.95UT with the 60-cm, f/3.3 Cichocki telescope. 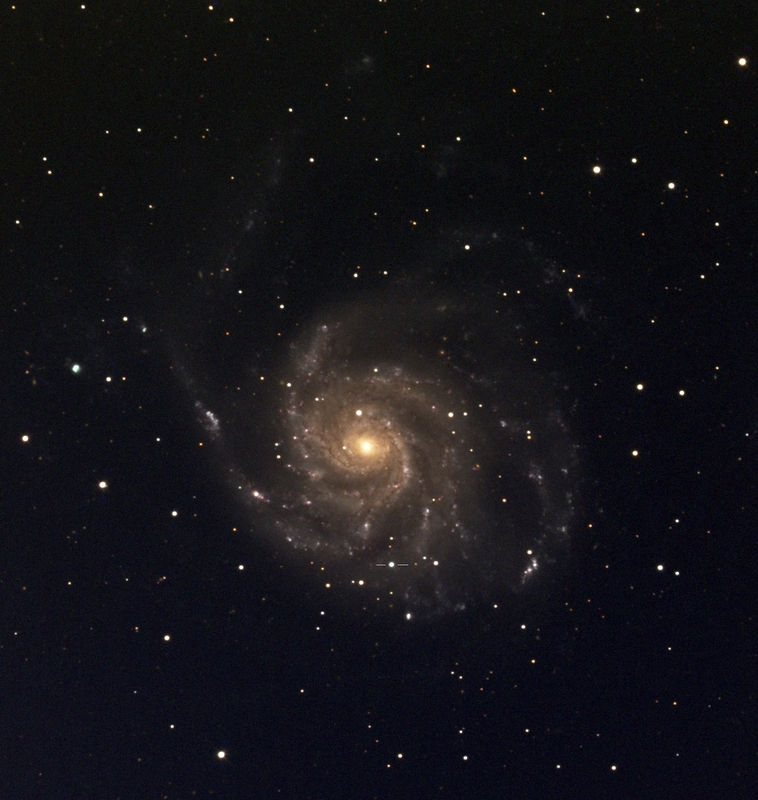 Copyright © 2015 by S. Matičič, Črni Vrh Observatory. 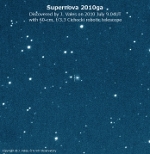 Supernova 2015bg was discovered by S. Matičič on 2015 Dec. 16.805 UT and reported in TOCP. It was confirmed on 2015 Dec. 17.77UT by G. Masi (Virtual Telescope Project). Spectroscopic observations were conducted on Dec. 17.6 UT with the 2.16-m telescope (+ OMR) at the Xinglong Observatory of the National Astronomical Observatories of China (NAOC). The spectrum is consistent with a type-Ia supernova around maximum light. Details are published in ATel 8432 and CBET 4226. Discovery images were taken on 2015 Dec. 16.805-16.830UT with the 60-cm, f/3.3 Cichocki telescope. Image scale is 1.25 arc sec/pixel. 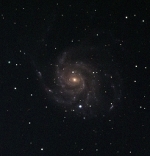 Copyright © 2015 by S. Matičič, Črni Vrh Observatory. PSN J00545681+1048036 was discovered by J. Vales on 2015 November 05.83 UT and reported in TOCP. It was confirmed on 2015 Nov. 7.77239UT by G. Masi (Virtual Telescope Project). 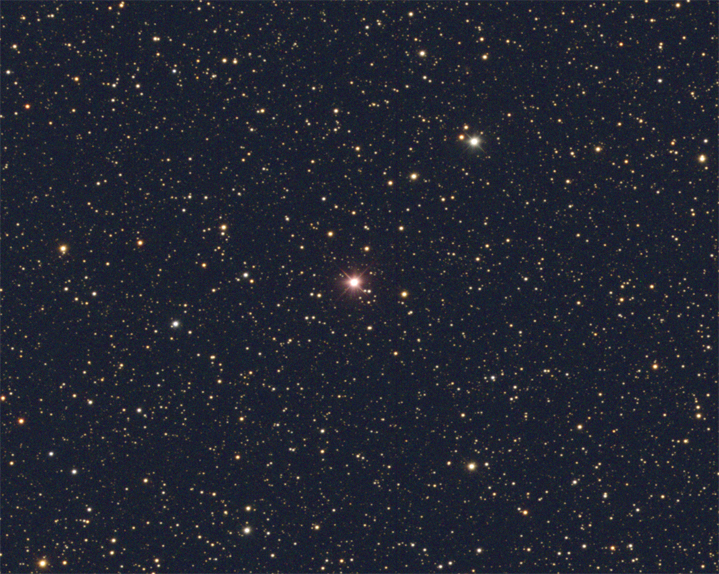 Discovery images were taken on 2015 Nov. 5.83-5.88 UT with the 60-cm, f/3.3 Cichocki telescope. Image scale is 1.25 arc sec/pixel. Copyright © 2015 by J. Vales, Črni Vrh Observatory. PSN J07051005+2102327 was discovered by S. Maticic on 2015 Nov. 12.092 UT and reported in TOCP. Discovery images were taken on 2015 Nov. 12.092-12.126 UT with the 60-cm, f/3.3 Cichocki telescope. Image scale is 2.5 arc sec/pixel. Copyright © 2015 by S. Maticic, Črni Vrh Observatory. 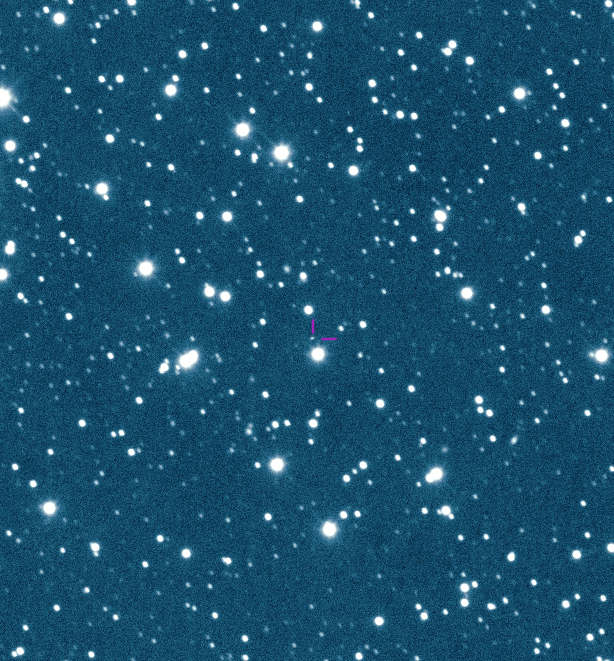 2015 TB145 was discovered on 2015 Oct. 10 by Pan-STARRS1 telescope on Mt. Haleakala, operated by the Institute for Astronomy at the University of Hawaii. It passed 1.27 lunar distances from Earth on 31. October 2015 at 17:01 UTC. Since the closest approach to Earth was best visible from the far east locations, we observed this object a day before, on Oct. 30/31, with 60-cm Cichocki telescope at Črni Vrh Observatory. Trace of NEO 2015 TB145, approaching to Earth on 2015 Oct. 31. 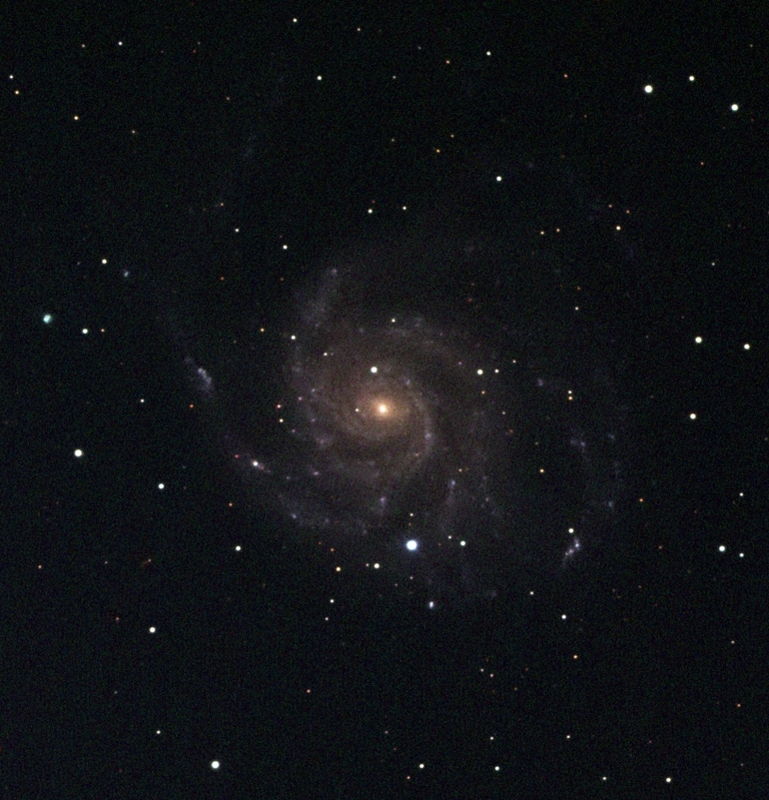 Image was made from a series of 5 second exposures, obtained in strong moonlight conditions during 0h03-0h39UT, with 60-cm Cichocki telescope at Črni Vrh Observatory. Copyright © 2015 by H. Mikuz, Črni Vrh Observatory. Time-lapse animation of 2015 TB145 flyby. The sky has cleared just before the start of eclipse and the all-sky camera at Črni Vrh Observatory recorded this time-lapse sequence of total Lunar eclipse on 2015 Sep. 28 early morning. The animation is composed of total 162 one minute exposures, taken between 01h04 - 3h52UT. Copyright © 2015 Črni Vrh Observatory. The sky became very dark during the eclipse, reaching magnitude 21,5 magnitude at total phase and then slowly rising toward the end of eclipse. Copyright © 2015 Črni Vrh Observatory. Time-lapse video with 1-minute intervals, obtained from Kolovrat mountain on 2015 Sep. 28 (0h54-4h35UT) with 18mm, f/3.5 lens and 0.5s exposures with Canon EOS 650D at ISO 800. Copyright © 2015 by J. Vales, Črni Vrh Observatory. Time-lapse sequence with 4-minute intervals, obtained from Kolovrat mountain on 2015 Sep. 28 (0h57-4h06UT) with 18mm, f/3.5 lens and 0.5s exposures with Canon EOS 650D at ISO 800. Copyright © 2015 by J. Vales, Črni Vrh Observatory. In the early morning hours of 21. 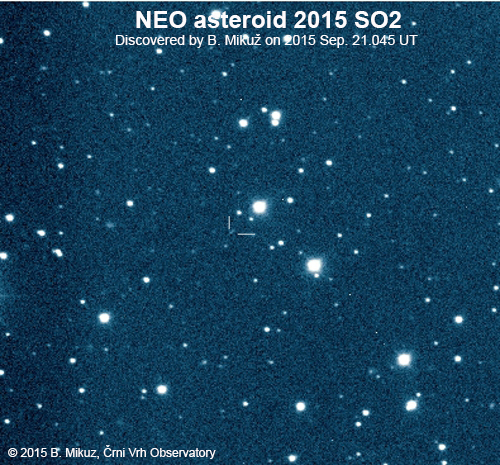 September 2015, a fast moving object has been detected on images taken by B. Mikuz with 60-cm Cichocki telescope. After posting the measurements on NEOCP, the object has been confirmed as NEO by observers from Japan, Czech Republic, Spain, Russia and USA. Astrometric measurements revealed an interesting orbit with a semimajor axis distance similar to that of the Earth, slightly larger eccentricity (e=0.11) and inclination of about 9.2°. The semimajor axis is very close to a=1AU and the asteroid 2015 SO2 was initially classified as Apollo type NEO (a>1AU). However, the latest measurements obtained during the last approach showed that it became the Aten type (i.e. a<1AU). Furthermore, the asteroid 2015 SO2 has nearly the same orbital period than the Earth, i.e. 365.7 days. It became evident that the asteroid 2015 SO2 is an Earths co-orbital asteroid, i.e. in a 1:1 mean-motion resonance with the Earth. 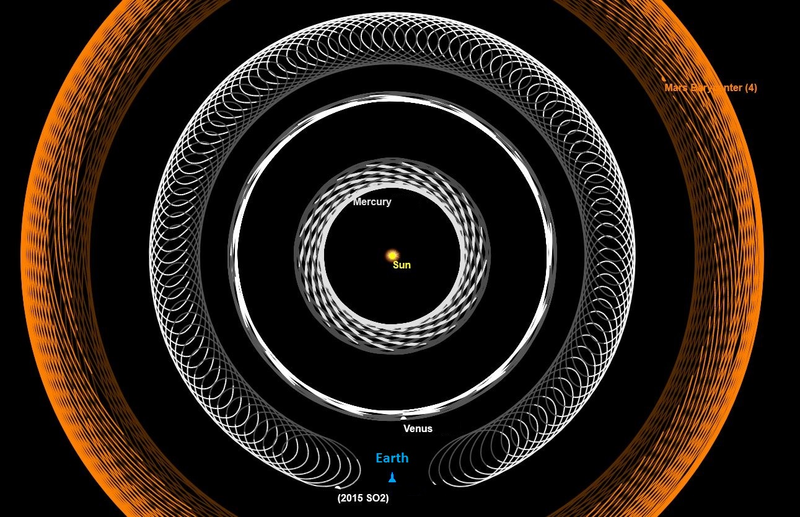 Consequently, the path of the asteroid appears to have a horseshoe shape in a rotating reference frame, which is circulating aroud the Sun with the angular velocity of the Earth. Trace of NEO asteroid 2015 SO2 on one of discovery images, obtained on 2015 Sep. 21 with the 60-cm, f/3.3 Cichocki telescope. Copyright © 2015 by B. Mikuž, Črni Vrh Observatory. Simulations have shown, that approximately every 1500 years the asteroid 2015 SO2 becomes a natural satellite of the Earth, remaining in this orbit for 100-200 years and then returning back to its horseshoe orbit again. This "Sky Dance" of the Earth and asteroid 2015 SO2 is recurring and may last for several 10.000 years. Asteroid 2015 SO2 will remain in the Earth neighborhood for at least 100.000 years. After that, it will most probably lose connection with the Earth due to perturbations of other planets and will choose its own way around the Sun. C. de la Fuente Marcos, R. de la Fuente Marcos; From horseshoe to quasi-satellite and back again: the curious dynamics of Earth co-orbital asteroid 2015 SO2; Astrophysics and Space Science, Volume 361, Issue 1, January 2016. 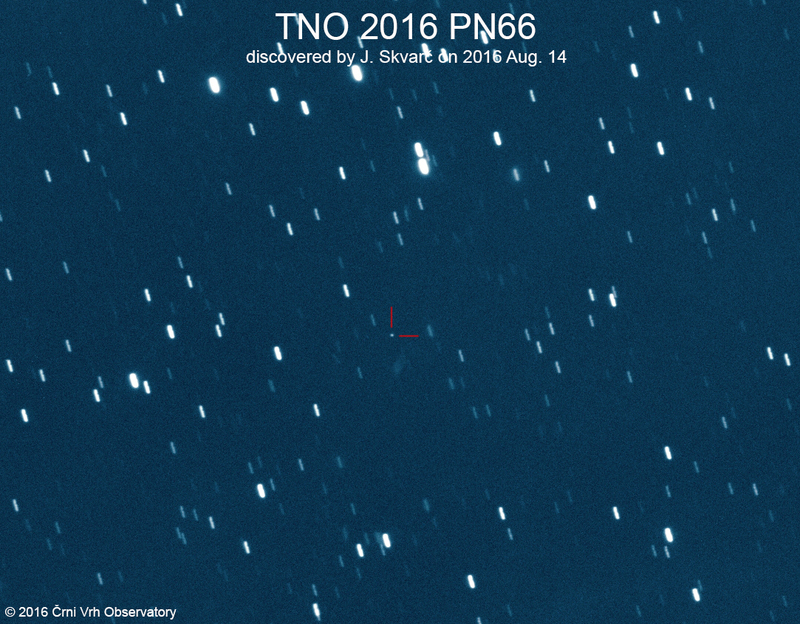 Unusual asteroid 2015 PT was discovered on images taken by J. Vales on 2015 Aug. 6.90 - 6.94UT, in the scope of Comet and Asteroid Search Program PIKA at Črni Vrh Observatory. Discovery was announced in MPEC 2015-P20 According to orbital elements (3.2 AU < a < 4.6 AU), the object was classified as Outer Main-belt Asteroid. Animation, composed of four discovery images, obtained with the 60-cm, f/3.3 Cichocki telescope. Copyright © 2015 by J. Vales, Črni Vrh Observatory. False color image on left is a composition of 5x120 second unfiltered exposures, obtained with 60-cm, f/3.3 Deltagraph telescope, on 2015 Aug. 11 (23h47-23h56UT). Image scale is 1.25 arc sec/pixel. Copyright © 2015 by H. Mikuz, Črni Vrh Observatory. PSN J17520838+1314252 was discovered by S. Maticic from Crni Vrh Observatory on 2015 July 06.976 UT and reported on TOCP. It was confirmed on 2015 July 7.88688UT by G. Masi and P. Catalano (Virtual Telescope Project). Another follow-up observation was made by J. Zakrajsek (Crni Vrh Observatory) on 2015 July 7.9028 UT. 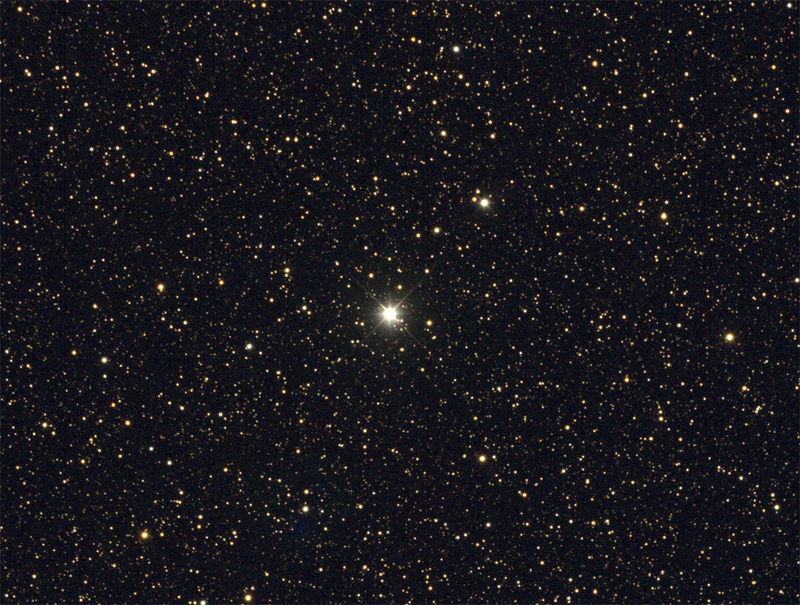 Discovery images were taken on 2015 Aug. 5.829-5.868 UT with the 60-cm, f/3.3 Cichocki telescope. Image scale is 1.25 arc sec/pixel. Copyright © 2015 by J. Skvarč and B. Dintinjana. Apparent supernova was discovered by S. Maticic (mag. 17.1) on four R filter CCD images, taken on 2015 Apr. 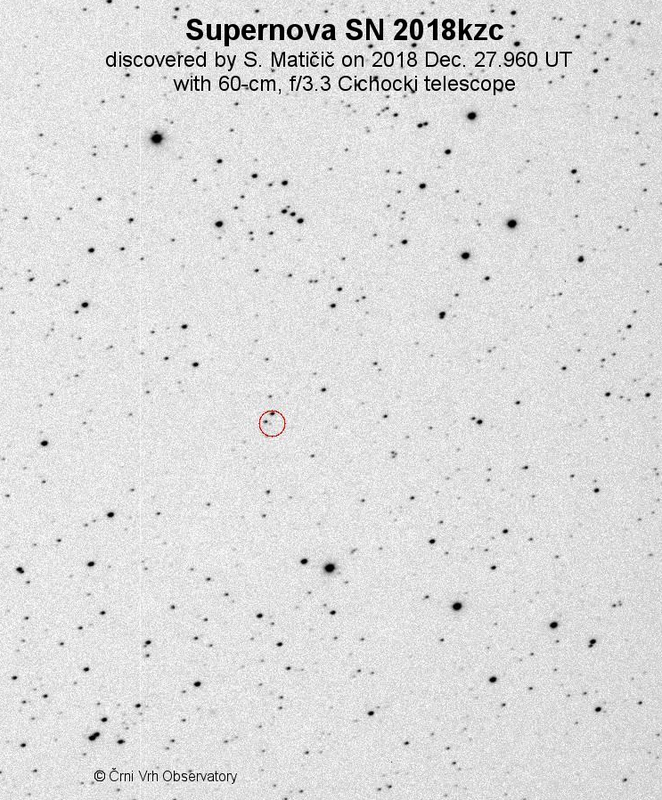 1.925 - 1.956UT with the 60-cm f/3.3 Cichocki reflector in the course of the Comet and Asteroid Search Program (PIKA). The object is at R.A. = 13h33m22s.89, Decl. = +58d43'31".5 (equinox J2000), which is 27" W and 11" N from the center of the apparent host galaxy, catalogued as NPM1G +58.0138. Nothing is visible at this position on several Digitized Sky Survey red and blue images from the Palomar Sky Survey. The object received designation PSN J13332289+5843315 after being posted on IAU TOCP page. The transient was observed on 2015 Apr. 2.8612UT by G. Masi and P. Catalano, remotely using the 17"-f/6.8 robotic unit part of the Virtual Telescope Project facility, at Bellatrix Astronomical Observatory in Ceccano, Italy. A 180-seconds unfiltered exposure show the source at mag. 16.9. Th eobject was also confirmed on 2015 Apr. 2.9043UT by Massimiliano Martignoni - Observatory: Stazione Astronomica Betelgeuse (B75) in Magnago, Italy with 0.25-m, f/10 Schmidt-Cassegrain telescope. 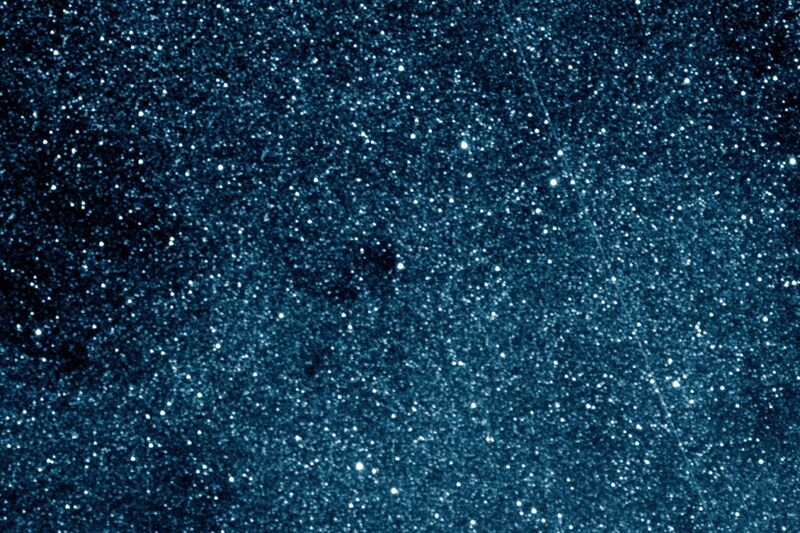 Discovery images were taken on 2015 Apr. 1.925 - 1.956UT with the 60-cm, f/3.3 Cichocki telescope. Image scale is 1.25 arc sec/pixel. Copyright © 2015 by S. Maticic. The supernova was confirmed in Astronomer's Telegram 7403 by A. Piascik, I. A. Steele and D. Kopač (Liverpool John Moores University) and A. Gomboc (University of Ljubljana). 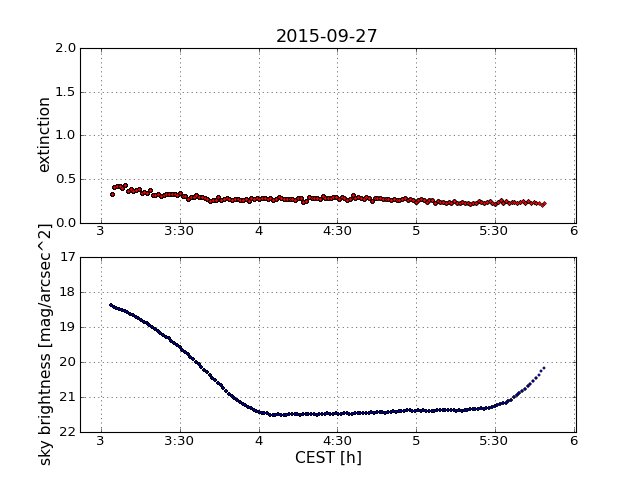 They used a 2-m Liverpool Telescope (+ SPRAT spectroscope) on La Palma and on 2015 Apr. 16 (1:24UT) obtained a low resolution spectrum in visible 400-800nm wavelength. Classification using SNID indicates that it is a normal type Ia supernova with a close match to the spectrum of SN2004er. Age was estimated at +19 days post maximum. Further CCD photometry of PSN J13332289+5843315 by J. Japelj (University of Ljubljana), using data from the Liverpool Telescope, obtained in Sloan g,r,i,z photometric system. On 2015 Mar. 13.88 - 13.92UT, NEO asteroid 2015 EC7 was discovered on images taken by H. Mikuz in the scope of Comet and Asteroid Search Program PIKA at Črni Vrh Observatory. The first follow-up observations were collected on the evening of Mar. 14 in rather difficult weather conditions, through the gap in clouds by Jure Skvarč at Črni Vrh Observatory. After posting on Minor Planet Center NEO Confirmation Page, additional follow-up observations were collected from observers worldwide. Discovery was announced in MPEC 2015-F05 According to orbital elements, the object belongs to the Apollo family of asteroids. Animation, composed of four discovery images, obtained with the 60-cm, f/3.3 Cichocki telescope. 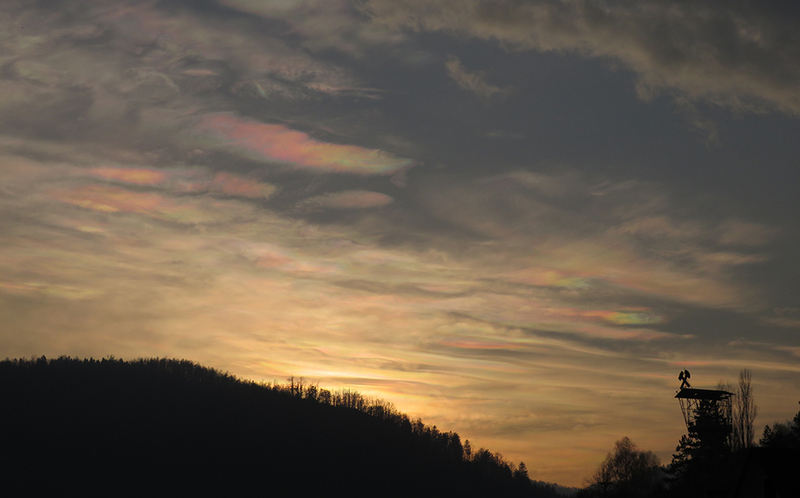 Copyright © 2015 by H. Mikuz, Črni Vrh Observatory, Slovenia. On the night between the 11th and 12th of March 2015 a small asteroid has flown past the Earth at the distance of only 100000 kilometres. It was discovered by Mt. Lemmon Survey on 2015 Mar. 11.40476UT. In only few hours it has accelerated and brightened significantly, just to get into obscurity, possibly for ever. The asteroid starts as tiny dot just below the centre of the right image and drifts gradually downwards. Due to a software glitch, a correction which was meant to bring it back to the centre was not applied and the asteroid was subsequently lost. Nevertheless, the telescope kept tracking at the rate of the asteroid movement, just to illustrate the effect of sky motion. Towards the end, when the asteroid would be too faint again, the clouds rolled in and the observations were terminated. Copyright © 2015 by J. Skvarč, Črni Vrh Observatory. 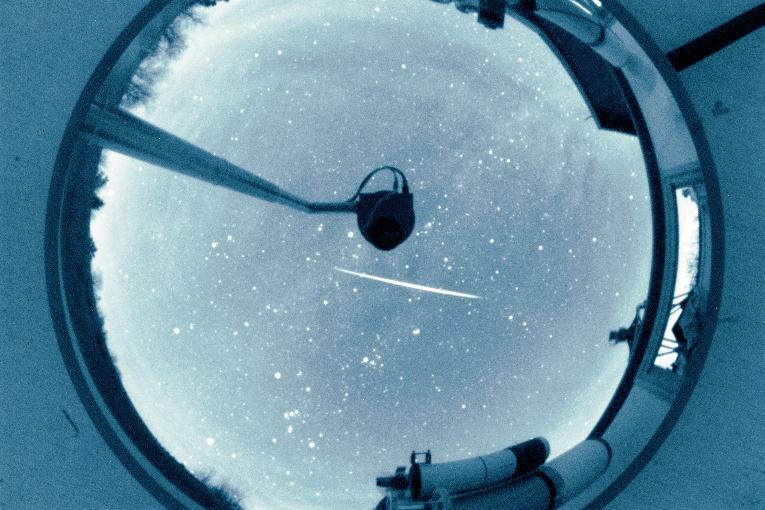 Two bright fireballs were recorded on 2014 Oct. 28 and 30 with Črni Vrh Observatory All-Sky Camera. 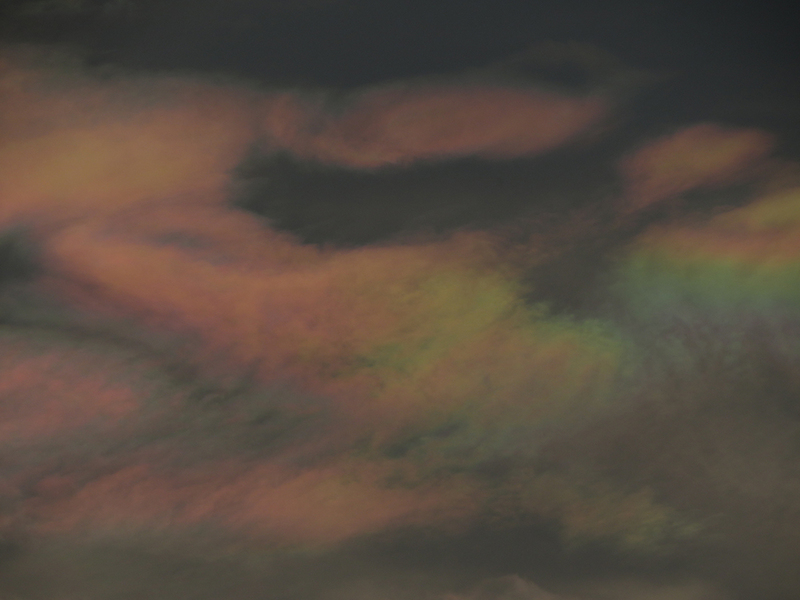 The event of Oct. 28 also left a fast moving, long lasting afterglow in the upper atmosphere. 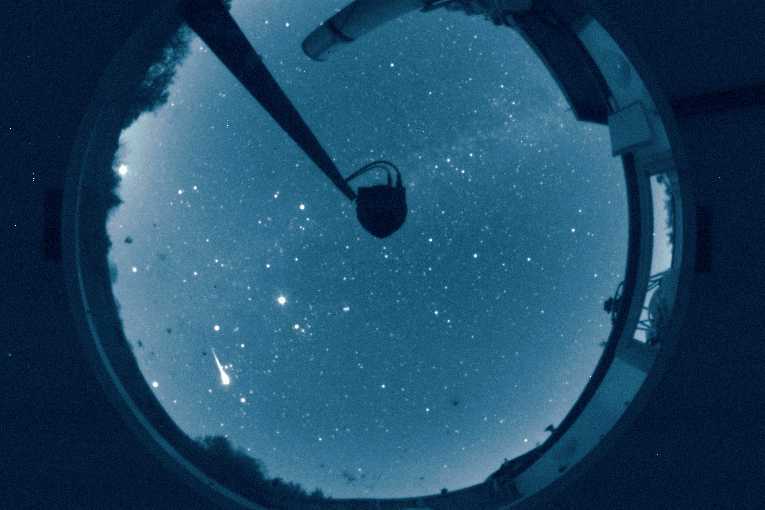 All-sky camera at Črni Vrh Observatory recorded about -7 magnitude fireball on 2014 Oct. 28, at around 21h03UT with afterglow, lasting for about half an hour. Animation is covering the time interval 21:02:54 - 21:31:03 UT. Copyright © 2014 by J. Vales and PIKA project, Črni Vrh Observatory. Another fireball was recorded on 2014 Oct. 30 at 21:44:19UT +/-30s. Copyright © 2014 by PIKA project, Črni Vrh Observatory. Possible nova was discovered by MASTER-Amur auto-detection system as OT source J175924.12+252031.7 at (RA = 17h 59m 24.12s; Dec = +25d 20m 31.7s on 2014 Apr. 9.75507 UT at unfiltered magnitude 12.8m (ATel 6059). 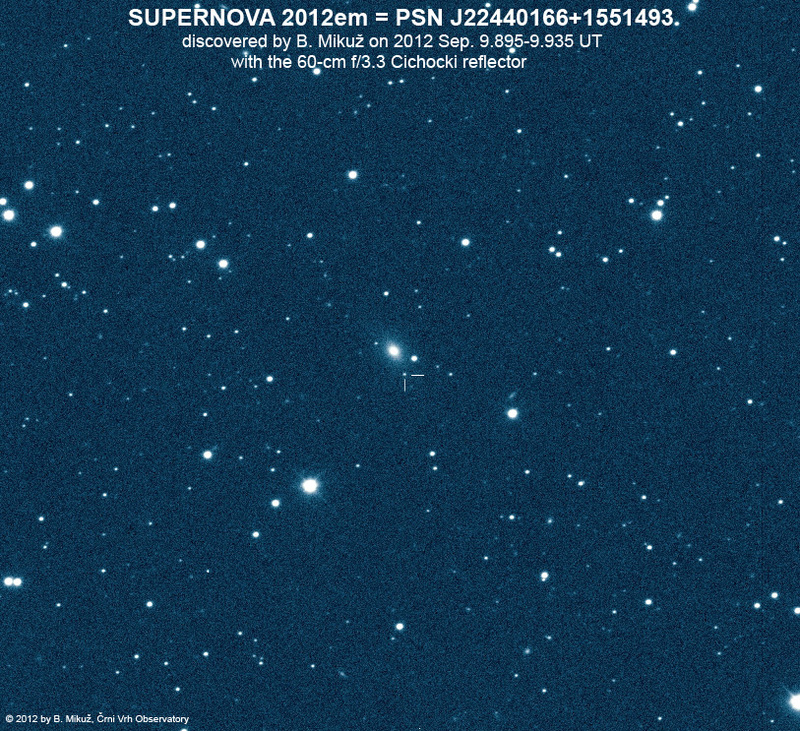 Prediscovery images of possible nova in Hercules, obtained on 2014 Mar. 29, 30, Apr. 7 and 8 with 105 mm f.l., f/4 camera lens + AP16E CCD + Rc photometric filter. Images taken on Apr. 7-8 show this object already in outburst. Image scale is about 17 arc sec/pixel. Copyright © 2014 by Črni Vrh Observatory. We obtained the prediscovery photometry of this object from images taken in the course of Crni Vrh Observatory Wide Field Sky Survey with the 105 mm f.l., f/4 camera lens + AP16E CCD + Rc photometric filter by B. Mikuz, S. Maticic and J. Skvarc. Photometry was performed by B. Dintinjana on several co-added 60 second consecutive exposures. Object is clearly present on Apr. 7 and 8 co-added images. The transient was detected also by the All Sky Automated Survey for SuperNovae (ASAS-SN or "Assassin"), using data from the quadruple 14-cm "Brutus" telescope in Haleakala (ATel 6061). Novo sta odkrila Japonska astronoma amaterja Koichi Nishiyama in Fujio Kabashima na dveh 40-s CCD posnetkih, narejenih 31. marca 2014 okoli 0,790 UT s 105-mm, f/4 objektivom in kamero SBIG STL6303E. Ob odkritju je bil izmerjeni sij 10,9 magnitude. Njuno iskanje nov kot vse kaže poteka zelo hitro, tako da sta prisotnost objekta potrdila še isti večer 31. marca ob 0,820 UT. Tokrat sta uporabila precej večji Meade 0.40-m f/9.8 reflektor in kamero SBIG STL1001E. Izmerjene koordinate objekta so RA = 20h21m42s.34, Dec = +31d03'29".6 (epoha 2000.0). Na njunih prejšnjih posnetkih tega polja dne 27. marca na tem mestu ni nobenega objekta do mejne magnitude posnetka 13,4. Prav tako na tem mestu ni ničesar na Digitaliziranih Palomarskih posnetkih neba. Sta pa objekt opazila na posnetku, narejenem 30. marca ob 0,769 UT, ko je imel sij 12,4 magnitude. Objekt je zatem potrdilo še več amaterskih astronomov in sicer: 1. aprila ob 0,103 UT Gianluca Masi, Francesca Nocentini in Patrick Schmeer daljinsko s 43-cm teleskopom + CCD blizu kraja Ceccano v Italiji; istega dne ob 0,109 UT, 11,2 magnitude (Wolfgang Vollmann, Dunaj, Avstrija; vizualno z 0.20-m reflektorjem); 2. aprila ob 0,177 UT, 11.0 (Patrick Schmeer, Bischmisheim, Nemčija; vizualno z 0.20-m Schmidt-Cassegrain reflektorjem). Na Astronomskem observatoriju Črni Vrh smo v okviru programa pregledovanja neba s panoramsko kamero (105 mm f. l., f/4 objektiv + AP16E CCD + Rc fotometrični filter) polje nove posneli v kar 6 nočeh pred odkritjem in naredili fotometrijo. Vsako noč posname kamera 4 zaporedne slike istega dela neba z osvetlitvijo 60 sekund. Za izboljšanje razmerja signal/šum smo najprej sešteli slike posameznih noči in nato s programom IRAF naredili fotometrijo. Več o Novi Laboda 2014. Supernovo v galaksiji M82 je 21. januarja 2014 odkril Stephen J. Fossey (Observatorij Univerze v Londonu) s skupino njegovih študentov med izvajanjem praktikuma s 35-cm avtomatskim teleskopom iz kraja Mill Hill, ki se nahaja na severnem obrobju Londona. Ker se je bližalo poslabšanje vremena jim je mentor namesto predvidenih vaj raje demonstriral delovanje avtomatiziranega 35-cm teleskopa. Študenti so si za opazovanje izbrali lepo in fotogenično galaksijo M82 v ozvezdju Veliki medved. Že na prvih posnetkih je Fossley sredi galaksije opazil zvezdo, ki jo pri prejšnjih opazovanjih ni bilo na tem mestu. Eksplozija tako svetle supernove v bližnji galaksiji je zanimiv dogodek za astronome in vse, astronomske navdušence. Ker je večina Slovenije že več tednov pokrita z oblaki smo se člani Društva Temno nebo Slovenije odpravili na opazovanje supernove na sosednjo Avstrijsko koroško, kjer smo na višini preko 1000 metrov uživali pod čudovitim jasnim in neverjetno temnim nebom, ki ga žal zaradi velikega svetlobnega onesnaževanja ni več nikjer v Sloveniji. Več o eksploziji supernove 2014J v galaksiji M82. Bližnje srečanje s Soncem je bilo, za komet ISON usodno, saj je zaradi močnih plimskih sil in intenzivnega segrevanja jedro kometa razpadlo. Razpad kometa je bilo mogoče spremljati na posnetkih koronografov LASCO C2 in C3, na krovu satelita SOHO, ki neprestano opazuje Sonce in sproti pošilja na Zemljo podatke in slike. V novembru in decembru 2013 so bili na jutranjem nebu še trije drugi kometi. Med njimi je bil najsvetlejši komet C/2013 R1 (Lovejoy), ki je dosegel sij okoli 4. magnitude in je bil med vsemi kometi najsvetlejši. Več o dogajanju v zvezi z navedenimi kometi je na spodnjih spletnih povezavah. 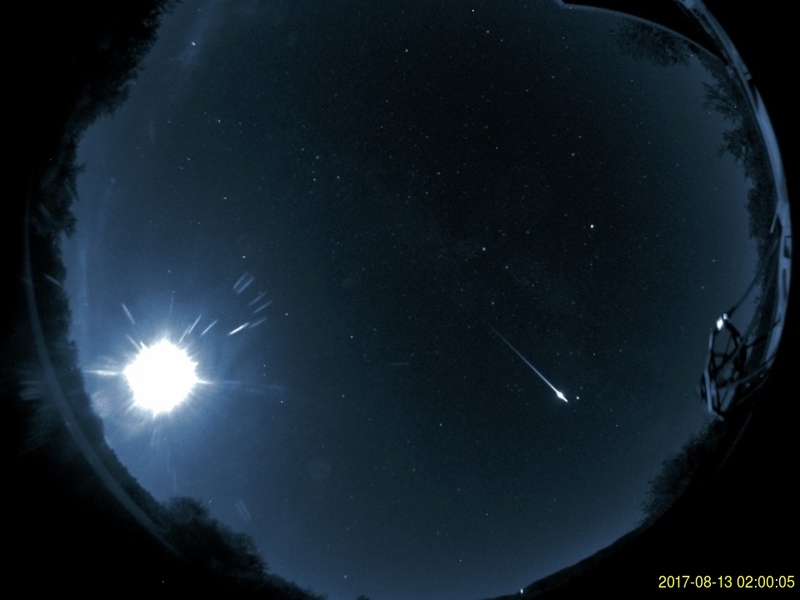 A very bright fireball has been observed in early morning of 2013 September 3 over the Slovenia, Croatia and Northern Italy. 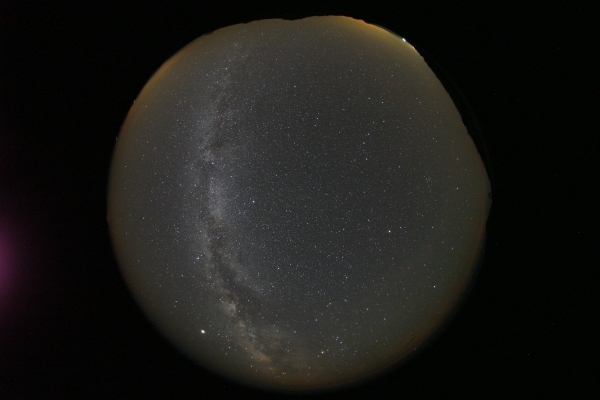 The event was imaged with the all-sky camera at Črni Vrh Observatory in Slovenia. The fireball flash, apparently exceeding the brightness of Full Moon, was recorded at about 0h13UT, leaving a residual trail of ionized gas for at least 6 minutes. 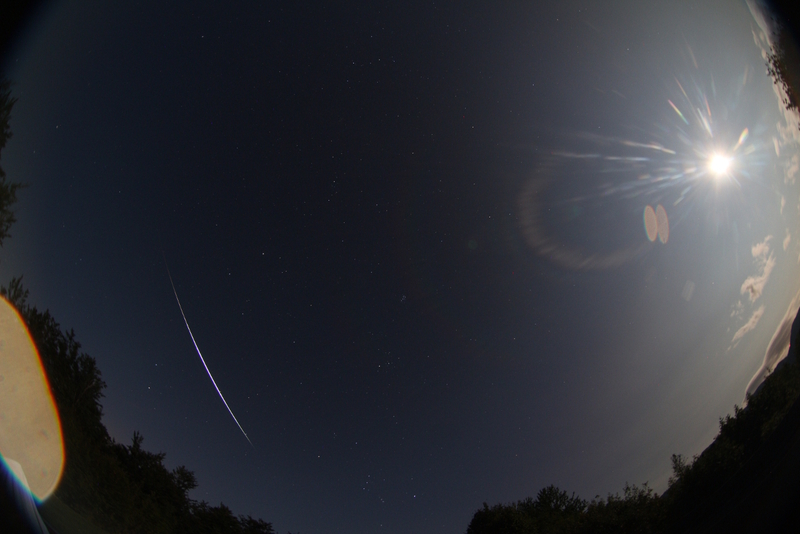 Just 12 minutes later, another bright fireball was recorded on the same part of sky. The flash of light was so bright that the trail of fireball on CCD image is completely saturated. The animation is composed of 15 images, each lasting for 1 minute and covering the time span of 0h05-0h20UT around the fireball fall. The All-sky Camera at Črni Vrh Observatory is operating on every clear night and record meteors and fireballs on daily basis. See our extensive archive of night sky animations and events since the start of night sky imaging in 2004. Copyright © 2013 Črni Vrh Observatory. Movie of the night sky on 2013 Sep. 2-3, 18h23-3h17 UT with bright fireballs appearing around 0h12 and 0h24UT. Copyright © J. Skvarč, Črni Vrh Observatory. When discovered by K. Itakagi (CBET 3628) on Aug. 14.584 UT it was already at unfiltered magnitude 6.8. According to U. Munari et al. in ATel #5304 and ATel #5297 the rise toward maximum of Nova Del 2013 was extremely fast. 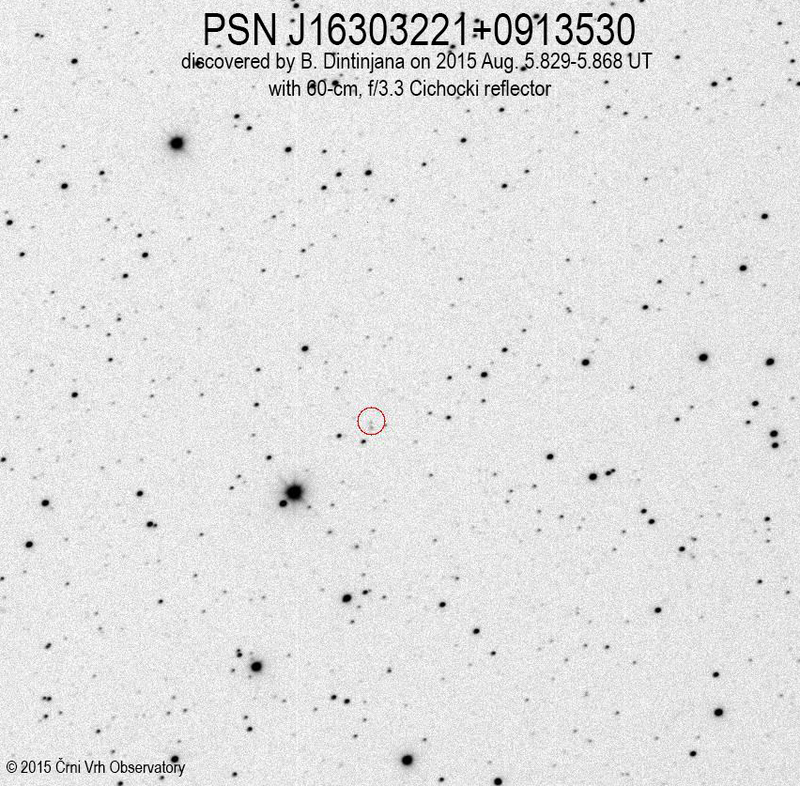 On unfiltered pre-discovery images for Aug 13.998 UT by Denisenko et al. (CBET 3628), the nova was still at 17.1 mag, close to its quiescence value (the average magnitude of the progenitor on Palomar I and II plates is B=17.3 and R=17.6 according to USNO-B1 catalog data, and V=16.9 following GSC ver 2.3.2). During the 30 hours following the optical discovery, the rate of rise progressively slowed, until the nova reached V=5.3 on Aug 15.85 when a fast and final rise toward maximum begun (at a 2.5 mag/day rate). They estimate that maximum was reached on Aug 16.25 at V=4.3. In the scope of the Wide Field Sky Survey Program with 4,0/105mm lens and Apogee U16M CCD camera at Črni Vrh Observatory, the field of Nova Del 2013 has been imaged around Aug. 12.9205UT on four 60-second consecutive R-band exposures, 40 hours before the discovery by K. Itagaki. Nothing is visible at the position of nova down to a limiting magnitude about 13. Unfortunately, we missed the discovery due to cloudy period on next two nights. The same field was imaged again on Aug. 15.9507UT with nova in full outburst at magnitude V=5.3. See the images below. Animation composed from two R-filter 60-second exposures with 4,0/105mm lens and Apogee U16M CCD on 2013 Aug. 12.9205UT (prior to discovery) and 2013 Aug. 15.9507UT with nova in full outburst at magnitude V=5.3. Image scale is 17.6 arc sec/pixel. Copyright © 2013 by H. Mikuz, Črni Vrh Observatory. True color image of Nova Del 2013, obtained on 2013 Aug. 15 (22h28-22h29UT) with 60-cm f/3.3 Cichocki reflector and standard BVR+L filters. Exposure times was 10s in each filter. Image scale is 2.50 arc sec/pixel. Copyright © 2013 by H. Mikuz, Črni Vrh Observatory. True color image of Nova Del 2013, obtained on 2013 Sep. 6 (21h18UT) with 60-cm f/3.3 Cichocki reflector and standard BVR+L filters. Exposure times was 10s in each filter. Image scale is 2.50 arc sec/pixel. Copyright © 2013 by H. Mikuz, Črni Vrh Observatory. 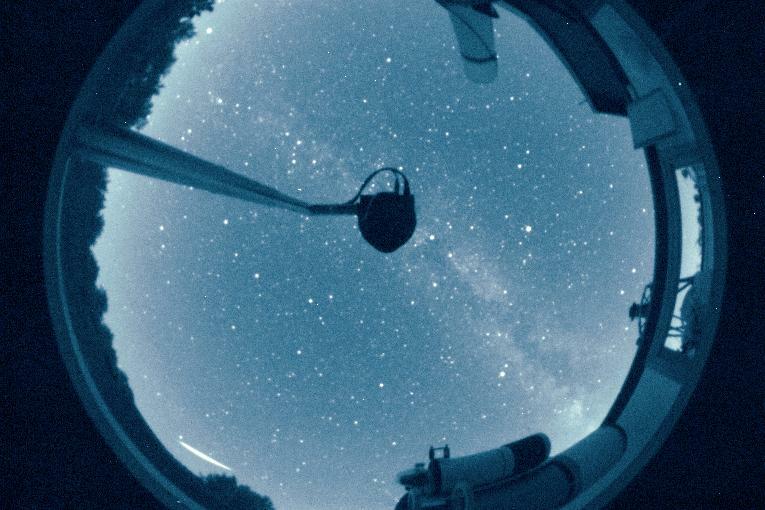 On the night of maximum activity, three bright Perseids were recorded with Črni Vrh Observatory All-Sky Camera. The sky conditions were excellent throughout the night. The sky brightness was around 21.3 to 21.4 magnitude. Report. 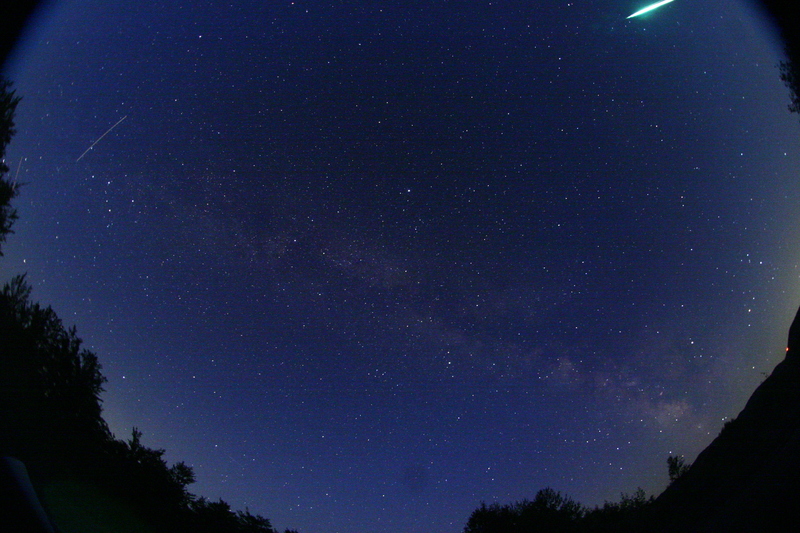 Perseid meteor recorded on 2013 Aug. 13 around 1h16m34s UT. Copyright © 2013 by H. Mikuz, Črni Vrh Observatory. 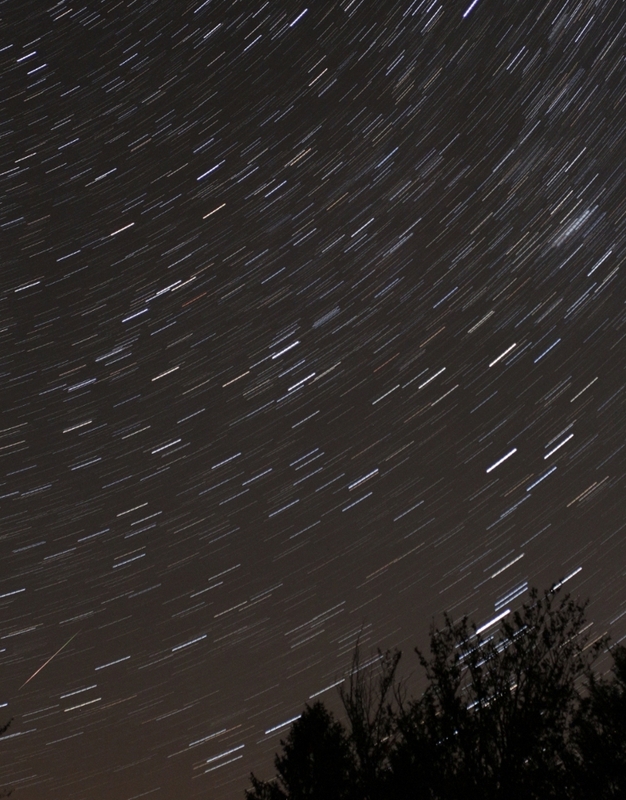 Image of star trails with Perseid meteor, taken on 2013 Aug. 12 around 22h15UT with 40mm, f/4 lens and Canon EOS 650D camera. 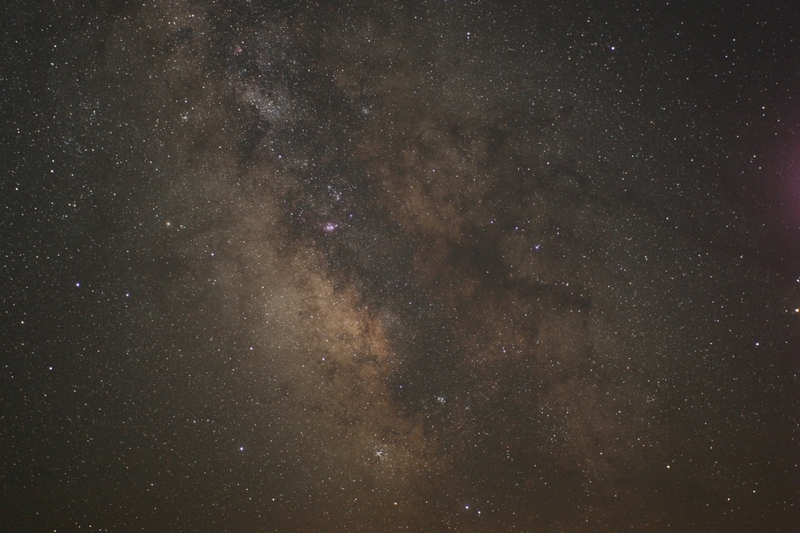 Copyright © 2013 by J. Vales, Črni Vrh Observatory. 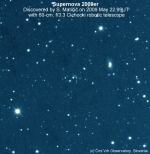 H. Mikuz, Crni Vrh Observatory, report the discovery of an apparent supernova (mag 18.5) on four unfiltered CCD images (bandpass roughly equivalent to the R band) taken during 2013 July 30.882-30.913 UT with the 60-cm f/3.3 Cichocki reflector in the course of the Comet and Asteroid Search Program (PIKA). The object is located at R.A. = 17h33m15s.73, Decl. = +36d28'35".2 (equinox 2000.0), which is approximately 6" east and 18" north of the center of the apparent host galaxy. Nothing is visible at this position on archival PIKA images obtained on 2013 June 19 and 2011 Mar. 23 (limiting R-band magnitudes about 19.5) or on several Digitized Sky Survey red and blue images from the Palomar Sky Survey. Composite 4x60 seconds image of supernova was made from unfiltered discovery frames taken around 2013 Jul. 30.90 UT with 60-cm, f/3.3 Deltagraph telescope. Image scale is 1.25 arc sec/pixel. Copyright © 2013 by H. Mikuz, Črni Vrh Observatory. Discovery was announced in CBET Electronic Telegram No. 3616. Spectroscopic observations, obtained on July 31.84 and Aug. 1.92 UT by L. Tomasella, S. Benetti, E. Cappellaro, P. Ochner, A. Pastorello, and M. Turatto, Osservatorio Astronomico di Padova, Istituto Nazionale di Astrofisica, with the Asiago 1.82-m Copernico Telescope (+ AFOSC), show a blue continuum with broad P-Cyg lines of H-alpha, H-beta, and He I 587.6-nm, indicating that the object is a type-II supernova shortly after explosion. On 2013 July 15.044UT, NEO asteroid 2013 NX23 was discovered on images taken by Stanislav Matičič in the scope of Comet and Asteroid Search Program PIKA at Črni Vrh Observatory. After posting on Minor Planet Center NEO Confirmation Page, follow-up observations were collected from observers worldwide. Discovery was announced in MPEC 2013-O21. According to orbital elements, the object belongs to the Apollo family of asteroids. 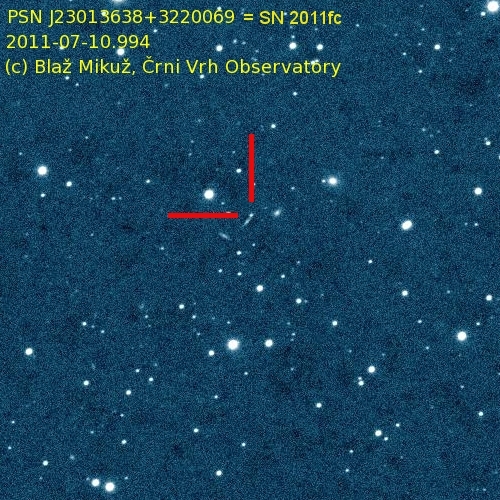 On 2013 June 18.05UT, NEO asteroid 2013 MX5 was discovered on images taken by Stanislav Matičič in the scope of Comet and Asteroid Search Program PIKA at Črni Vrh Observatory. After posting on Minor Planet Center NEO Confirmation Page, follow-up observations were collected from observers worldwide. Discovery was announced in MPEC 2013-M26. According to orbital elements, the object belongs to the Amor family of asteroids. Animation, composed of four discovery images, obtained with the 60-cm, f/3.3 Cichocki telescope. Copyright © 2013 by S. Matičič, Črni Vrh Observatory, Slovenia. The only parial Lunar eclipse of 2013 occured on 2013 April 25 between 19:54:08UT - 20:21:02UT, with maximum eclipse at 20:07:30UT, when the umbral phase magnitude reached 1.47%. 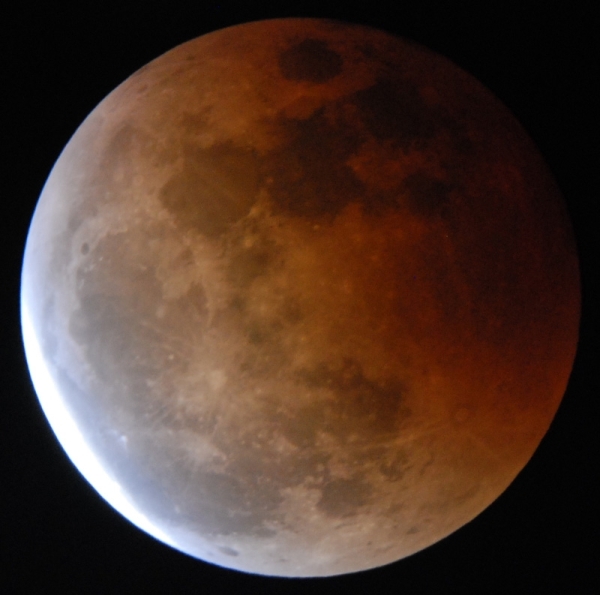 At the same time, the penumbral magnitude reached 98.65%. More details on Fred Espenak NASA Eclipse web site. The eclipse images were taken from Črni Vrh Observatory on April 25 at 19:20h UT to 21:13h UT with a 150 mm f/10 Celestron NexStar 6 SE telescope and Canon EOS650D camera. The movie is composed of 114 images taken in 1 minute intervals, sensitivity set to ISO 200 and exposure time 1/200 sec. The total duration of the eclipse in the movie was 1 hour and 57 minutes. Because the telescope was on alt-az mount, the image field is rotating slowly. Copyright © 2013 by J. Vales, Črni Vrh Observatory. Due to cloudy weather at Črni Vrh Observatory the flyby of NEO asteroid 2012 DA14 was observed from a Karst region of Western Slovenia, where the sky was quite clear and with the New Moon. The object has been monitored for 70 minutes (20h20-21h30UT), when passing the Earth at a distance of about 30.000 kilometers. Prior to closest approach to Earth in 2013, 2012 DA14 was an Apollo class NEO asteroid with orbital period of 366 days. After encounter, the orbital period was reduced to 317 days and its aphelion was reduced from 1.110 to 0.9917 AU, leaving it almost entirely inside Earth's orbit. It now belongs to Aten group of NEOs. Time lapse video of NEO asteroid 2012 DA14 flyby, obtained on 2013 Feb. 15 (20h43-21h50UT) with the Canon EOS 650D camera (ISO 1600) and 50mm f/4.5 lens on a guided mount. Altogether 66 exposures of 1 minute duration were obtained and composed into a video animation. Durind the observation, asteroid moved for about 20 degrees and left a short trail on each exposure due to the fast apparent motion. As the object is quickly receding from the Earth, the trails are progressively shorter and fainter. The image field size is about 23x17 degrees. Observations were carried out from village Pliskovica in a Karst region of W Slovenia. 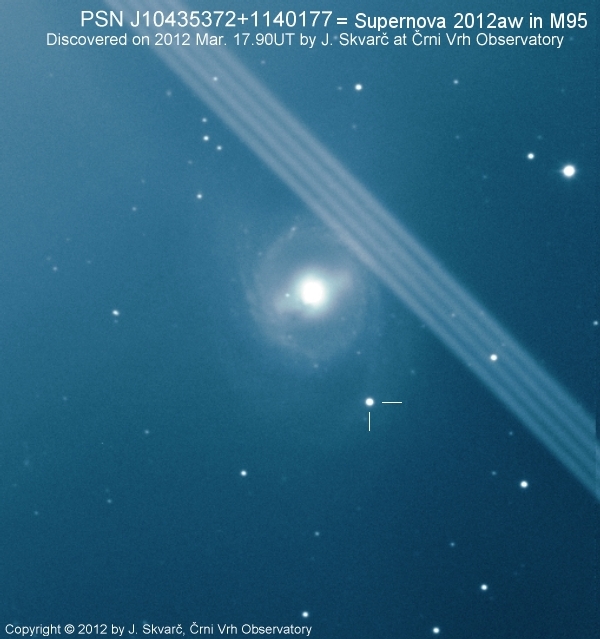 Copyright © 2013 by H. Mikuz and J. Vales, Črni Vrh Observatory. Best watched full-screen, because the asteroid trail is very faint. Image of NE sky with NEO asteroid 2012 DA14 flyby (insert), obtained on 2013 Feb. 15 (20h57UT) with Nikon D5000 camera and 50mm f.2 lens on a fixed tripod. Exposure time was 108s with ISO set to 3200. 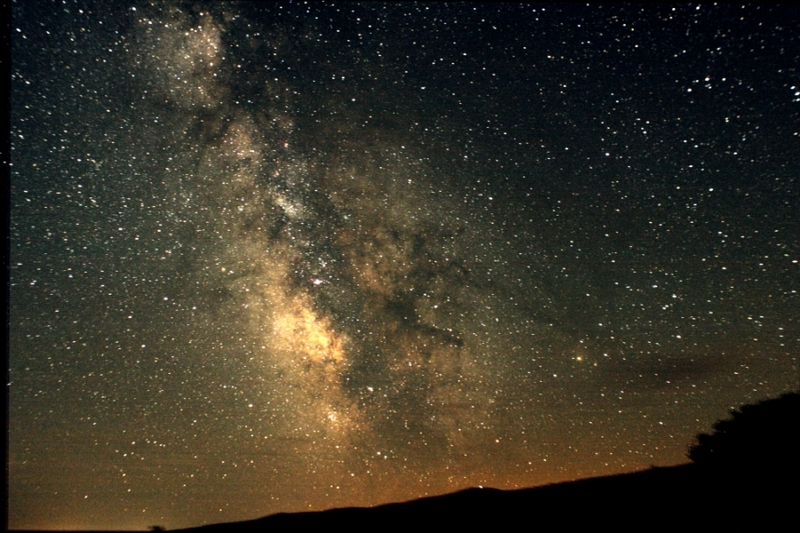 Copyright © 2013 by Primož Kuk, Voglarji Observatory. Image of NE sky with NEO asteroid 2012 DA14 flyby (insert), obtained on 2013 Feb. 15 (21h03UT) with Nikon D5000 camera and 18mm f.2 lens mounted on a fixed tripod. Exposure time was 118s with ISO set to 3200. 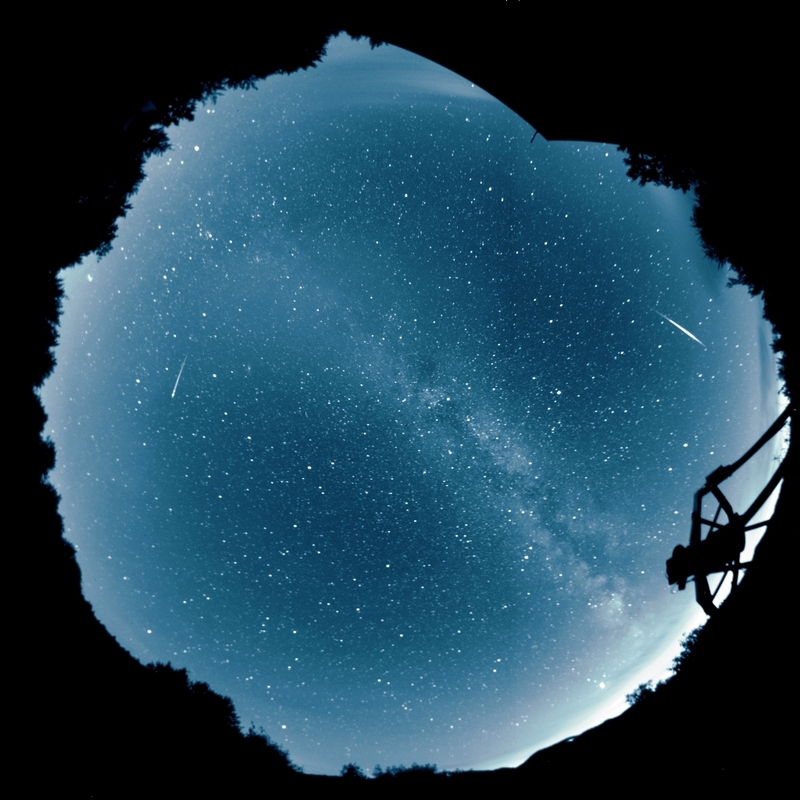 Copyright © 2013 by Primož Kuk, Voglarji Observatory. 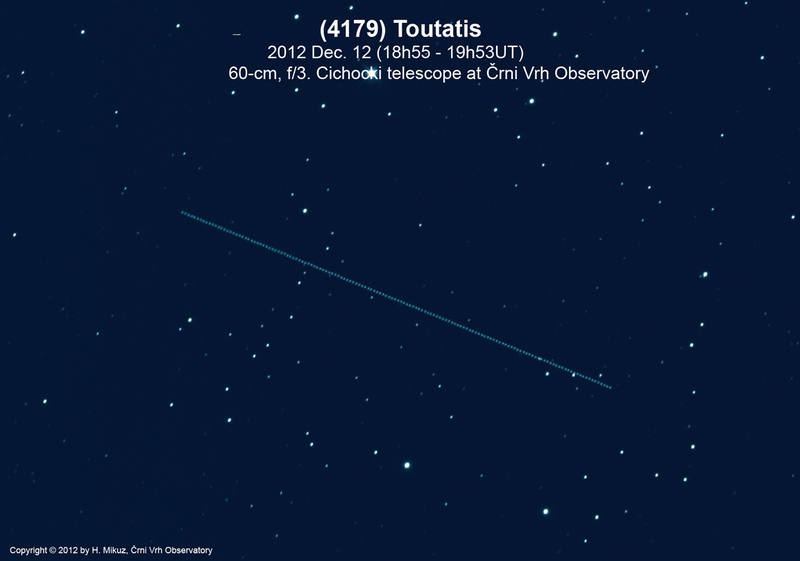 Using 60-cm Cichocki robotic telescope at Črni Vrh Observatory we imaged the flyby of NEO asteroid 4179 Toutatis on 2012 December 12. The object has been monitored for about one hour (18h55-19h53UT), when passing the Earth at a distance of about 7 million kilometers. Toutatis is an Apollo and Mars-crosser asteroid with orbital period 4.02 years. On December 13, the Chinese lunar probe Chang'e 2, flew by Toutatis at a distance of only 3.2 kilometers and imaged it successfully. The images for this animation were taken using a 60-cm, f/3.3 Cichocki telescope from the Črni Vrh Observatory on 12 December 2012 evening. Each exposure was of 10 seconds. The entire sequence lasted 58 minutes, during which 144 exposures were made. During the observed period, the object apparent sky motion was about 20 arc sec/min. At the time the asteroid was about 7 million km from Earth. Copyright © 2012 by B. Dintinjana, H. Mikuž and J. Vales, Črni Vrh Observatory. NEO asteroid 4179 Toutatis as imaged on 2012 Dec. 12 (18h55-19h53UT) with 10 second exposures and R filter. Altogether, 144 connsecutive images were combined into a single frame. Copyright © 2012 by H. Mikuž, Črni Vrh Observatory. 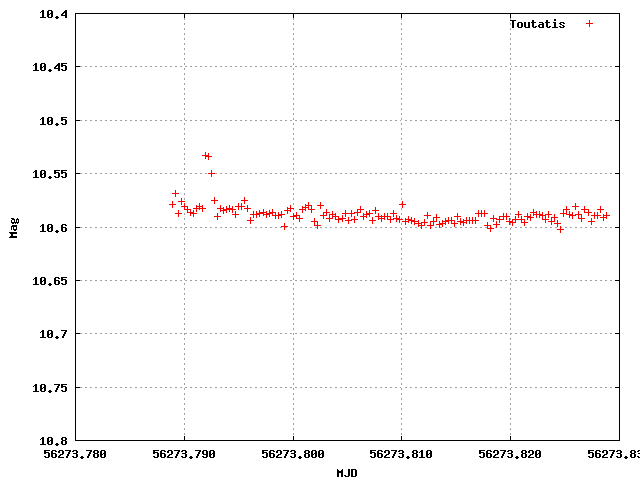 Light curve of 4179 Toutatis, obtained from R filter data images on 2012 Dec. 12 (18h55-19h53UT). Since the rotational period is 5-7 days, the object show very small if any variations during the time span of observation. The object magnitude was around magnitude 10.6. Copyright © 2012 by B. Dintinjana, Črni Vrh Observatory. On 2012 Sep. 17 (4h 29m 22s UT +/-60s) the All-sky camera at Črni Vrh Observatory recorded about magnitude -10 fireball above the eastern horizon, apparently exploding just in front of M42 nebula in Orion. The fireball left a prominent cloud of dust and glowing gas, moving toward the east and lasting up to 50 minutes after the explosion. 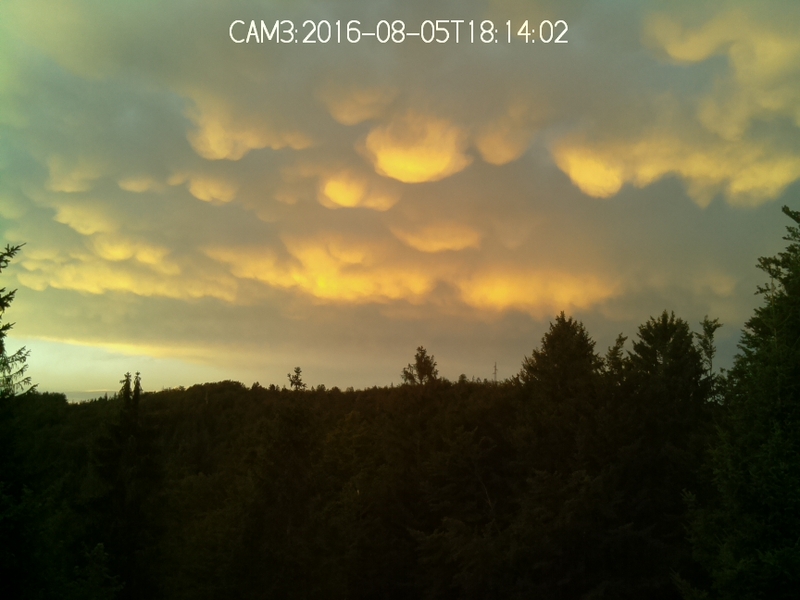 The whole event is recorded on this time-lapse movie, composed by Jan Vales. Planet Venus is entering frame in the upper left corner. Copyright © 2012 by J. Vales, Črni Vrh Observatory. H. Mikuz, Crni Vrh Observatory, reports the discovery by Blaz Mikuz of an apparent supernova (mag 18.3) on four unfiltered CCD images (bandpass roughly equivalent to the R band) taken during Sept. 9.895-9.935 UT with the 60-cm f/3.3 Cichocki reflector in the course of the Comet and Asteroid Search Program (PIKA). The object is located at R.A. = 22h44m01s.66, Decl. = +15d51'49".3 (equinox 2000.0), which is 14" west and 29" south of the center of galaxy PGC 69614. 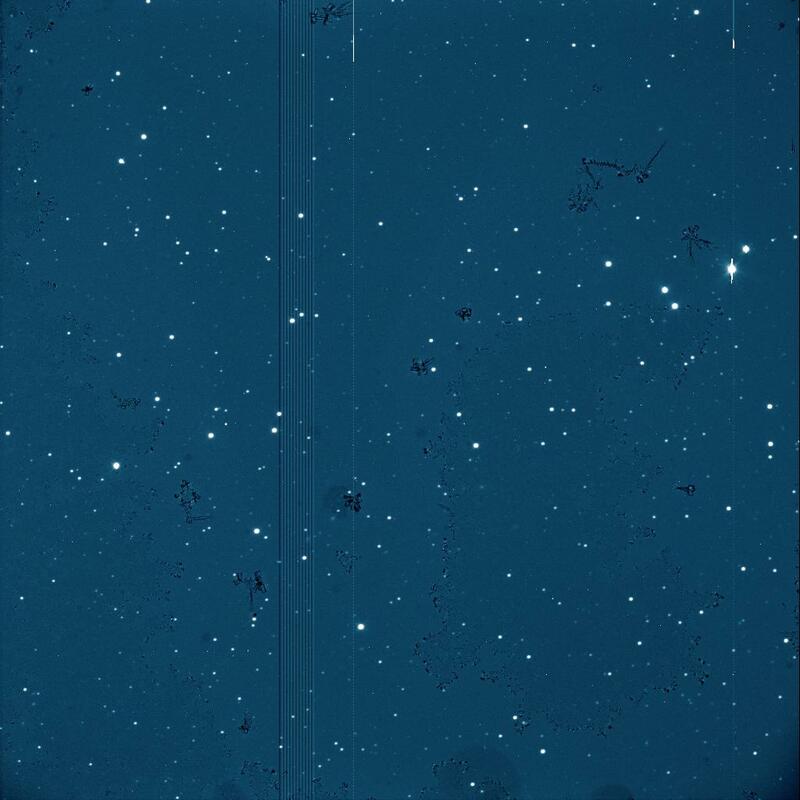 Nothing is visible at this position on archival PIKA images obtained on six nights between 2005 June 16 and 2011 Aug. 2 (limiting mag about 19.0-19.5) or on several Digitized Sky Survey red and blue images from the Palomar Sky Survey. Composite 4x60 seconds image of supernova was made from unfiltered discovery frames taken around 2012 Sep. 9.90 UT with 60-cm, f/3.3 Deltagraph telescope. Image scale is 1.25 arc sec/pixel. Copyright © 2012 by B. Mikuz, Črni Vrh Observatory. Discovery was announced in CBET Electronic Telegram No. 3217. Spectroscopic observations, obtained on 2012 Sept. 10.95 UT by S. Benetti, L. Tomasella, E. Cappellaro, A. Pastorello, M. Turatto, and S. Valenti, at Osservatorio Astronomico di Padova, Istituto Nazionale di Astrofisica, 1.82-m Copernico telescope (+ Afosc spectrograph; range 350-820 nm, resolution 1.3 nm), shows it to be a peculiar type-Ia supernova. 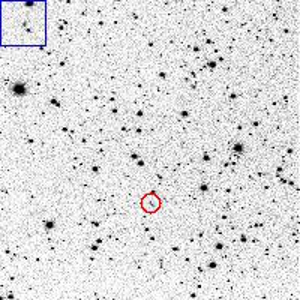 On 2012 September 8.85UT, NEO asteroid 2012 RH3 was discovered on images taken by Jure Skvarč in the scope of Comet and Asteroid Search Program PIKA at Črni Vrh Observatory. After posting on Minor Planet Center NEO Confirmation Page, follow-up observations were collected from observers worldwide. Discovery was announced in MPEC 2012-R25. According to orbital elements, the object belongs to the Amor family of asteroids. Animation, composed of four discovery images, obtained with the 60-cm, f/3.3 Cichocki telescope. Copyright © 2012 by J. Skvarč, Črni Vrh Observatory, Slovenia. We observed optical afterlow of Gamma Ray Burst GRB 120326A (Swift trigger 518626) using 60-cm Cichocki robotic telescope at Črni Vrh Observatory. The series of twenty 60 second exposures with R filter started at 1:27:50UT, 440 seconds after the burst. We confirm optical afterglow at coordinates by C. Guidorzi (GCN 13111). The object was clearly detected on all 20 frames. Complete results are published in GCN 13113 Circular. Time lapse movie, showing GRB 120326A during the outburst at mag. 18.5 - 20.0, 440 seconds after the Swift GRB detection. Series of one minute exposures with Rc filter were obtained on 2012 March 26 (1h27m50s-1h49m34sUT). Copyright © 2012 by B. Dintinjana and B. Mikuž, Črni Vrh Observatory, Slovenia. 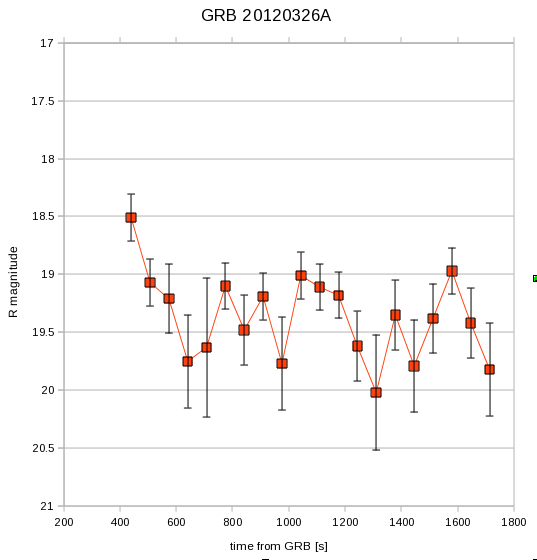 Light curve of GRB 120326A, obtained from our Rc photometry data. After the initial burst, the afterglow dropped by 1.3 magnitude and continued with semi-periodic variations in time scale of minutes. The time-stamp display the (UT) time of the middle of each exposure and image consecutive designation A-T. Copyright © 2012 by B. Dintinjana and B. Mikuž, Črni Vrh Observatory, Slovenia. A supernova of magnitude about R = 13 was discovered on 2012 Mar. 17.90 by J. Skvarč on four 60 s CCD images taken with a 0.60-m f/3.3 Cichocki telescope from the Crni Vrh Observatory. The object is at R.A. = 10h43m53s.72, Decl. = +11d40'17".7 (equinox J2000), which is 60" W and 115" S from the center of M95. Nothing is visible on this location in our PIKA archive images from 2005-04-25, 2005-05-01, 2006-05-04, 2008-11-22, 2010-02-13, 2010-02-24 and 2012-02-15 nor in DSS image archives. He note that this object is only 3.3 arc seconds from the X-ray source [SYT2006] s8 listed in the paper by Swartz, Yukita, Tennant, Soria and Ghosh. Full frame composite discovery image of PSN J10435372+1140177 = Supernova 2012aw in M95 with Mars overexposed near image center. It was composed by adding four 60-s unfiltered exposures, obtained around 2012 Mar. 17.90 with 60-cm, f/3.3 Cichocki telescope at Črni Vrh Observatory. M95 galaxy with supernova 2012aw is near the lower right corner. Mars was only about half degree from this object and this is causing the four diffraction spikes on the composite image. Copyright © 2012 by J. Skvarč, Črni Vrh Observatory. Clip of the image above with M95 galaxy and Supernova 2012aw. Copyright © 2012 by J. Skvarč, Črni Vrh Observatory. True color image of supernova 2012aw, obtained on Mar. 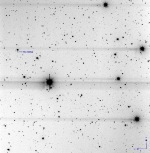 22, 2012 (23h42-0h17UT) with 60-cm, f/3.3 Cichocki telescope. Exposures were 14x60s for luminance and 5x60s for BVR filters. Copyright © 2012 by H. Mikuž, Črni Vrh Observatory. Discovery was announced in CBET Electronic Telegram No. 3054 together with several spectroscopic observations, which suggest that the object is a very young type-II supernova about 4-5 days after the core-collapse. 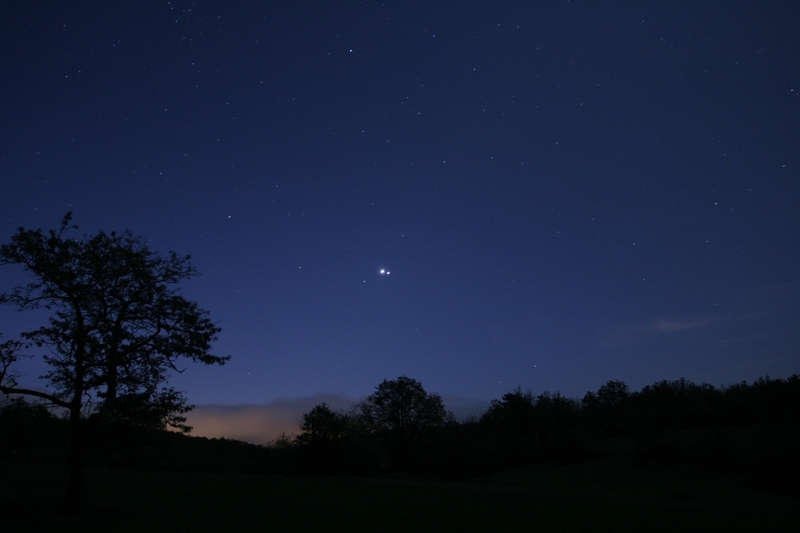 This color image of Venus-Jupiter conjunction on March 14, 2012 was obtained from the Zilja valley near the town Reisach (about 80 km west of Villach), Austria with relatively dark western sky. A faint cone of zodiacal light spans from horizon toward the Pleides star cluster. Image was obtained on 2012 Mar. 14 (18h14UT) with Canon EOS 20D camera and 17mm, f/4 lens. Exposure time was 60 seconds at ISO 1600. Copyright © 2012 by H. Mikuž and A. Mohar, Črni Vrh Observatory. On 2012 Feb. 17 (4h 48m 31s UT +/-60s) the all-sky camera at Črni Vrh Observatory recorded about -5 magnitude fireball over the NW part of the sky. The fireball left a prominent afterglow which lasted about 10 minutes and is well recorded on this time-lapse movie. 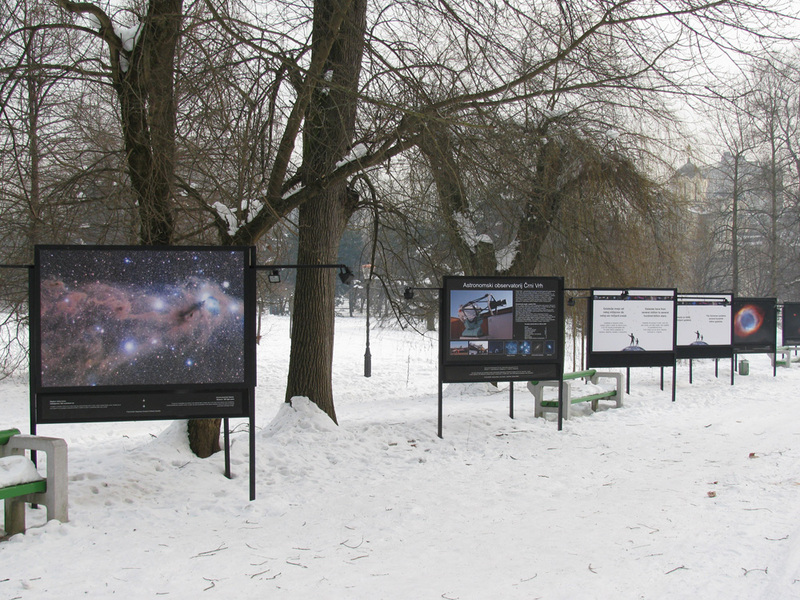 Copyright © 2012 by H. Mikuž and PIKA project, Črni Vrh Observatory. On 2011 December 18.03UT, two NEO asteroids (2011 YW1 and 2011 YQ1) were discovered on images taken by Jure Skvarč in the scope of PIKA sky survey program at Črni Vrh Observatory. Discovery was announced in MPEC 2011-Y13 and MPEC 2011-Y10. According to orbital elements, the object 2011 YW1 belongs to the Amor family of NEOs, while 2011 YQ1 belongs to the Apollo family. 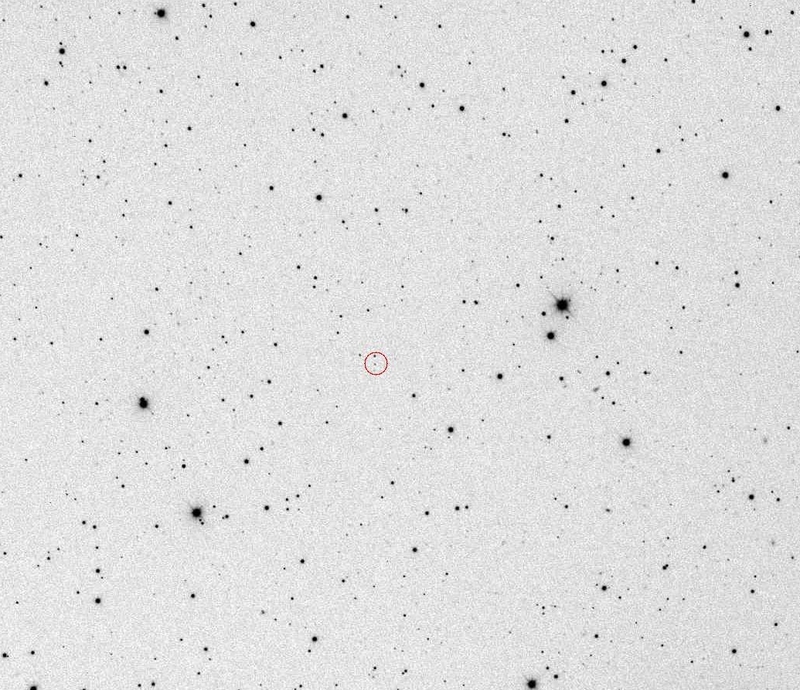 On 2011 December 1.01UT, NEO asteroid 2011 XC was discovered on images taken by Jure Skvarč in the scope of Comet and Asteroid Search Program PIKA at Črni Vrh Observatory. After posting on Minor Planet Center NEO Confirmation Page, follow-up observations were collected from observers worldwide. Discovery was announced in MPEC 2011-X13. According to orbital elements, the object belongs to the Amor family of asteroids. Animation, composed of four discovery images, obtained with the 60-cm, f/3.3 Cichocki telescope. Copyright © 2011 by J. Skvarč, Črni Vrh Observatory, Slovenia. H. Mikuz and B. Dintinjana, Crni Vrh Observatory, report the discovery of a supernova (mag 17.0) by Jan Vales on four unfiltered CCD images (bandpass roughly equivalent to the R band) taken on Nov. 17.780-17.825 UT with the 60-cm f/3.3 Cichocki reflector in the course of the Comet and Asteroid Search Program (PIKA) at Crni Vrh Observatory. The new object is located at R.A. = 23h00m54s.71, Decl. = +18o50'32".3 (equinox 2000.0; uncertainty about 0".2), which is approximately 6" east and 4" south of the center of a nearby galaxy. Nothing is visible at this position on several Digitized Sky Survey red and blue images from the Palomar Sky Survey. Composite image of supernova was made by stacking four 60 second unfiltered discovery frames taken around 2011 Nov. 17.80 UT with 60-cm, f/3.3 Deltagraph telescope. Image scale is 1.25 arc sec/pixel. Copyright © 2011 by J. Vales, Črni Vrh Observatory. Discovery was announced in CBET Electronic Telegram No. 2915. Spectroscopic observations, obtained on 2011 Nov. 20.85 UT by S. Valenti, A. Pastorello, S. Benetti, L. Tomasella, F. Bufano, and P. Ochner, Istituto Nazionale di Astrofisica, Osservatorio Astronomico di Padova with the 1.82-m Copernico Telescope (+ AFOSC; range 340-790 nm, resolution 2.2 nm), shows it to be a type-Ia supernova. B. Dintinjana and H. Mikuz, Crni Vrh Observatory, report the discovery of a supernova (mag 15.7) by H. Mikuz on four unfiltered CCD images (bandpass roughly equivalent to the R band) taken on Nov. 18.720-18.751 UT with the 60-cm f/3.3 Cichocki reflector in the course of the Comet and Asteroid Search Program (PIKA) at Crni Vrh Observatory. The new object is located at R.A. = 22h26m14s.54, Decl. = +34o12'59".1 (equinox 2000.0; uncertainty about 0".2), which is approximately 8" east and 1" north of the center of a nearby galaxy. They add that nothing is visible at this position on several Digitized Sky Survey red and blue images from the Palomar Sky Survey. Composite image of supernova was made by stacking four 60 second unfiltered discovery frames taken around 2011 Nov. 18.735 UT with 60-cm, f/3.3 Deltagraph telescope. Image scale is 1.25 arc sec/pixel. Copyright © 2011 by H. Mikuz, Črni Vrh Observatory. Discovery was announced in CBET Electronic Telegram No. 2906. Spectroscopic observations, obtained by S. Valenti, A. Pastorello, S. Benetti, L. Tomasella, F. Bufano, and P. Ochner, Istituto Nazionale di Astrofisica, Astronomico di Padova on 2011 Nov. 19.76 UT with the 1.82-m Copernico Telescope (+ AFOSC; range 340-790 nm, resolution 2.2 nm), shows it to be remarkably similar to the transitional type-IIn/Ibn supernova 2005la (Pastorello et al. 2008, MNRAS 389, 131). The spectrum is very blue and shows prominent H and He I lines in emission. In particular, the most prominent He I lines compete in strength with H_alpha. The FWHM velocity of H_alpha is 2700 km/s, while that of He I 587.6-nm is about 2000 km/s. The redshift deduced from the position of the most important lines is z = 0.023. Na seznamu letošnjih dobitnikov nagrad Edgarja Wilsona, ki jih vsako leto podeljujejo odkriteljem kometov iz vrst amaterskih astronomov je tudi član naše opazovalne skupine Jan Vales. Nagrado in spominsko plaketo je prejel za odkritje povratnega kometa P/2010 H2 (Vales), 16. aprila 2010. Nagrade E. Wilsona sicer Harvard Smithsonian Center podeljuje že od leta 1999. V skladu s pravili Mednarodne astronomske zveze dobijo kometi imena po njihovih odkriteljih. Čestitke Janu za odkritje! Jan Vales poleg teleskopa Cichocki s katerim je odkril komet P/2010 H2 (Vales). Copyright © 2011, H. Mikuž, Observatorij Črni Vrh. Spominska plaketa Edgarja Wilsona za odkritje kometa P/2010 H2 (Vales). Copyright © 2011, J. Vales, Observatorij Črni Vrh. 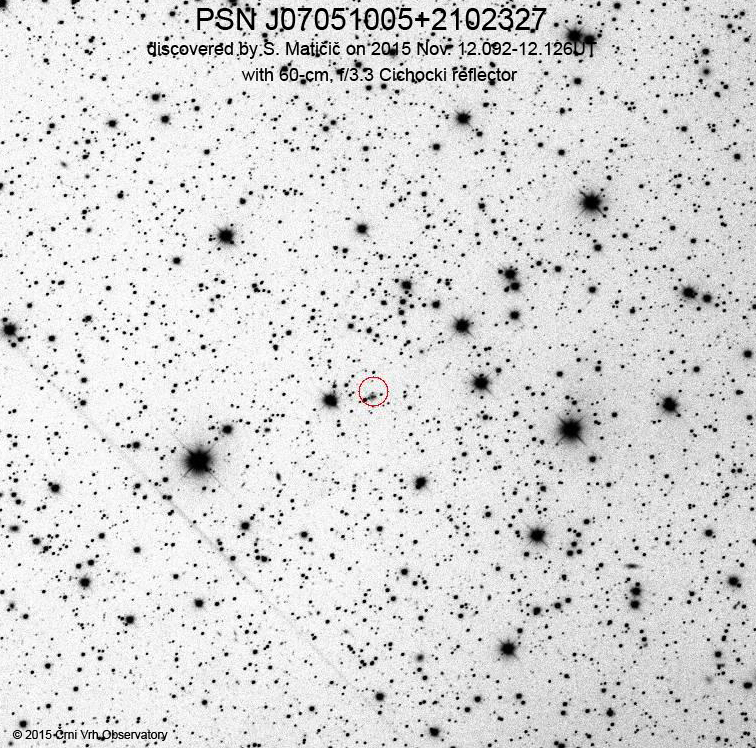 Young supernova 2011fe was discovered by the "Type Ia supernova science working group of the Palomar Transient Factory" on g-band images obtained with the Oschin 1.2-m Schmidt telescope at Palomar on Aug. 24 UT. The supernova is located at R.A. = 14h03m05s.81, Decl. = +54d16'25".4 (equinox 2000.0). A preliminary spectrum obtained on Aug. 24 UT with FRODOSPEC on the Liverpool Telescope indicates that 2011fe is probably a very young type-Ia supernova. The well known galaxy M101 is only about 21 million light years away, which makes it one of the closest supernovas seen in past decades. True color image (left) (supernova position signed with short lines) was recorded on 2011 Aug. 25 (19h06-19h25UT) with 60-cm Cichocki robotic telescope and standard BVR photometric filters. Exposure time was R(120s), V(120s) and B(180s). Image scale is 2.2 arc sec/pixel. Copyright © 2011 by H. Mikuž and J. Vales, Črni Vrh Observatory. True color image (left) (supernova position signed with short lines) was recorded on 2011 Aug. 26 (19h04-19h34UT) with 60-cm Cichocki robotic telescope and standard BVR photometric filters. Exposure time was R(3x120s), V(3x120s) and B(3x180s). Image scale is 1.86 arc sec/pixel. Copyright © 2011 by H. Mikuž and J. Vales, Črni Vrh Observatory. True color image (left), recorded on 2011 Sep. 6 (18h44-18h53UT) with 60-cm Cichocki robotic telescope and standard BVR photometric filters. Exposure time was R(3x30s), V(3x30s) and B(3x60s). Image scale is 1.86 arc sec/pixel. Supernova already brightened to about V=10.5. Copyright © 2011 by H. Mikuž, Črni Vrh Observatory. J. Skvarč report that a possible supernova was detected by B. Mikuž, Črni Vrh Observatory on 4 unfiltered images taken around 2011 July 11.0 UT by a 60-cm Cichocki telescope and CCD. The object of magnitude R=17.9 is located at R.A. = 23h01m36s.38, Decl. =+32o20'06".9, which is 6" west and 8" north of an uncataloged galaxy. After being posted on TOCP page, confirmation images were obtained by Joseph Brimacombe, Cairns, Australia, Federica Luppi Varese, Italy and Xavier Bros, Anyslum Observatory, Ager, Catalonia, Spain. Composite image of supernova was made by stacking four 50 second unfiltered discovery frames taken around 2011 Jul. 11.0 UT with 60-cm, f/3.3 Deltagraph telescope. Image scale is about 1.3 arc sec/pixel. 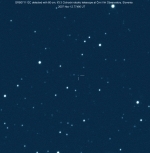 Copyright © 2011 by B. Mikuž and J. Skvarč, Črni Vrh Observatory. Discovery was announced in CBET Electronic Telegram No. 2788. Spectroscopic observations, obtained on Aug. 11.13UT with the Nordic Optical Telescope (+ ALFOSC; range 350-900 nm, resolution 0.8 nm) shows it to be a type-Ia supernova at roughly a month past maximum. A small asteroid (about 10 meter wide) 2011 MD was discovered on 2011 June 22.26UT by Lincoln Near Earth Asteroid Research (LINEAR) program in New Mexico. The images for this animation were taken using a 60-cm, f/3.3 Cichocki telescope from the Črni Vrh Observatory on the night of 26 June 2011. Each exposure was of 15 seconds. 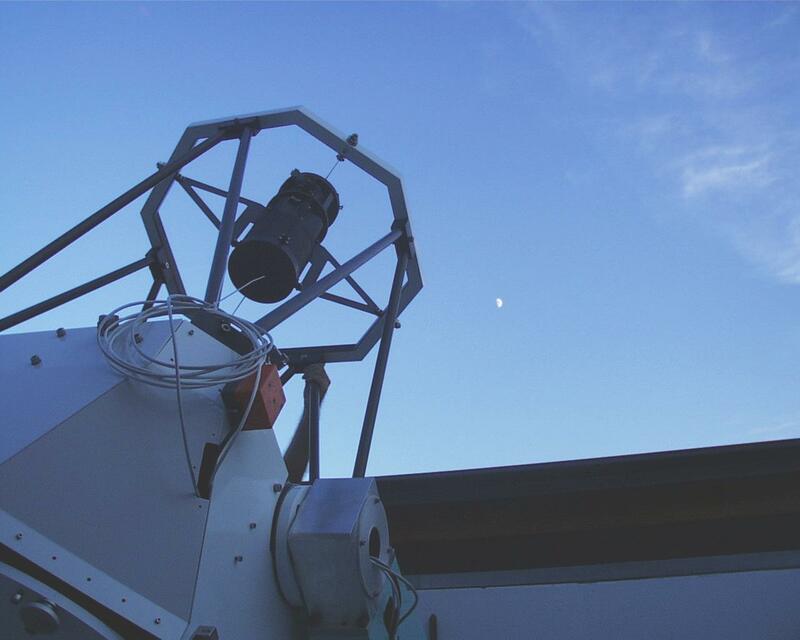 The telescope was tracking on the asteroid, changing the rate of tracking between exposures. The entire sequence lasted about 4h40m, during which 635 exposures were made. The brightness variations due to asteroid rotation are clearly visible. At the time the asteroid was less than 200000 km from Earth. At the closest approach some 15 hours later the distance was about 20000 km. 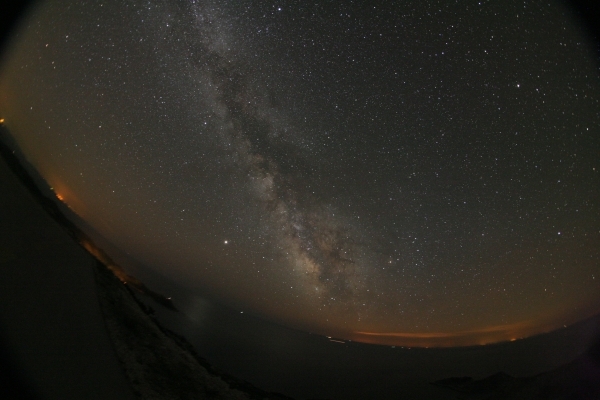 Copyright © 2011 by J. Skvarč, Črni Vrh Observatory. 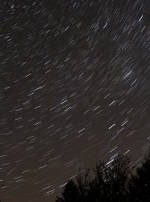 Time-lapse sequence, obtained between 20h12 - 21h28UT at Črni Vrh Observatory. The sequence starts in evening twilight, with the Moon just in the mid of totality. All images are 30s exposures @ ISO 1600, obtained with Canon EOS 20D camera and 17mm, f/4 lens. Photo & Video by H. Mikuž and J. Vales. 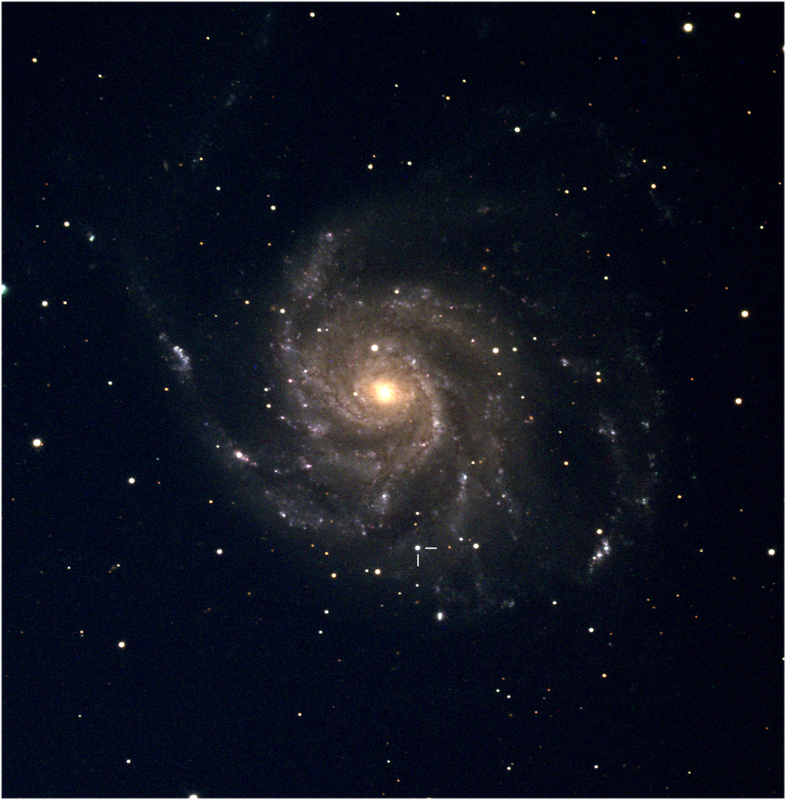 Supernova 2011by was discovered by Zhangwei Jin, Ningbo, Zhejiang and Xing Gao, Urumqi, Xinjiang, China on a 60-s survey image (mag approximately 14.2), taken in the course of the Xingming Observation Sky Survey around Apr. 26.8234 UT, using a Celestron C14 Schmidt-Cassegrain telescope (+ unfiltered CCD camera) at Mt. Nanshan. True color image (left) was recorded on 2011 May 2 (23h02-23h09UT) with 60-cm Cichocki robotic telescope and standard BVR photometric filters. Exposure time was R(120s), V(120s) and B(180s). Image scale is 1.86 arc sec/pixel. Copyright © 2011 by H. Mikuž, Črni Vrh Observatory. True color image (left) was recorded on 2011 May 6 (20h40-21h19UT) with 60-cm Cichocki robotic telescope and standard BVR photometric filters. Exposure time was 5x120s(R), 5x120s(V) and 5x180sB. Image scale is 0.93 arc sec/pixel. Copyright © 2011 by H. Mikuž, Črni Vrh Observatory. Recurrent Nova T Pyx was discovered in eruption by M. Linnolt (Hawaii, United States) at a visual magnitude of 13.0 on 2011 April 14.3. This is the first outburst of T Pyx since 1966 December 10, almost 45 years ago, when it reached visual magnitude 6.5. Previous outbursts occurred in 1890, 1902, 1920, and 1944. (IAUC 9205). T Pyx coordinates (J2000.0) RA = 9h04m41.5s; Dec = -32°22'47.5". True color image, composed from BVR images, obtained remotely on 2011 Apr. 17 (19h13-19h25UT) with 116 mm, f/4 lens and ST-8XMEI CCD, mounted on ACIT robotic telescope at Črni Vrh Observatory. Copyright © 2011 by H. Mikuž, Črni Vrh Observatory. True color image, composed from BVR images, obtained remotely on 2011 Apr. 18 (19h07-19h30UT) with 116 mm, f/4 lens and ST-8XMEI CCD, mounted on ACIT robotic telescope at Črni Vrh Observatory. Copyright © 2011 by H. Mikuž, Črni Vrh Observatory. 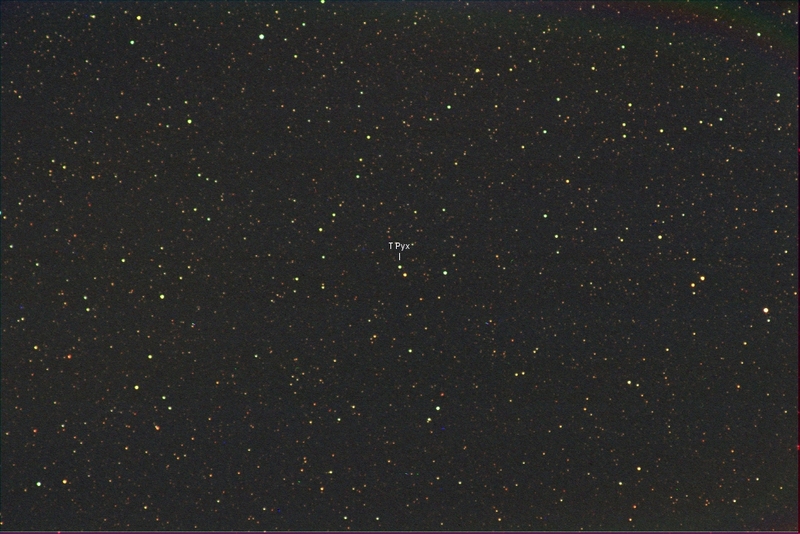 Standard CCD photometry of Nova T Pyx was performed with 116 mm, f/4 lens, BVR filters and SBIG ST-8 CCD camera. Data set submitted to AAVSO. 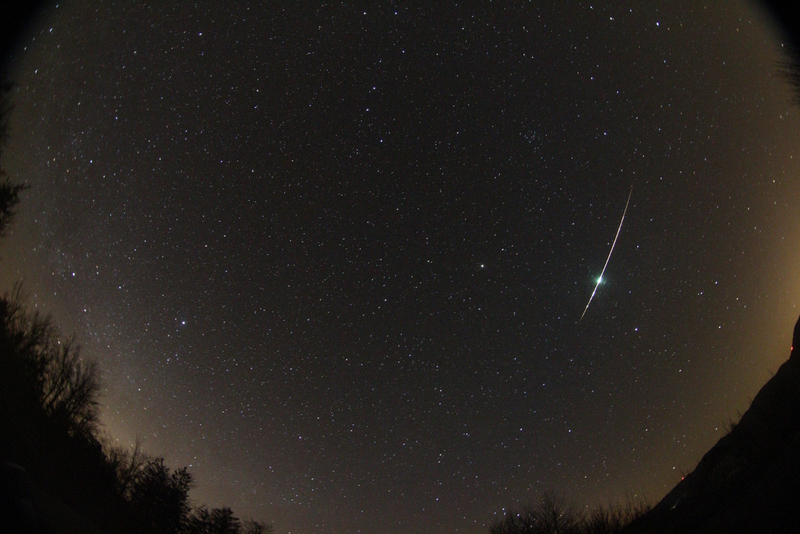 Several all-sky cameras in Slovenia and Italy recorded very slow, about -6 magnitude fireball on 2011 Mar. 30 (around 23h05UT). 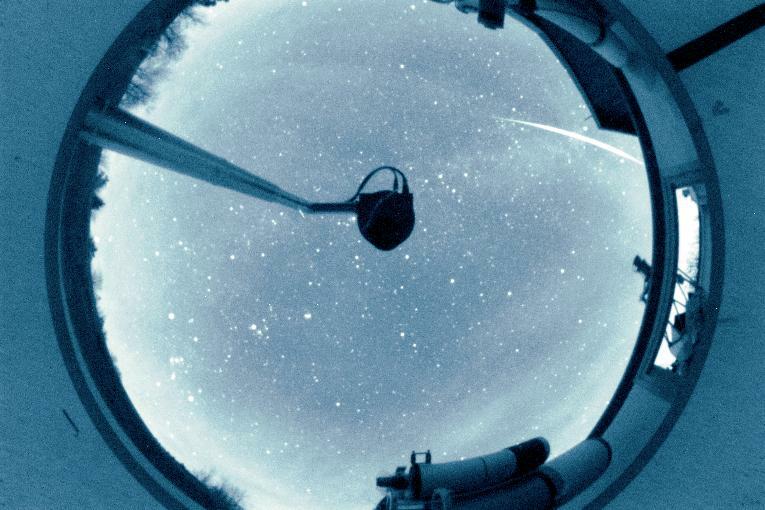 The fireball was recorded on two consecutive 60 second exposures with robotic all-sky camera at Črni Vrh Observatory. The time lapse between exposures was 3 seconds, during which the object moved only about 20 degrees on the sky. Copyright © 2011 by PIKA project, Crni Vrh Observatory. 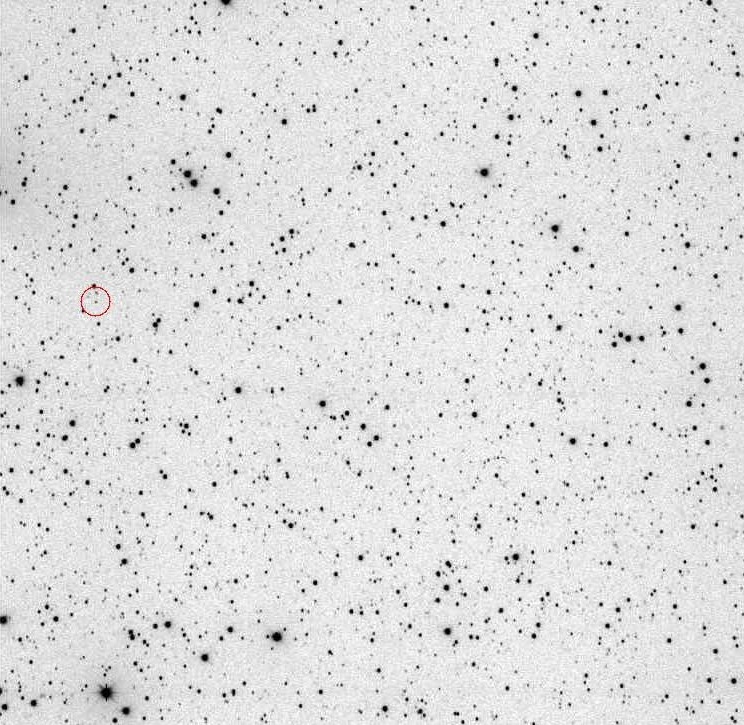 On the evening of January 3, 2011 a new asteroid with 100% NEO rating was discovered on images taken by Stanislav Matičič in the scope of Comet and Asteroid Search Program PIKA at Črni Vrh Observatory. After posting the candidate on NEO Confirmation Page, follow-up observations were collected from observers worldwide. The orbital elements revealed that the object belongs to the Aten family of asteroids. The animation was composed of four discovery images of this object. Copyright © 2011 by S. Matičič, Črni Vrh Observatory, Slovenia. 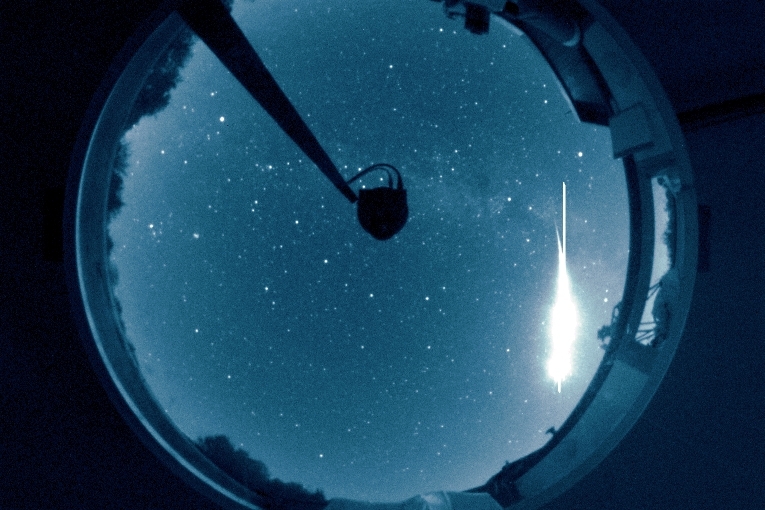 This bright fireball most probably originate from yearly Leonid meteor shower. It left a bright trail that lasted for about 15 minutes. 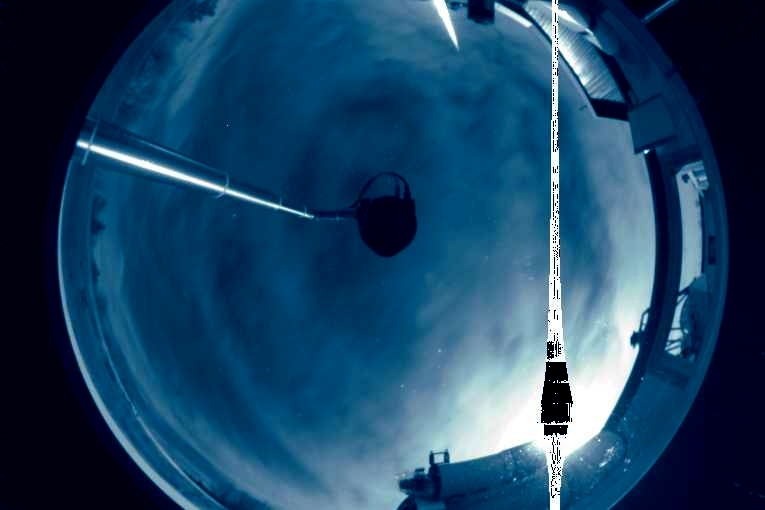 The animation was composed from 15 consecutive 1 minute exposures, obtained on 2010 Nov. 4, between 0h56m55s and 1h11m38sUT with remote all-sky camera at Črni Vrh Observatory. 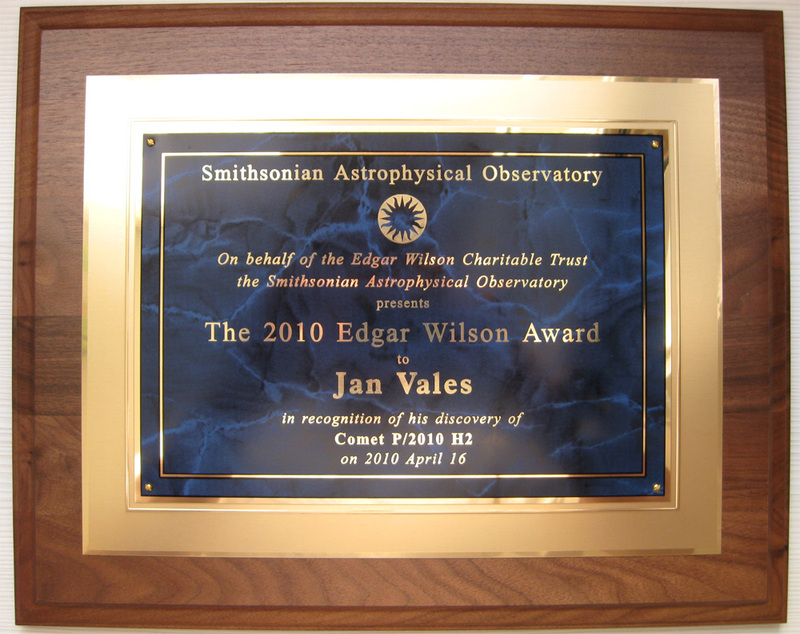 Copyright © 2010 by J. Vales, Crni Vrh Observatory. Another animation of the same event prepared by Javor Kac. 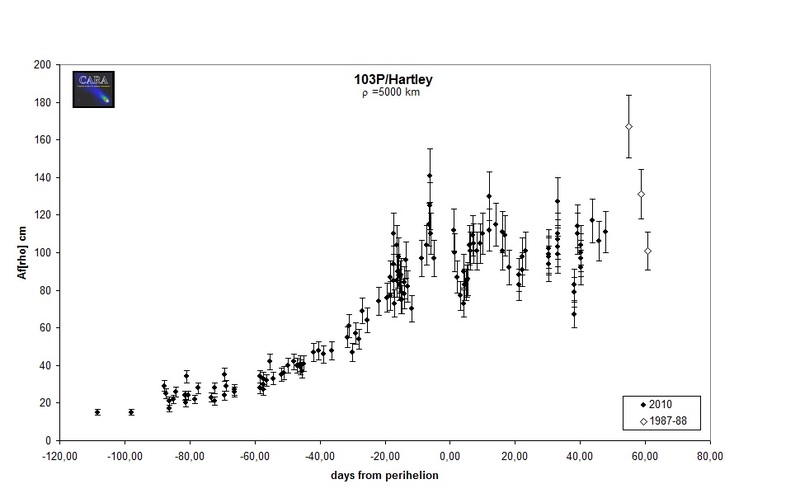 Under the scope of CARA project, comet 103P/Hartley is continuously monitored by a group of dedicated observers, using small and medium size remote telescopes, now available worldwide. The plot below show the Afrho quantity data collected on comet 103P/Hartley until 2010 Dec. 15 from R band photometry, performed by Paolo Bacci, Walter Borghini, Erik Bryssink, Dario Castellano, Gianni Galli, Ernesto Guido, Bernhard Hausler, Nick Howes, Rolando Ligustri, Herman Mikuz, Giannantonio Milani, Martino Nicolini, Carmen Perrella, Jure Skvarc, Giovanni Sostero and Roberto Trabatti. The Afrho quantity is related to the dust production rate and shows the general behaviour of the comet. Measurements are normalized to a 10000 km radius measuring window, centerd on the comet. The data refers both to the current apparition, and to some 1997-98 data from R band images taken at the Crni Vrh Observatory. Comet 103P is showing variations in a relatively small timescale with an unexpected complex behaviour. Copyright © 2010 by CARA project. On the evening of October 11, 2010 a new asteroid with 100% NEO rating was discovered on images taken by Stanislav Matičič in the scope of Comet and Asteroid Search Program PIKA at Črni Vrh Observatory. Follow up images were obtained on Oct. 12-13 night by 106 Crni Vrh and numerous obnservers worldwide. The orbital elements revealed that this object belongs to the Amor family of asteroids. A new star-like object (R = 16.2 +/- 0.1) with coordinates ra=21h05m12s.29, dec=+69d12'55".3 (J2000) was found by B. Mikuž on unfiltered CCD images (limiting mag 18.5) in the course of the PIKA project with the 0.60-m f/3.3 Cichocki telescope at Črni Vrh Observatory. The object was visible on all four images of the same region taken around 2010 Aug. 22.905-22.933 UT. Nothing is visible at this position on PIKA archival images taken on 2004 Nov. 27 (limiting mag 17.0) and 2006 Sept. 3 (limiting mag 18.7) or on several Palomar Sky Survey and 2MASS images from the Aladin database. Further investigation of the Simbad and VizieR databases shows no candidate object at this position. Discovery image is a 40 second exposure obtained with 60-cm Cichocki robotic telescope. The variable star was found using software for detection of new static objects. Copyright © 2010 by B. Mikuz. 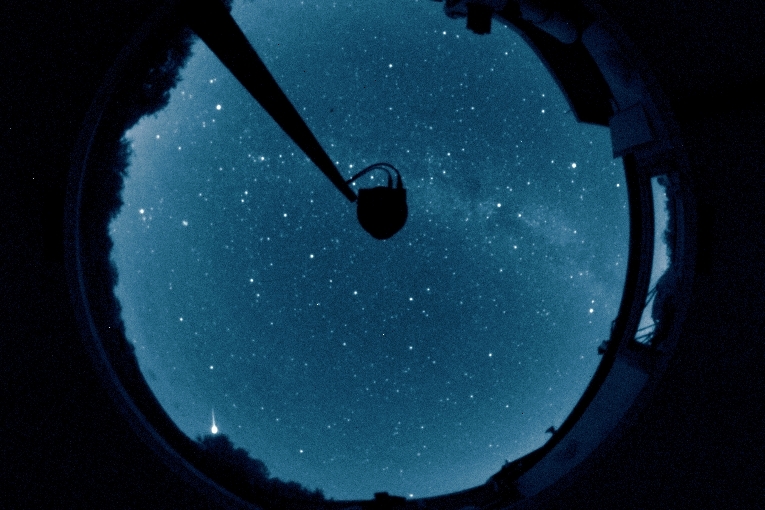 One day before maximum activity, three bright Perseids were recorded with Črni Vrh Observatory All-Sky Camera. The animation cover the time span of half hour (2h10-2h40UT) on 2010 Aug. 12, just before dawn. Copyright © 2010 by H. Mikuz, Črni Vrh Observatory. 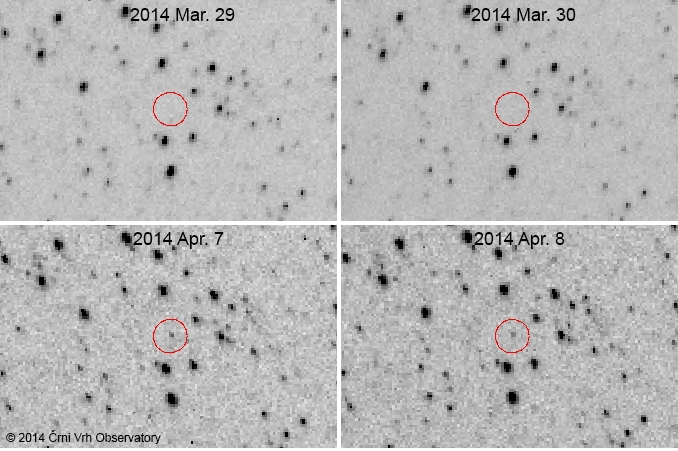 On images taken by Jan Vales in the course of the Črni Vrh Asteroid and Comet Search program PIKA, an apparent supernova (mag 17.3) was detected using software for automatic discovery of static objects. Supernova was found on four consecutive unfiltered CCD images taken around 2010 Jul. 9.05 UT with a 0.60-m f/3.3 Cichocki Sky Survey Robotic Telescope. 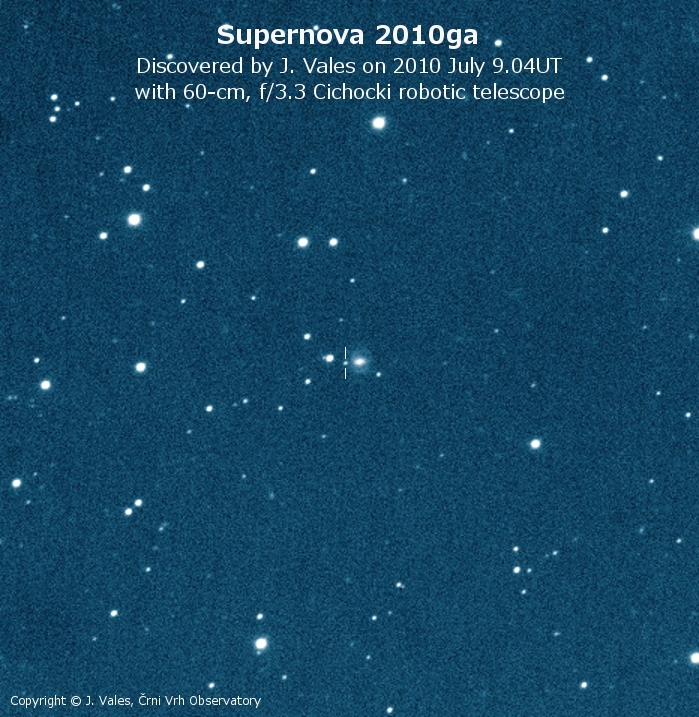 Composite image of supernova 2010ga was made by stacking four 50 second unfiltered discovery frames taken on 2010 Jul. 9.04-9.07 UT with 60-cm, f/3.3 Deltagraph telescope. Image scale is about 2.80 arc sec/pixel. 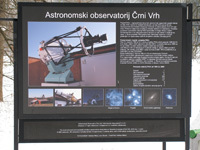 Copyright © 2010 by J. Vales and H. Mikuž, Črni Vrh Observatory. The new object is located at R.A. = 0h34m43s.83, Decl. = +9o54'36".1 (equinox 2000.0), which is 17" east and 2" south of the nucleus of the galaxy designated 2MASX J00344266+0954382. 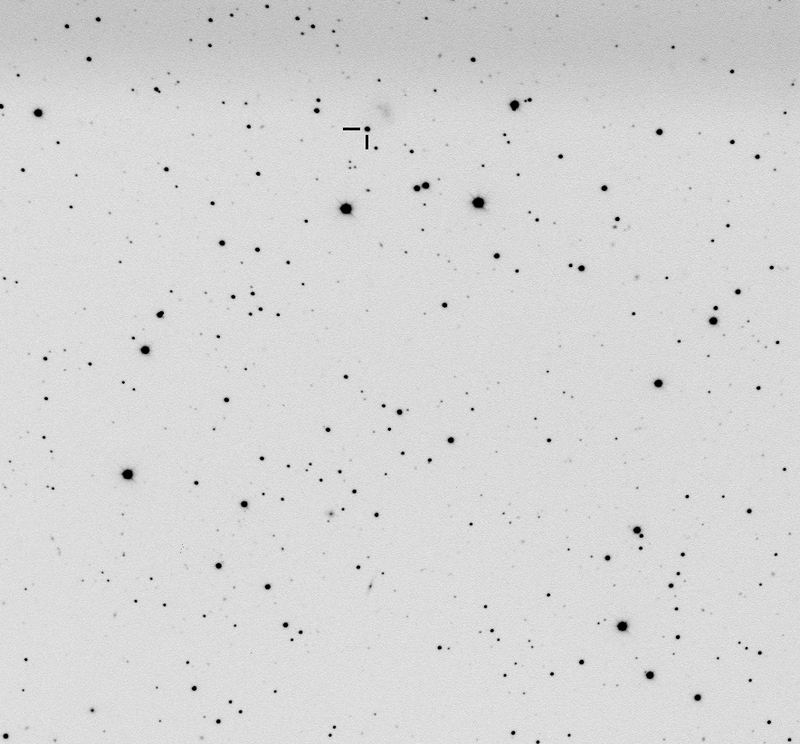 Nothing is visible at this position on archival PIKA images obtained on 2008 Oct. 20.04 (limiting magnitude 18.0) or on a Palomar Sky Survey F plate from 1990 Oct. 14 (via the Digitized Sky Survey/Aladin). Jure Skvarc, Crni Vrh Observatory, reports that a confirmation image of 2010ga was obtained by S. Maticic at Crni Vrh Observatory on July 10.03 using a photometric R filter, from which Skvarc measured R = 18.19 +/- 0.03. Following posting on the Central Bureau's unconfirmed-objects webpage, Vitali Nevski (Vitebsk, Belarus) reports that he obtained unfiltered CCD images of 2010ga on July 9.958 with a 0.3-m reflector, yielding mag 17.7 and position end figures 43s.82, 36".4 (USNO-B1.0 catalogue), adding that nothing is visible at this position on a Palomar Sky Survey DSS image obtained on 1990 Oct. 14 (via the Digitized Sky Survey; limiting red mag 21). Discovery was announced in CBET Electronic Telegram No. 2363. Spectroscopic observations (CBET No. 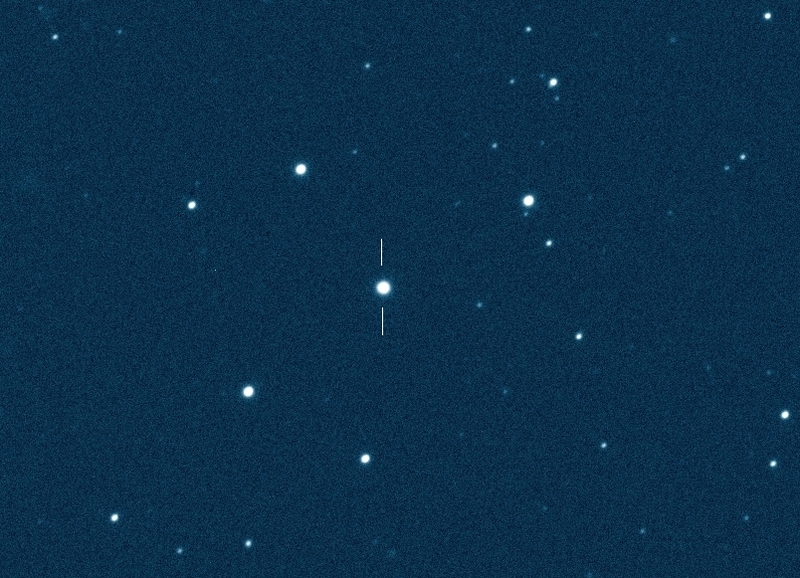 2364), obtained on July 11 UT with WFCCD mounted on the du Pont 2.5-m telescope at Las Campanas Observatory shows it to be a type-Ia supernova a few days after maximum light. 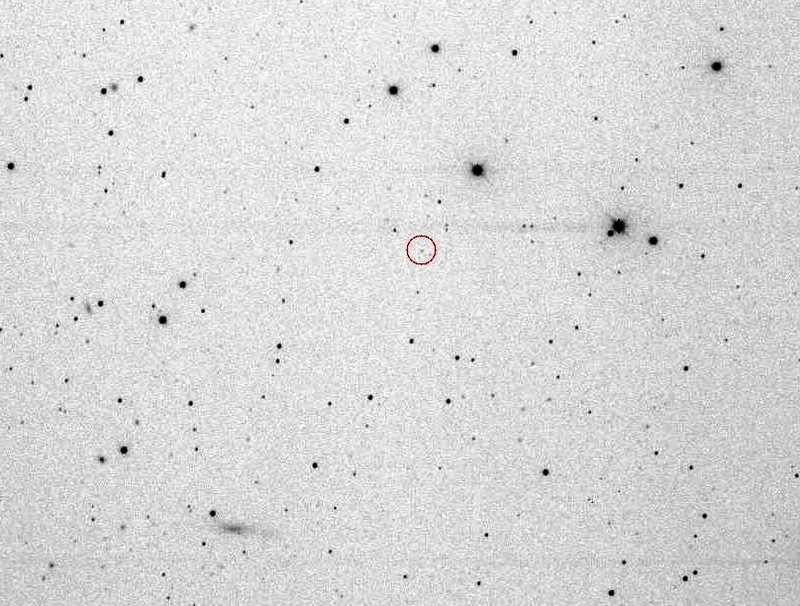 On images taken by Jure Skvarč in the course of the Črni Vrh Asteroid and Comet Search program PIKA, an apparent supernova (mag 17.3) was detected using software for automatic discovery of static objects. Supernova was found on four consecutive unfiltered CCD images taken around 2010 Jun. 5.96 UT with a 0.60-m f/3.3 Cichocki Sky Survey Robotic Telescope. 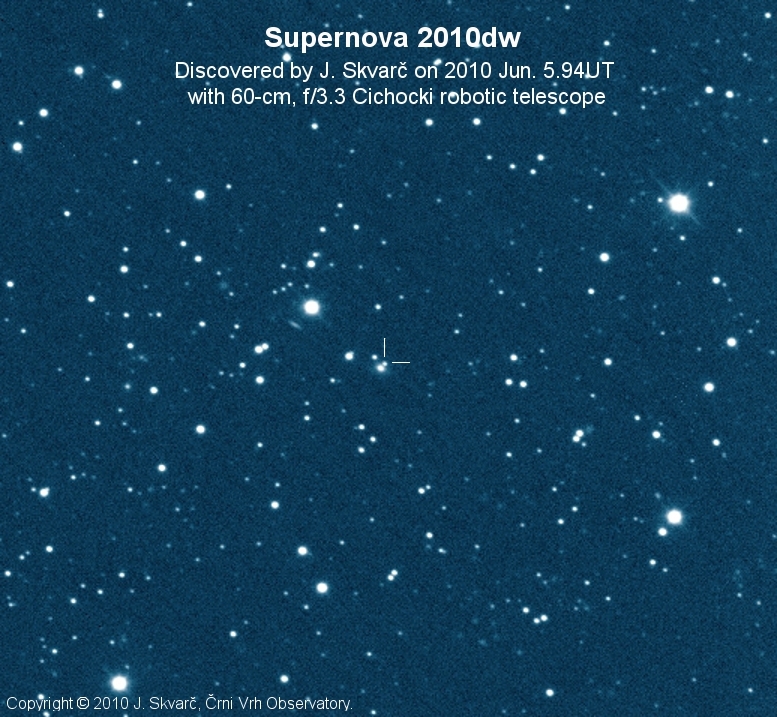 Composite image of supernova 2010dw was made by stacking four 50 second unfiltered discovery frames taken on 2010 Jun. 5.94-5.99 UT with 60-cm, f/3.3 Deltagraph telescope. Image scale is about 0.93 arc sec/pixel. Copyright © 2010 by J. Skvarč and H. Mikuž, Črni Vrh Observatory. The new object is located at RA = 15h22m40s.31, Decl. = -5o55'15".9 (equinox 2000.0), which is 4".5 east and 5".5 north of the galaxy designated 2MASX J15224062-0555214. The new object appears at magnitude R = 17.3 on a confirming image taken by B. Mikuz on June 6.89 with the same telescope. Nothing is visible at this position on archival PIKA images obtained on 2006 Apr. 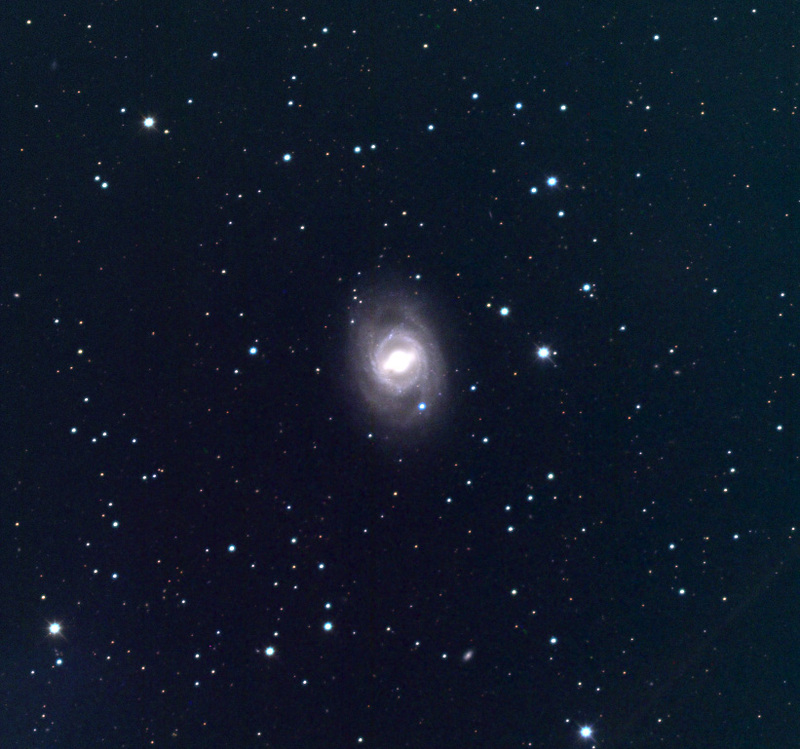 4.12 (limiting mag 18.0) or on a Palomar Sky Survey image from 1955 May 20. A CCD image taken by S. Maticic with the same Crni Vrh telescope on June 7.89 yields R = 17.1 for 2010dw, as measured by Skvarc. Discovery was announced in CBET Electronic Telegram No. 2310. Spectroscopic observations (CBET No. 2311), obtained on 2010 Jun. 8 UT with the F. L. Whipple Observatory 1.5-m telescope (+ FAST; range 360-760 nm), shows it to be a normal type-Ia supernova a few days before maximum light. We obtained some pretty images of planet Saturn on April 28, 2010 evening, when seeing conditions were very good. We used 150 mm, f/8 refractor, 2x Barlow lens and Imaging Source b/w video camera DMK 21AU04. Exposure time was 1/77s. Movies were processed with RegiStax image processing software. Copyright © 2010 by J. Vales and H. Mikuz, Črni Vrh Observatory. 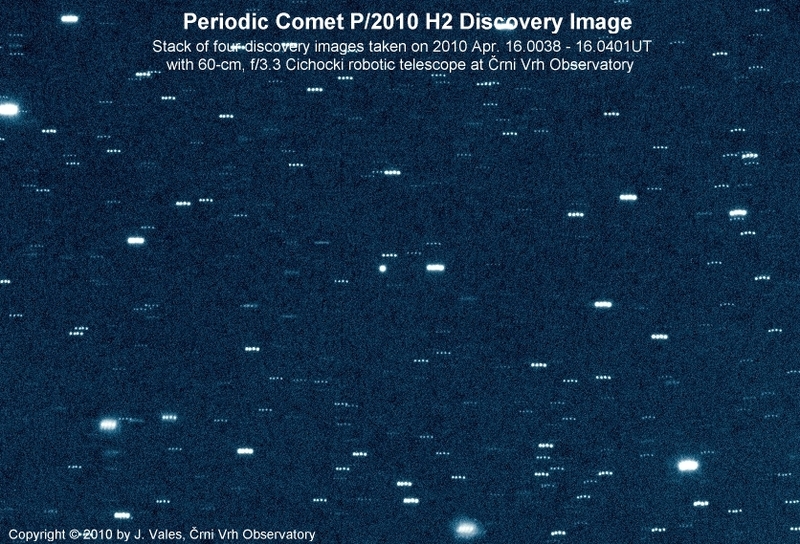 On images taken by J. Vales in the course of the Črni Vrh Asteroid and Comet Search program PIKA, on April 16, 2010 an unusually bright unknown object (mag. 12.5) was automatically detected. The object was near opposition, in an area searched by Catalina Sky Survey (CSS) just a day before. As it is not usual to encounter unknown objects of this magnitude in the area recently scanned by sky surveys, a question of its nature naturally appeared. The object was placed on the Near Earth Object Confirmation Page and with the help of observations from other observatories it became apparent very soon that it is about 2 AU away. In case that this was an asteroid (as we would infer from the stellar appearance on the discovery images) this would mean a diameter in the order of 100 km, which is extremely unlikely. The remaining explanation within common knowledge of the Solar system is that it is a cometary outburst of a large magnitude. Recently a similar outburst was experienced by comet 17/P Holmes. This object has triggered massive activity of 40 observatories around the world which contributed altogether 226 observations to the Minor Planet Center (MPC). The observers from the CSS confirmed that the object is not visible on their images taken only 15 hours before the discovery. There was a lively debate about the nature of this object on the Minor Planet Mailing List with most plausible explanation that it is a previously unknown comet in outburst. Further observations by several observers showed that the object has a wider profile than nearby stars and Alain Maury detected faint coma on long exposures made from Chile. At 19:25 UT on April 17 the MPC issued an electronic circular MPEC 2010-H12 where the object is designated as a comet P/2010 H2. The orbit is still not very well determined, but most likely it has a semimajor axis of 3.9 AU and eccentricity of 0.2. This is similar to the orbital elements of the asteroids of the Hilda family. This object will undoubtedly be investigated further in the days to come. Stack of four 50 second unfiltered discovery images, following comet motion. They were taken between 2010 Apr. 16.0038 - 16.0401UT with a 0.60-m f/3.3 Cichocki Sky Survey Telescope at Črni Vrh Observatory. Image scale is 1.86 arc sec/pixel. Copyright © 2010 by J. Vales, Črni Vrh Observatory. Animation image was made from four 50 second unfiltered discovery frames, taken between 2010 Apr. 16.0038 - 16.0401UT with a 0.60-m f/3.3 Cichocki Sky Survey Telescope at Črni Vrh Observatory. Image scale is 1.86 arc sec/pixel. Copyright © 2010 by J. Vales, and H. Mikuz, Črni Vrh Observatory. 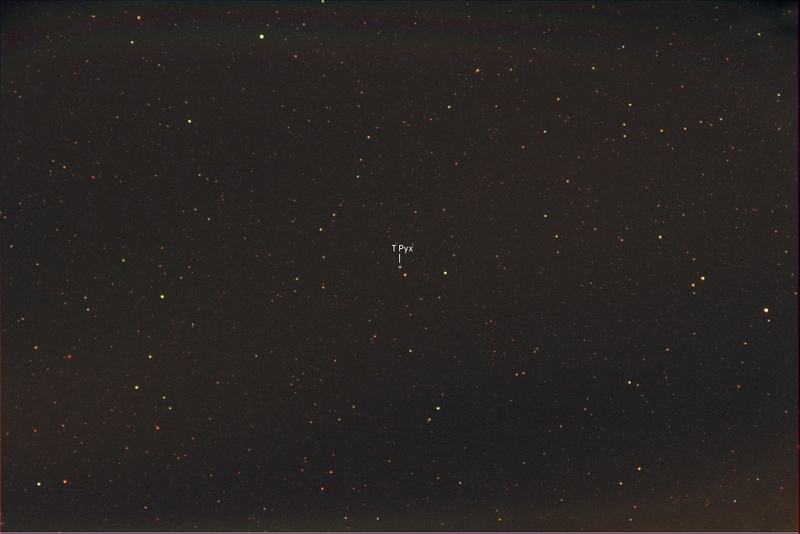 Unfiltered false color image of comet P/2010 H2 (Vales), obtained on 2010 Apr. 16.854UT with 60-cm, f/3.3 Deltagraph telescope and CCD. Exposure time was 60 seconds. Image scale is 0.93 arc sec/pixel. Copyright © 2010 by H. Mikuz, Črni Vrh Observatory. Filtered false color image of comet P/2010 H2 (Vales), obtained on 2010 Apr. 17 (20h02-21h40UT) with 60-cm, f/3.3 Deltagraph telescope R filter and CCD. Image is composition of thirty 60 second exposures. Image scale is 0.93 arc sec/pixel. Copyright © 2010 by J. Skvarc, Črni Vrh Observatory. True color image of comet P/2010 H2 (Vales), obtained on 2010 Apr. 19 (20h02-21h40UT) with 60-cm, f/3.3 Deltagraph telescope, BVR photometric filters and CCD. It was combined from 90s B, 60s R and 60s V frames. Image scale is 0.93 arc sec/pixel. Copyright © 2010 by H. Mikuž, Črni Vrh Observatory. True color image of comet P/2010 H2 (Vales), obtained on 2010 May 1 (19h45-20h27UT) with 60-cm, f/3.3 Deltagraph telescope, BVR photometric filters and CCD. Exposure time was 8 minutes in each filter with telescope tracking on comet. Image scale is 0.93 arc sec/pixel. Copyright © 2010 by J. Skvarč, Črni Vrh Observatory. 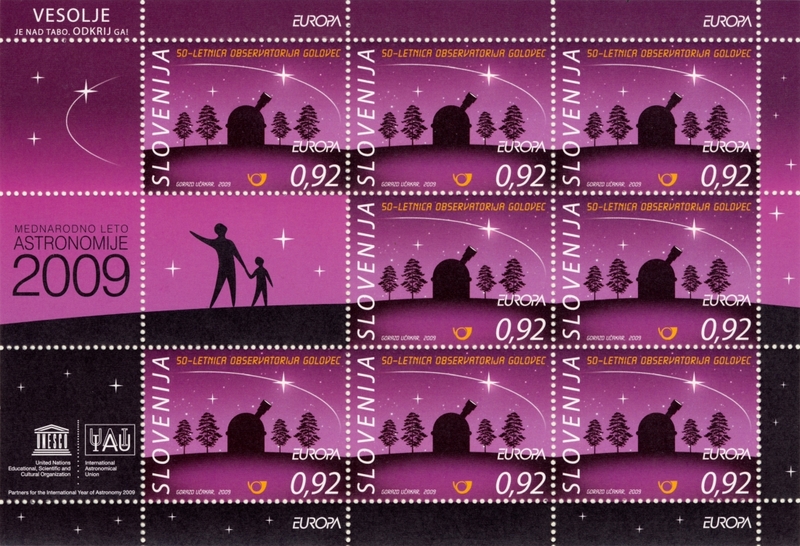 V Mednarodnem letu astronomije 2009 je bila v Jakopičevem sprehajališču v parku Tivoli postavljena razstava Od Zemlje do vesolja. Prva postavitev razstave je bila od 17. junija do 4. septembra 2009. Zaradi velikega zanimanja je bila ponovljena še od 26. novembra 2009 do 15. februarja 2010. Na 120 panojih so bile predstavljene najlepše astronomske fotografije, posnete z največjimi profesionalnimi teleskopi na Zemlji in z vesoljskim teleskopom Hubble. Vključuje tudi najboljše astronomske fotografije slovenskih astronomov. Na posebnem panoju se je predstavil tudi Astronomski observatorij Črni Vrh. Organizatorji razstave so izdali tudi katalog. Predstavili smo dejavnosti astronomskega observatorija Črni Vrh s poudarkom na dosežkih programa iskanja kometov in asteroidov PIKA. Copyright © H. Mikuž, Observatorij Črni Vrh. Pogled na razstavo Od Zemlje do vesolja v Ljubljanskem parku Tivoli. Posneto v januarju 2010. Copyright © H. Mikuž, Observatorij Črni Vrh. Sinoči (18. oktobra 2009) nekaj po 21 uri sta bila na nebu nad Slovenijo vidna dva svetla objekta, ki sta se počasi premikala od severozahoda proti severu. Šlo je za Ameriško nosilno raketo Kentaver, ki je odvrgla nad Evropo preostanek goriva in so jo sinoči lansirali iz vojaškega oporišča Vandebergh v Kaliforniji. Njej je sledil še vojaški vremenski satelit DMSP F-18, ki ga je raketa ponesla v vesolje. Očividka, ki je dogodek opazovala iz vasi Ravnik nad Hotedršico je poročala, da je bila raketa na nebu vidna kot komet s svetlim repom. To potrjujejo tudi posnetki, ki so jih objavili na spletišču Space Weather. Dogodek je pritegnil veliko pozornost, saj so ga opazovali in posneli iz več Evropskih držav. Na animaciji, ki jo je posnela vsenebna kamera observatorija na Črnem Vrhu (levo) se lepo vidi kako se tirnici obeh objektov ločujeta. Vsenebna kamera na Črnem Vrhu snema zaporedne minutne posnetke zato sta objekta na slikah pustila daljši sledi. Animacija se začne ob 21h10 in konča ob 21h16 poletnega časa. V smeri zahoda, kjer sta se gibali raketa in satelit so prehod občasno prekrivali oblaki. Copyright © 2009 Črni Vrh Observatory. Harvard Smithsonian Center for Astrophysics je objavil letošnji seznam dobitnikov nagrad Edgarja Wilsona, ki jih vsako leto podeljujejo odkriteljem kometov iz vrst amaterskih astronomov. Med letošnjimi dobitniki te prestižne nagrade je tudi član naše opazovalne skupine Stanislav Matičič. Nagrado in spominsko plaketo je prejel za odkritje kometa C/2008 Q1 (Matičič) 18. avgusta 2008. To je bilo obenem tudi prvo odkritje kometa iz Slovenije. Nagrade E. Wilsona sicer Harvard Smithsonian Center podeljuje že enajsto leto. Tokrat pa jo je prvič prejel astronom iz Slovenije. V skladu s pravili Mednarodne astronomske zveze dobijo kometi imena po njihovih odkriteljih. Stanetu vsi skupaj želimo še veliko odkritij. Stanislav Matičič s spominsko plaketo Edgarja Wilsona poleg teleskopa Cichocki na astronomskem observatoriju Črni Vrh. Copyright © 2010, H. Mikuž, Observatorij Črni Vrh. Spominska plaketa Edgarja Wilsona s posvetilom Stanislavu Matičiču. Copyright © 2010, H. Mikuž, Observatorij Črni Vrh. On the evening of August 15, 2009 a new asteroid was discovered on images taken by Jure Skvarč in the scope of Comet and Asteroid Search Program PIKA at Črni Vrh Observatory. Follow up images, obtained on Aug. 16 evening showed that NEO rating increased from 29 % (Aug. 15) to 59 %, after which it was posted on NEOCP and later confirmed by another observation from H06 RAS Observatory in New Mexico. The orbital elements revealed that this object belongs to the Amor family of asteroids. The animation shows discovery images of this object. Copyright © 2009 by J. Skvarč, Črni Vrh Observatory, Slovenia. 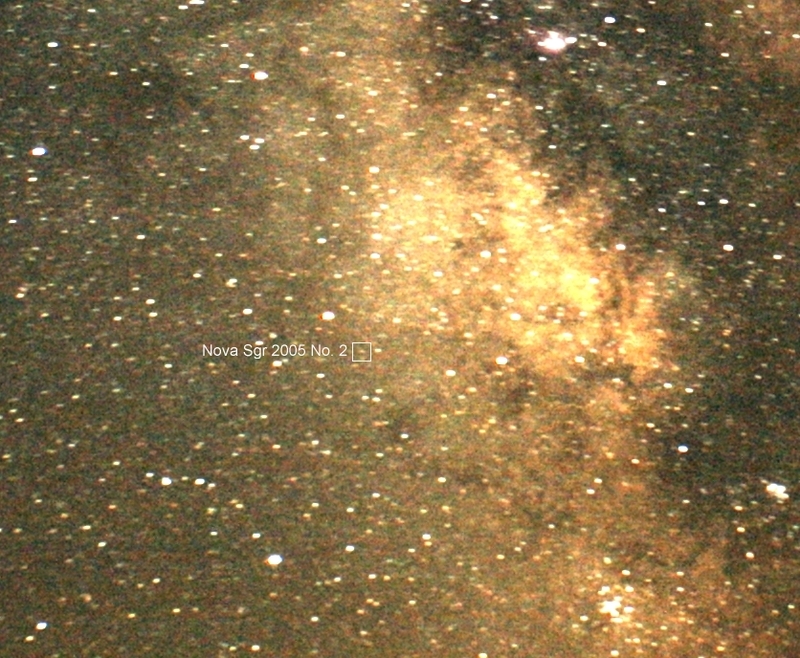 This true color image of nova (in field center) was obtained on 2008 Aug. 8.80UT with 19-cm, f/4 flat filed S-C robotic telescope, BVR photometric filters and CCD. Color image was composed from two series of exposures (B=30s, R=20s, V=20s). Image scale is 3.50 arc sec/pixel. Copyright © 2009 by H. Mikuz, Crni Vrh Observatory. We observed optical counterpart of Gamma Ray Burst GRB 090726 (Swift trigger 358422) using 60 cm Cichocki robotic telescope at Črni Vrh Observatory. A new object was detected at RA=16:34:43.04, DEC=+72:53:04.82 (J2000). Series of twenty connsecutive Rc filter exposures were taken, starting on 2009 July 26 at 22:44:31UT, 58 seconds after the GCN notice time. We confirm the presence of variable source, identified by A. Moskvitin, T. Fatkhullin & A. Valeev (GCN Circ. 9709). The object was clearly detected on all 20 frames. Complete results are published in GCN 9715 Circular. Image show GRB 090726 in maximum outburst at mag. 17.7, 367 seconds after the Swift GRB detection. One minute exposures with R filter was obtained on 2009 July 26 (22h48m04s-22h49m04sUT). Copyright © 2009 by S. Maticic and J. Skvarc, Črni Vrh Observatory, Slovenia. V počastitev Mednarodnega leta astronomije 2009 je Pošta Slovenije izdala priložnostni znamki z motivom kometa C/2008 Q1 (Matičič), ki je bil odkrit 18. avgusta 2008 na Astronomskem observatoriju Črni Vrh ter motivom Astronomskega observatorija na Golovcu, ki letos praznuje 50. letnico delovanja. 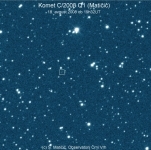 Na znamki komet C/2008 Q1 (Matičič) je stilizirano prikazan medsebojni položaj Sonca, Merkurja, Venere, Zemlje, Marsa in kometa C/2008 Q1 Matičič v trenutku odkritja. Izdana je bila tudi ovojnica "Prvi dan". Znamka Pošte Slovenije s stiliziranim motivom kometa C/2008 Q1 (Matičič). Prikazan je medsebojni položaj Sonca, Merkurja, Venere, Zemlje, Marsa in kometa C/2008 Q1 Matičič v trenutku odkritja. Znamka Pošte Slovenije s stiliziranim motivom Astronomskega observatorija na Golovcu, izdana ob 50-letnici njegovega delovanja. 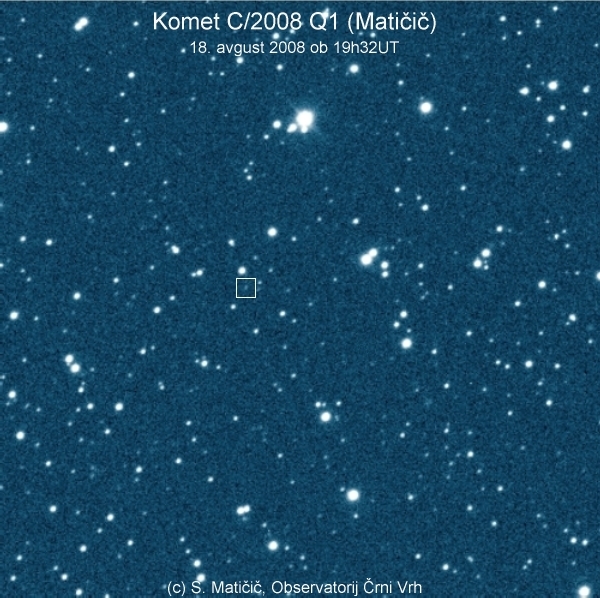 Ovojnica "Prvi dan" z obema znamkama ter stiliziranima motivoma Astronomskega observatorija na Golovcu in kometa C/2008 Q1 (Matičič) ob odkritju. On images taken by S. Matičič in the course of the Črni Vrh Asteroid and Comet Search program PIKA, an apparent supernova (mag 17.7) was detected using software for automatic discovery of static objects. 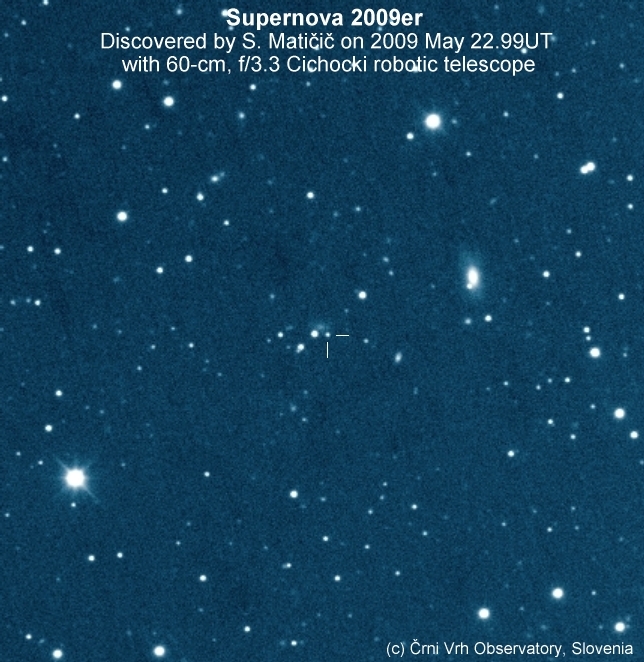 Supernova was found on four consecutive unfiltered CCD images taken around 2009 May 22.99 UT with a 0.60-m f/3.3 Cichocki Sky Survey Robotic Telescope. Composite image of supernova 2009er was made by stacking four 40 second unfiltered discovery frames taken around 2009 May 22.99UT with 60-cm, f/3.3 Deltagraph telescope. Image scale is about 1.86 arc sec/pixel. Copyright © 2008 by S. Matičič and H. Mikuž, Črni Vrh Observatory. The new object is located at RA=15h39m29s.84, Decl.=+24o26'05".3 (equinox 2000.0; uncertainty about 0".2), which is approximately 8" west and 9" south of the center of a nearby galaxy. Nothing is visible at this location on archival unfiltered PIKA images obtained on 2005 June 16 (limiting mag approximately 18.5) and 2009 Mar. 22 (limiting mag approximately 19.5). 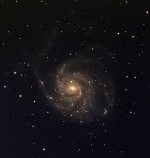 Also, nothing is visible at this position on several Digitized Sky Survey red and blue images from the Palomar Sky Survey, listed here with approximate limiting magnitudes: 1954 July 2, blue, [20.5; 1954 July 2, red, [20.0; 1990 May 17, J plate, [20.5; 1992 June 26, F plate, [20.0. 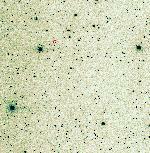 The variable was confirmed on images obtained with the discovery telescope on 2009 May 23.838 at blue mag 17.6 and red mag 17.3. 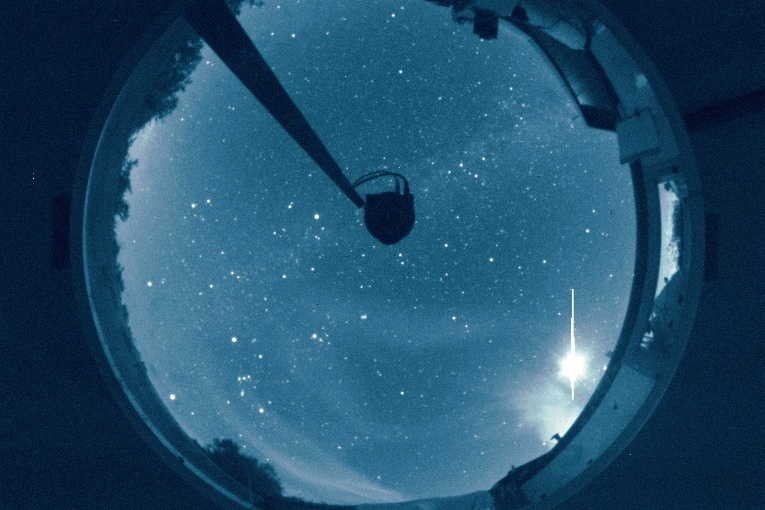 Robotic allsky camera at Crni Vrh Observatory recorded a bright fireball over the northern part of the sky. Event occured on 2009 Apr. 9, between 0h59m13s and 1h00m13s UT and was clearly detected in spite of nearly full Moon and clouds that covered most of the sky. Otherwise, only part of the fireball trail was recorded. One eye witness (located in village Prelska near Velenje, Slovenia) reported that the fireball "was bright like a full Moon". Copyright © 2009, Crni Vrh Observatory. 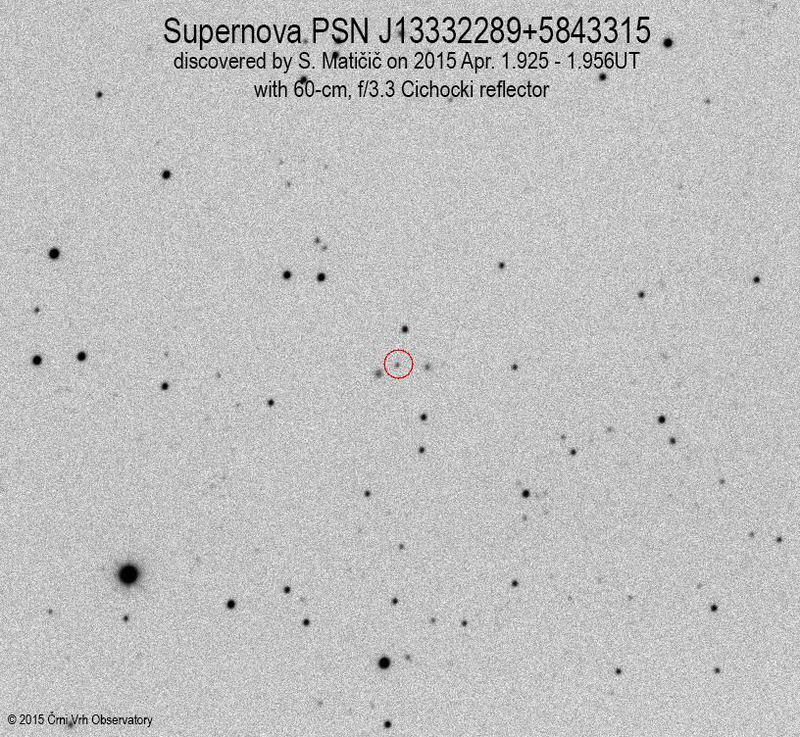 On images taken by Jan Vales in the course of the Črni Vrh Asteroid and Comet Search program PIKA, an apparent supernova (mag 18.1) was detected using software for automatic discovery of static objects. 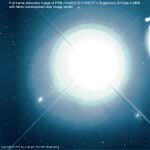 Supernova was found on four consecutive unfiltered CCD images taken around 2009 Mar. 27.00 UT with a 0.60-m f/3.3 Cichocki Sky Survey Robotic Telescope. Composite image of supernova 2009bv was made by stacking four 40 second unfiltered discovery frames taken around 2009 Mar. 27.00UT with 60-cm, f/3.3 Deltagraph telescope. Image scale is about 2 arc sec/pixel. 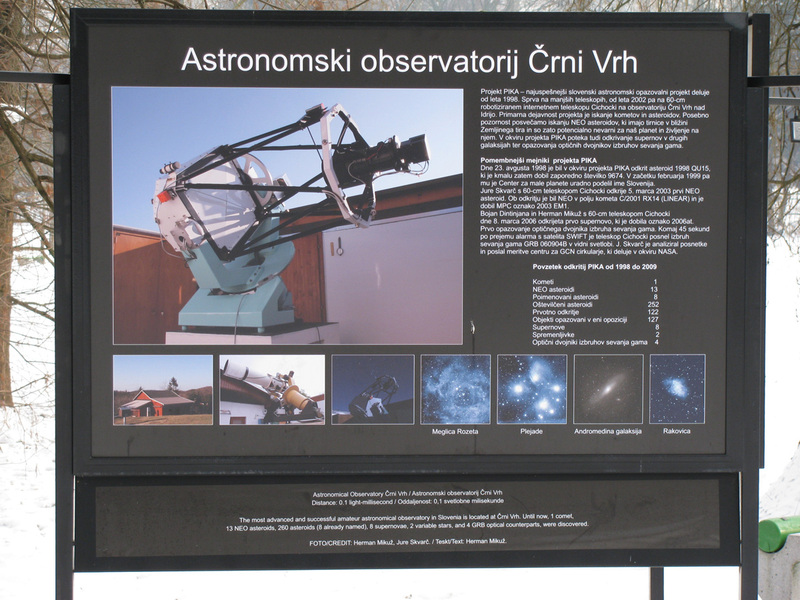 Copyright © 2008 by J. Vales and H. Mikuž, Črni Vrh Observatory. The new object is located at RA = 13h07m20s.47, Decl. = +35o47'03".8 (equinox 2000.0; uncertainty about 0".2), which is approximately 17" south of the center of IC4199. Nothing is visible at this location on archival PIKA images obtained during 2005-2009, the most recent ones being on 2008 Apr. 27 (limiting unfiltered mag 19.5) and 2009 Jan. 10 (limiting R magnitude 18). Also, nothing is visible at this position on several Digitized Sky Survey red and blue images from the Palomar Sky Survey. Discovery was announced in CBAT Electronic Telegram No. 1741. Spectroscopic observations (CBET No. 1742), obtained on Mar. 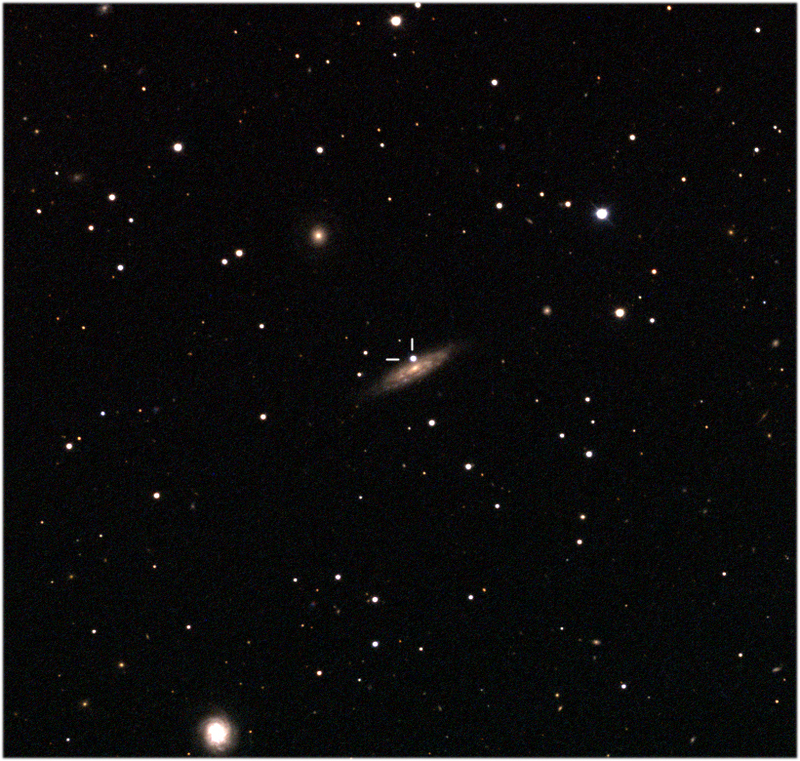 27 UT by M. Calkins with the F. L. Whipple Observatory 1.5-m telescope (+ FAST), shows it to be a type-Ia supernova about one week before maximum brightness. On the night of 13. and 14. 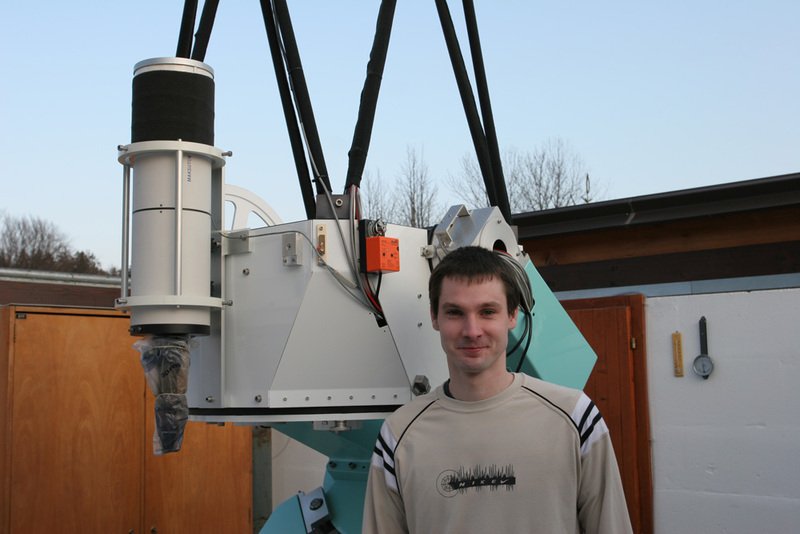 February 2009, two NEO asteroids were discovered on images taken by Stanislav Matičič (Feb. 13) and Jure Skvarč (Feb. 14) in the scope of Comet and Asteroid Search Program PIKA at Črni Vrh Observatory. Both newly discovered NEOs belong to the Apollo family. Object 2009 CN5 is classified also as a PHAs - Potentially Hazardous Asteroid. The animation shows discovery images of this object. Copyright © 2009 by S. Matičič, Črni Vrh Observatory, Slovenia. NEODyS summary data for 2009 CN5. The animation shows discovery images of this object. Copyright © 2009 by J. Skvarč, Črni Vrh Observatory, Slovenia. NEODyS summary data for 2009 CT5. We observed optical counterpart of Gamma Ray Burst GRB081126 (Swift trigger 335647) using 60 cm Cichocki robotic telescope at Črni Vrh Observatory. A new object was detected at RA=21:34:03.56, DEC=+48:42:38.62 (J2000). Series of twenty connsecutive Rc filter exposures were taken, starting at 21:35:32UT, 67 seconds after the GCN notice time. We confirm the presence of variable source, identified by Sergeev and Pozanenko (GCN Circ. 8558). The object was clearly detected on all 20 frames. Complete results are published in GCN 8569 Circular. Animation of GRB081126 outburst and decay was made by stacking 20 connsecutive 60 s exposures with R filter, obtained on 2008 Nov. 26 (21h35-21h57UT). GRB optical counterpart is marked with square. Images contain the time since the Swift GRB detection to the middle of exposure in seconds. Copyright © 2008 by J. Skvarc & PIKA project, Črni Vrh Observatory, Slovenia. On images taken by Stanislav Matičič in the course of the Črni Vrh Asteroid and Comet Search program PIKA, an apparent supernova (mag 18.2) was detected using software for automatic discovery of static objects. 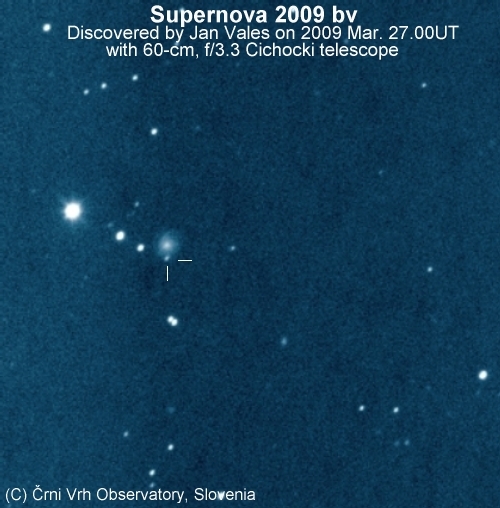 Supernova was found on four consecutive unfiltered CCD images taken around 2008 Oct. 20.74 UT with a 0.60-m f/3.3 Cichocki Sky Survey Robotic Telescope. Composite image of supernova 2008gk was made by stacking four 40 second unfiltered discovery frames taken around 2008 Oct. 20.74UT with 60-cm, f/3.3 Deltagraph telescope. Image scale is about 1.4 arc sec/pixel. 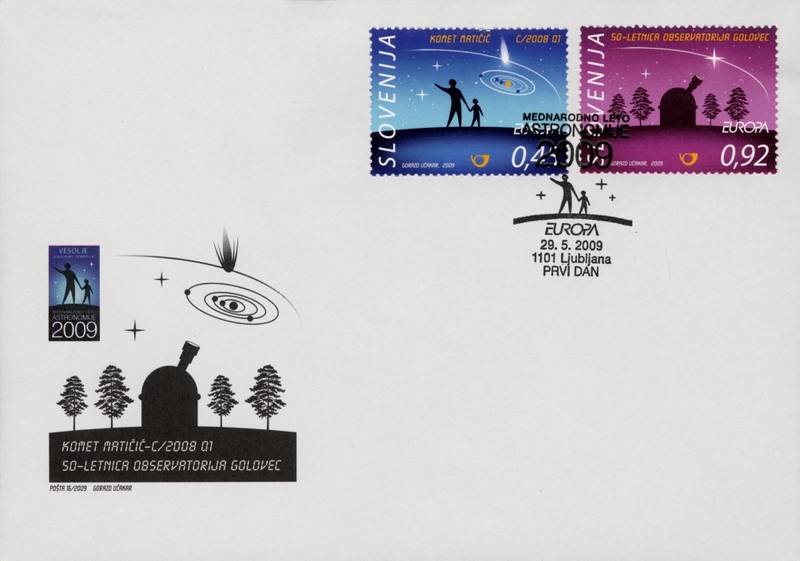 Copyright © 2008 by S. Matičič and H. Mikuž, Črni Vrh Observatory. The new object is located at R.A. =	18h53m04s.48, Decl. = +38o45'44".4 (equinox 2000.0; uncertainty about 0".2), which is approximately 7" west and 6" north of the center of a nearby uncatalogued galaxy Four PIKA R-band archival images obtained around Sept. 9.80 under moonlit conditions clearly show this object at magnitude R = 17.7 +/- 0.1. 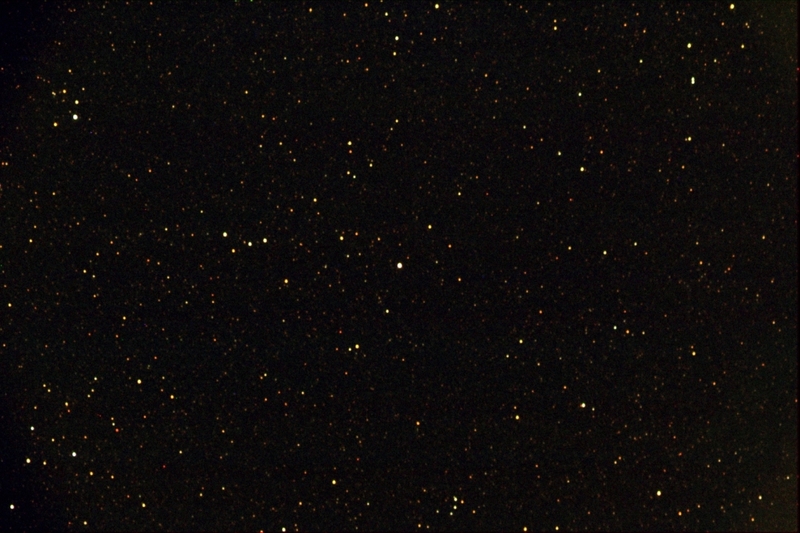 Nothing is visible at this position on unfiltered archival PIKA images obtained on 2005 July 4 (limiting magnitude 18.5) or on several Digitized Sky Survey red and blue images from the Palomar Sky Survey. Discovery was announced in CBAT Electronic Telegram No. 1544. Spectroscopic observations (CBET No. 1548), obtained on Oct. 22 UT with the 3-m Shane reflector (+ Kast) at Lick Observatory, shows it to be a type-Ib/c supernova. 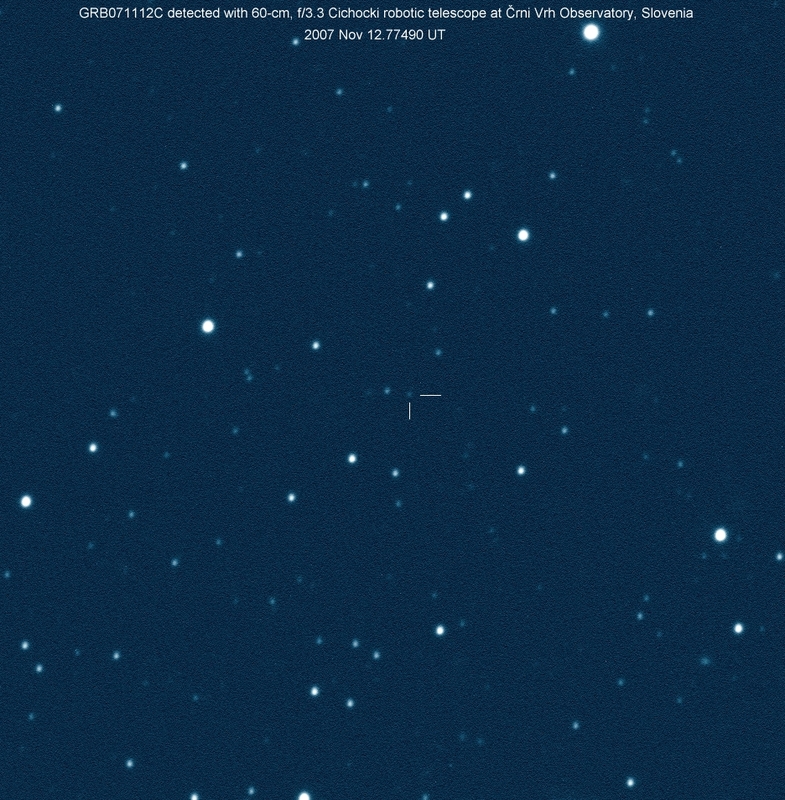 A tiny asteroid (about 3 meter wide) 2008 TC3 was discovered on 2008 Oct. 6.27767UT by astronomers at Mt. Lemmon in Arizona, a day before it entered the atmosphere in Northern Sudan and exploded. Asteroids the size of 2008 TC3 hit Earth several times a year, but this is the first time one has been discovered before it hit. The video shows animated motion between the stars, just few hours before the impact at 2h46 UT on October 7, 2008. This false color animation was composed from series of 20 second unfiltered exposures, obtained remotely during the NEO approach on 2008 Oct. 6 (19h15-21h43UT) with 60-cm, f/3.3 Cichocki telescope, and CCD. The telescope was programmed to precisely follow asteroid motion. Image scale is 2.79 arc sec/pixel. Movie composed and Copyrighted to © 2008 J. Skvarč, Črni Vrh Observatory. On the night of 4-5 October 2008 a new NEO asteroid was discovered on images taken by Herman Mikuž in the scope of Comet and Asteroid Search Program PIKA at Črni Vrh Observatory. After the measurements were published on NEOCP the object was confirmed by several observatories worldwide. The orbital elements reveal that this object belongs to the Amor family of asteroids. Closest approach to Earth will be on 2008 Oct. 20 at 0.307AU. The object is designated as 2008 TR2 by the Minor Planet Center. The orbital period is 2.35 years. The animation shows discovery images of this object. Copyright © 2008 by H. Mikuž, Črni Vrh Observatory, Slovenia. Delta-Aurigids are weak meteor shower, active between September 18 — October 10, with ZHR about 3. The maximum is not well defined and is presumed to occur between 2008 September 23 - October 3. September 28 is about the middle of this peak interval. This Delta Aurigid fireball animation is composed from 6 consecutive 1 minute exposures, obtained on 2008 Sep. 30, between 2h26m17s and 2h32m37sUT with remote all-sky camera. The fireball left a train of ionized gas that persisted for more than 6 minutes. It quickly changed the shape as it was blown by winds some 100 kilometers above the ground. Copyright © 2008 by Crni Vrh Observatory. On images taken by Jure Zakrajšek in the course of the Črni Vrh Asteroid and Comet Search program PIKA, an apparent supernova (mag 16.7) was detected using software for automatic discovery of static objects. 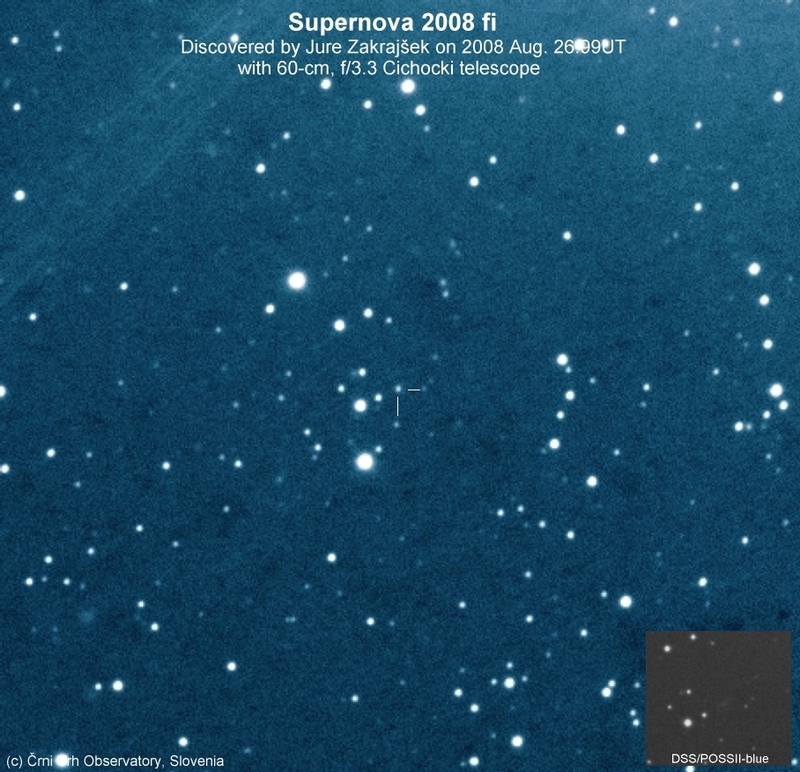 Supernova was found on four consecutive unfiltered CCD images taken around 2008 Aug. 26.99 UT with a 0.60-m f/3.3 Cichocki Sky Survey Robotic Telescope. Composite image of supernova 2008fi was made by stacking four 40 second unfiltered discovery frames taken around 2008 Aug. 26.99UT with 60-cm, f/3.3 Deltagraph telescope. The inserted DSS image shows the area around the supernova host galaxy (barely visible on discovery image) to approximately the same scale. Image scale is about 0.9 arc sec/pixel. 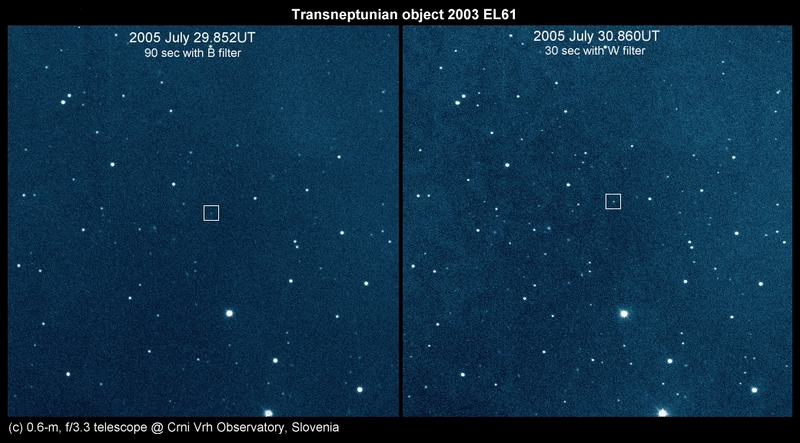 Copyright © 2008 by J. Zakrajšek and H. Mikuz, Črni Vrh Observatory. The new object is located at R.A. = 1h53m23s.17, Decl. = +29o21'28".4 (equinox 2000.0), which is approximately 2" east and 2" south of the center of a nearby faint galaxy. Nothing is visible at this location on several Palomar Sky Survey images from the Aladin database. Nothing is visible at this location even on archival PIKA images, obtained on 2003 Sept. 26, 2007 July 19 and 2008 Aug. 2 (limiting magnitude 18.5-19.0). Additional photometry of 2008fi obtained with the 60-cm Cichocki reflector: 2008 Aug. 29.01, R = 17.47 +/- 0.02, V = 17.53 +/- 0.03; Sept. 2.91, R = 17.55 +/- 0.1; V = 17.80 +/- 0.1. Discovery was announced in CBAT Electronic Telegram No. 1493. Spectroscopic observations (CBET No. 1499), obtained on Sep. 4.0 UT with F. L. Whipple Observatory 1.5-m telescope (+ FAST), shows it to be a type-IIb supernova at about maximum light. 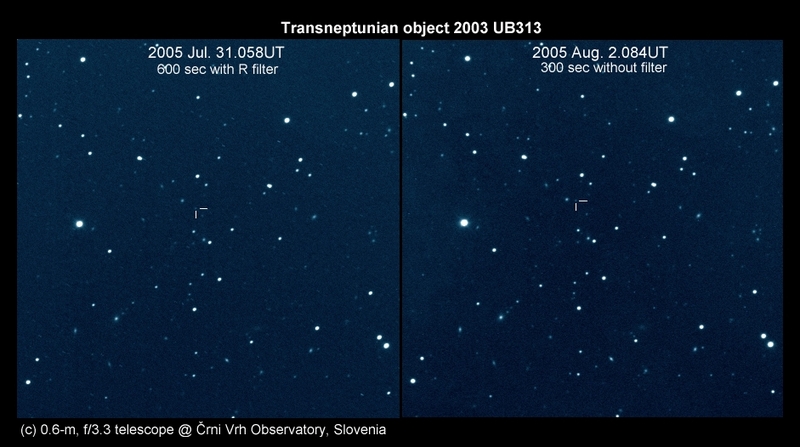 On the night of 24 August 2008 an object with unusual motion was automatically detected on the images taken by Jure Skvarč in the scope of Comet and Asteroid Search Program at Črni Vrh Observatory. After the measurements were published on NEOCP the object was confirmed by several observatories worldwide. The orbital elements reveal that this object belongs to the Apollo family of asteroids. It will cross the Earth orbit mid-January 2009. Since it can approach Earth orbit closer than 0.05 AU and is big enough to cause substantial damage (500 - 1000 meter diameter), it is classified as a PHA - Potentially Hazardous Asteroid. At this moment the orbit is not well enough determined to estimate the risk of impact but probability is probably close to 0. Currently there are 976 PHAs. The object is designated as 2008 QT3 by the Minor Planet Center. Orbital elements after one day of observations show that it orbits the Sun in an elliptical orbit at a distance between 0.97 and 1.97 AU and an inclination of 7 degrees. The orbital period is 2.8 years. The animation shows discovery images of this object. Copyright © 2006 by J. Skvarč, Črni Vrh Observatory, Slovenia. On images taken by S. Matičič in the course of the Črni Vrh Asteroid and Comet Search program PIKA, on August 18, 2008 an object with unusual motion was automatically detected. A new comet (first comet discovery from Črni Vrh Observatory) was detected on images taken between 2008 Aug. 18.81364UT and 18.84247UT with a 0.60-m f/3.3 Cichocki Sky Survey Telescope. Further inspection of series of 1 minute unfiltered followup exposures obtained with the same telescope around 2008 Aug. 19.816UT show that this object has diffuse appearance (coma dia. ~10 arc sec) with strong condensation. After being posted on NEO Confirmation Page, additional measurements were obtained by several observatories. The discovery was announced in IAU Circular 8966. Complete observations and preliminary parabolic orbit were published in MPEC 2008-Q12. 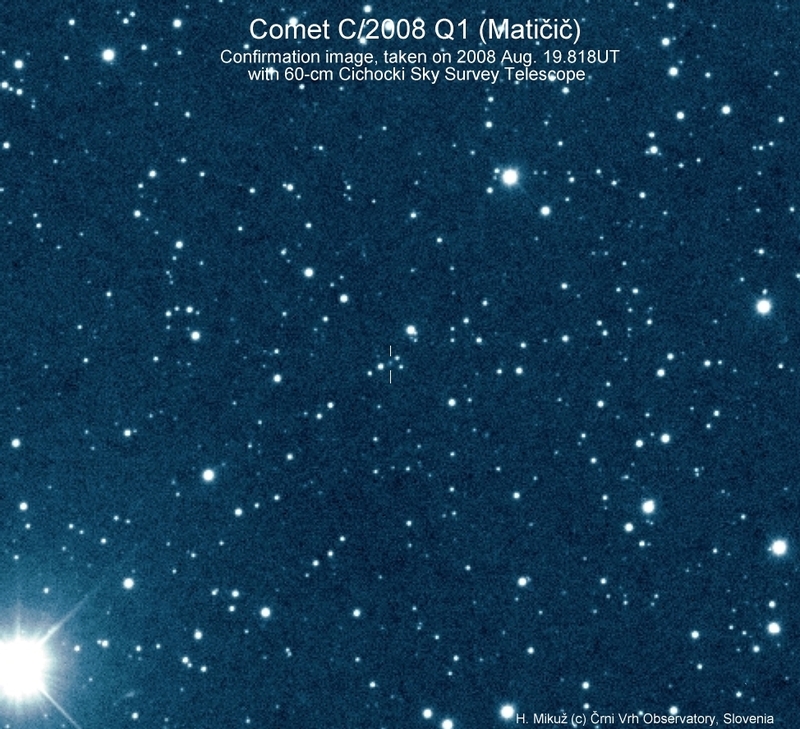 Comet C/2008 Q1 (Matičič) discovery image, obtained on 2008 Aug. 18 at 19h32UT with 0.60-m f/3.3 Cichocki Sky Survey Telescope at Črni Vrh Observatory. Image scale is 1.86 arc sec/pixel. 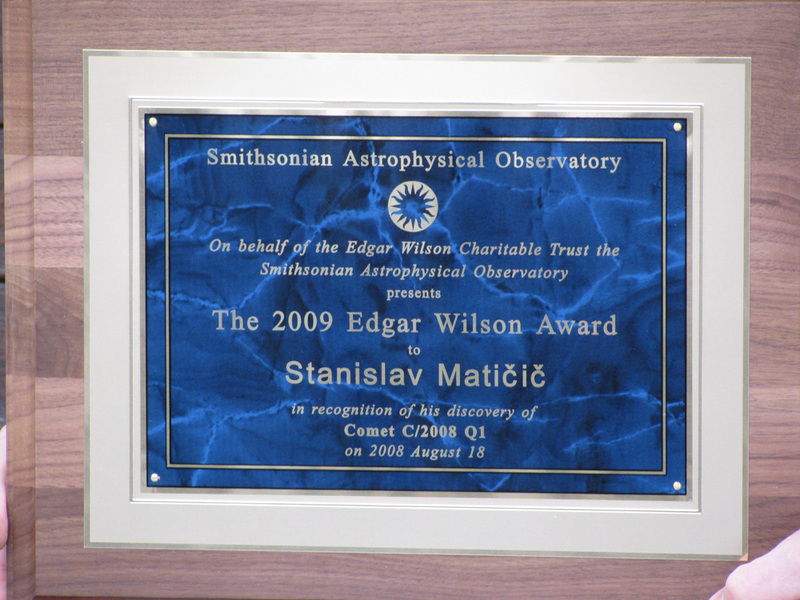 Copyright © 2008 by S. Matičič, Črni Vrh Observatory. Animation image was made by stacking four 40 second discovery frames, taken between 2008 Aug. 18.814UT and 18.842UT with a 0.60-m f/3.3 Cichocki Sky Survey Telescope at Črni Vrh Observatory. Image scale is 1.86 arc sec/pixel. At the time of discovery, the comet was of magnitude 17.8 and moved at 1.4 arc sec/min in PA 255 degree. Copyright © 2008 by S. Matičič, Črni Vrh Observatory. 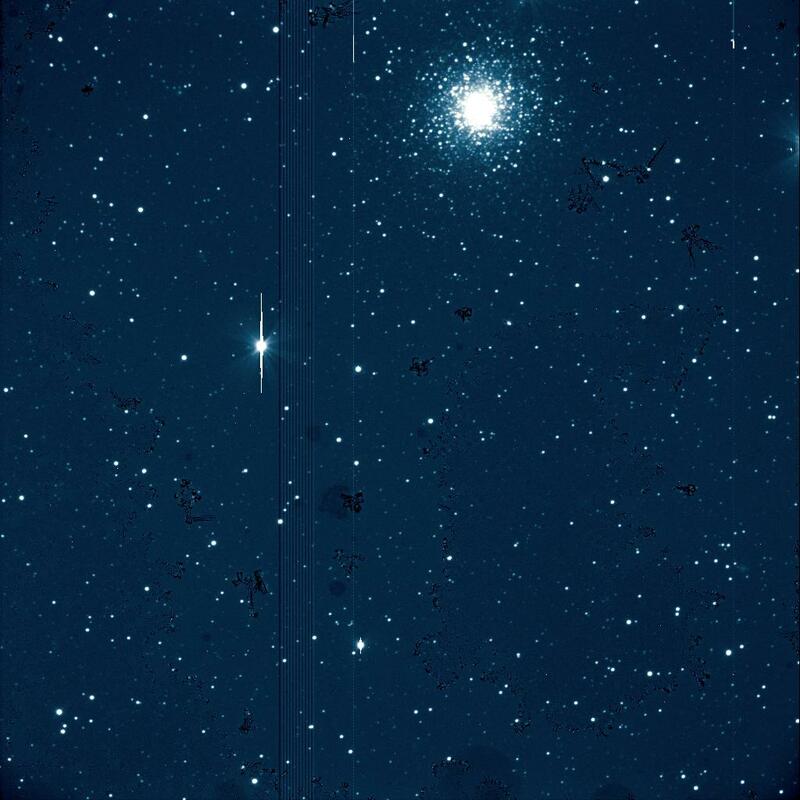 Series of 60 second followup images were obtained around 2008 Aug. 19.818UT (left image) with the same telescope. The object cometary appearance with ~10 arc second diameter coma is clearly visible. Image scale is 0.93 arc sec/pixel. 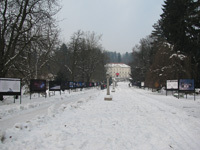 Copyright © 2008 by H. Mikuž, Črni Vrh Observatory. High activity of Perseids meteor stream was recorded during the nights of 2008 Aug. 11-12 and 12-13. 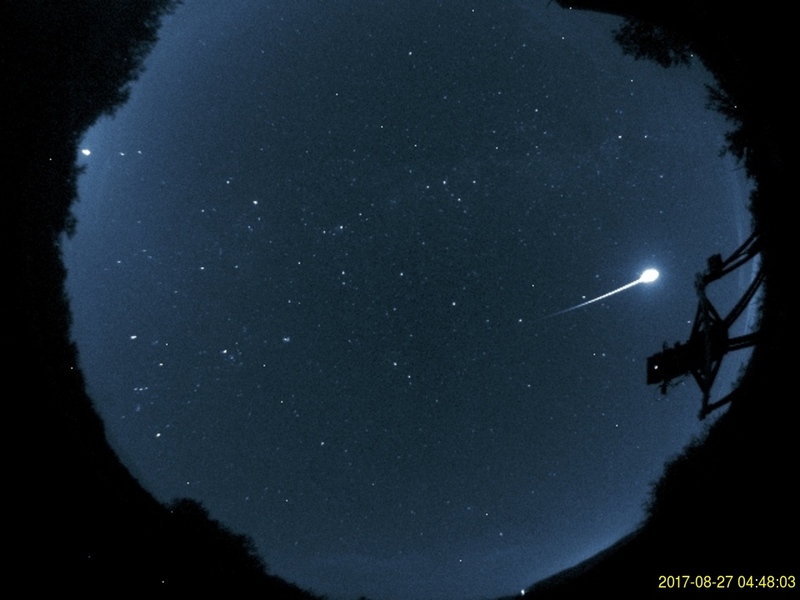 Several fireballs and meteors were recorded with newly set up Deep All Sky Camera, comprising Peleng 3.5/8 mm fisheye lens and FLI 1024 x 1024 back illuminated CCD camera. The camera lens was stopped to f/5.6 to give sharper images on standard 90 second exposures. Occasional cloud passages slightly affected observations. All images have dark and bias subtracted. Two Perseid meteors recorded with Deep All Sky Camera on 2008 Aug. 11, starting at 23h21m34s UT. Exposure time was 90 seconds. Copyright © 2006 by H. Mikuž, Črni Vrh Observatory, Slovenia. The Alpha Capricornid meteor shower is active from mid-July to mid-September. 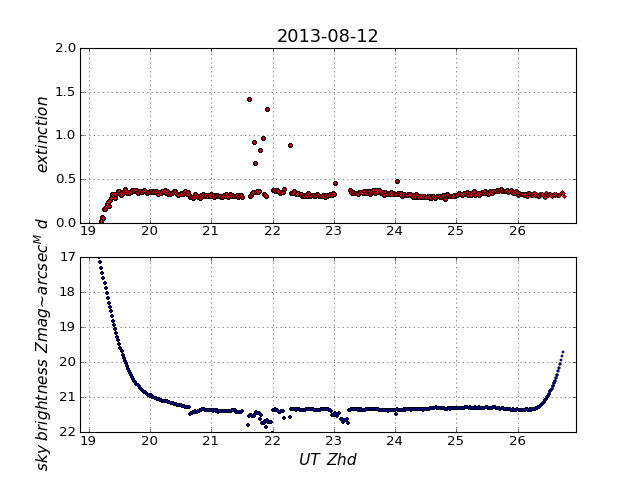 Maximum seems to have several activity peaks (July 22, July 28 and August 5) with ZHR ranging from 6-14 meteors. The shower has the reputation of producing some of the brightest meteors of the major showers, with the average magnitude being estimated as about 2.2. 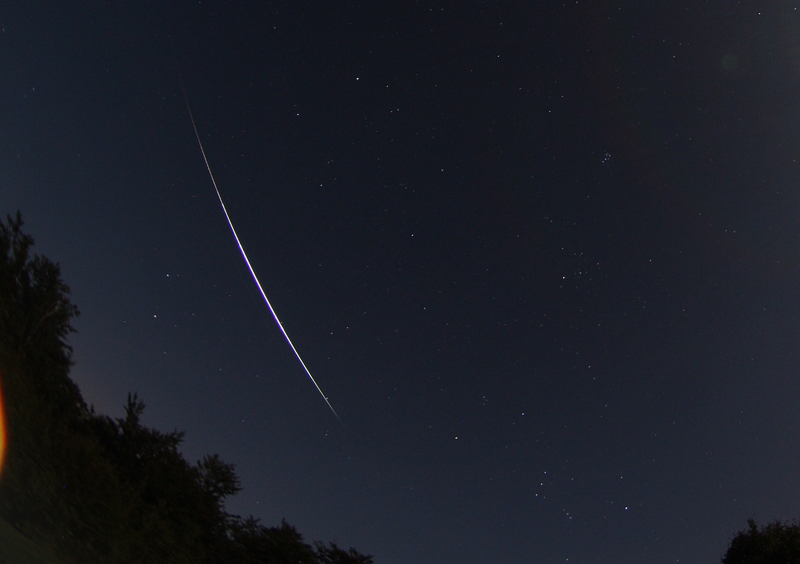 More on Meteor Showers Online. This false color fireball image was obtained on 2008 Aug. 3 at 23h50m01sUT (center of exposure) with robotic all-sky camera. Exposure time was 1 minute. Copyright © 2008 by Crni Vrh Observatory. During the April. 30. - May 4, 2008, a group of Dark Sky Slovenia members visited Lastovo Island in southern Adriatic. The aim of visit was to check the quality of night sky and verify it by obtaining images and instrumental measurements. Since the island is far away from large urban areas and with population of only around 800, we expected exceptionally dark night sky. In September 2006, Lastovo and surrounding islands were designated the Lastovo Archipelago Nature Park by Croatian Parliament. Unprocessed 300 second guided exposure obtained on 2008 May 3 at 1h16UT (start) with Canon 5D camera at ISO 1000 and 8mm, f/3.5 Sigma fisheye lens. North is up, East to the left. Illuminated clouds and skyglow over the NW, N and NE horizon indicate the sources of light pollution along the Dalmatian coast and islands north of Lastovo. The sky is very dark in other directions. Copyright © 2008 by H. Mikuz and A. Mohar, Dark Sky Slovenia. Unprocessed 180 second guided exposure of our Galaxy center in Sagittarius. Image was obtained on 2008 May 3 at 2h01UT (start) with Canon 5D camera at ISO 1000 and 50mm, f/3.5 Asahi Pentax lens. North is up, East to the left. Copyright © 2008 by H. Mikuz and A. Mohar, Dark Sky Slovenia. Unprocessed 180 second guided exposure of Milky Way over the Adriatic Sea. 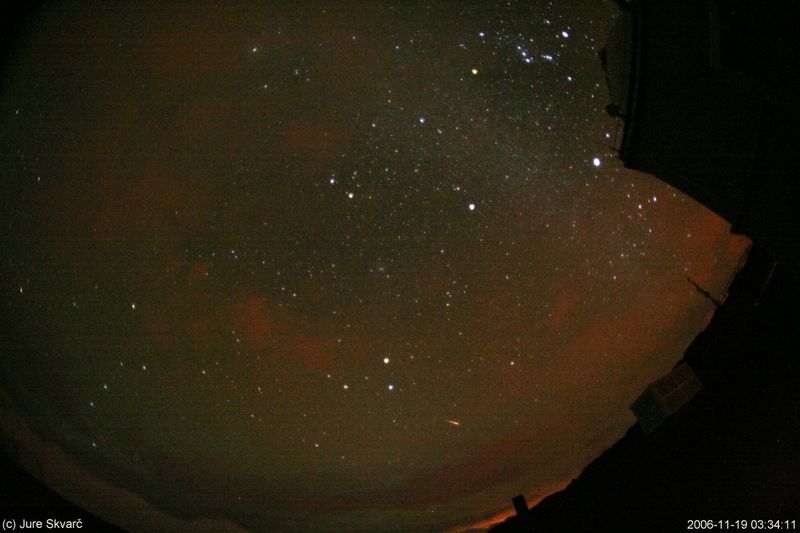 Image was obtained on 2008 May 4 at 0h56UT (start) with Canon EOS 20D camera at ISO 1600 and 8mm, f/4 Peleng fisheye lens. Reflections of planet Jupiter and even Sagittarius star cloud are clearly visible in the sea. Such reflections are visible only at very dark locations! The skyglow on left is from Dubrovnik, 100 km away. Skyglow sources toward the S-SW direction, coming from the Italian coast are clearly visible, although they are about 180 km away. Copyright © 2008 by H. Mikuz and A. Mohar, Dark Sky Slovenia. Although our night sky monitoring on Lastovo was limited to only three nights, there is strong evidence that the sky is very dark, no doubt one of the darkest in Europe. Some light pollution is arriving from urban areas in Dalmatian and Italian coast as well as from towns/villages on Lastovo and Korcula. Because of growing tourism, state and local authorities should consider to protect this nice location from LP in future. Action should be taken on two levels: if Croatia will adopt similar law as Slovenia (zero emission over the 90o), the LP will be efficiently controlled. A less effective possibility would be to adopt the law in local Lastovo commune. This would at least reduce emission from local unshielded light sources. Most of outside lighting in Lastovo, Ubli, Skrivena Luka and Pasadur is very old and need to be replaced in near future. Now it is nice opportunity to choose and set up fully shielded lamps and help to preserve this excellent location to future generations. Lastovo has a good potential to became a European center of astro tourism which is not limited only to summer but would be of interest all over the year. Nova was discovered on Apr. 18.784 UT by K. Nishiyama (Kurume, Fukuoka-ken, Japan) and F. Kabashima (Miyaki-cho, Saga-ken, Japan) using a 105-mm f/5.6 camera lens. The nova was at magnitude 8.4, having the following precise position: R.A.= 18h05m58s.88, Decl. = -27o13'56".0 (equinox 2000.0). This false color unfiltered image of nova (in field center) was obtained on 2008 Apr. 20.116UT with 19-cm, f/4 flat filed S-C camera and CCD. Image scale is 2.44 arc sec/pixel. Copyright © 2008 by H. Mikuz, Crni Vrh Observatory. Image of total Moon Eclipse, obtained on 2008 Feb. 21 (3h22UT) with 10-cm, f/10 Maksutov-Cassegrain telescope and Canon EOS 20D DSLR camera. Exposure time was 15 seconds. Camera gain set to ISO 400. All images were taken from Slovenske Gorice, region in NE part of Slovenia. Copyright © 2008 by H. Mikuz and J. Vales, Crni Vrh Observatory. On January 29, 2008, NEO asteroid 2007 TU24 passed the Earth at a distance of 0.0046 a. u. (690.000 kilometers), which is less than twice the Earth-Moon distance. This false color animation was composed from series of 5 second exposures, obtained remotely during the NEO closest approach on 2008 Jan. 29/30 (22h10-4h00UT) with 60-cm, f/3.3 Cichocki telescope, R filter and CCD. The telescope was programmed to precisely follow asteroid flyby. Image scale is 2.49 arc sec/pixel. Copyright © 2008 by J. Skvarc and H. Mikuz, Crni Vrh Observatory. High resolution DivX movie (5Mb). High resolution AVI movie (28Mb). This false color image of NEO asteroid 2007 TU24 was obtained during the NEO closest approach on 2008 Jan. 29 (21h26-21h31UT) with 60-cm, f/3.3 Cichocki telescope, R filter and CCD. Exposure time was 5 minutes. The object brightness was about magnitude 10 and moved accross the northern sky at about 2 degrees per hour. Image scale is 2.49 arc sec/pixel. Copyright © 2008 by J. Skvarc and H. Mikuz, Crni Vrh Observatory. Flyby ephemeris for 106 Crni Vrh Observatory. We observed optical counterpart of Gamma Ray Burst GRB071112C (Swift trigger 296504) using 60 cm Cichocki robotic telescope at Črni Vrh Observatory. A new object was detected at RA=02:36:50.95, DEC=+28:22:16.8 (J2000). Series of nineteen connsecutive Rc filter exposures were taken, starting at 18:35:51UT, 118 seconds after the GCN notice time. 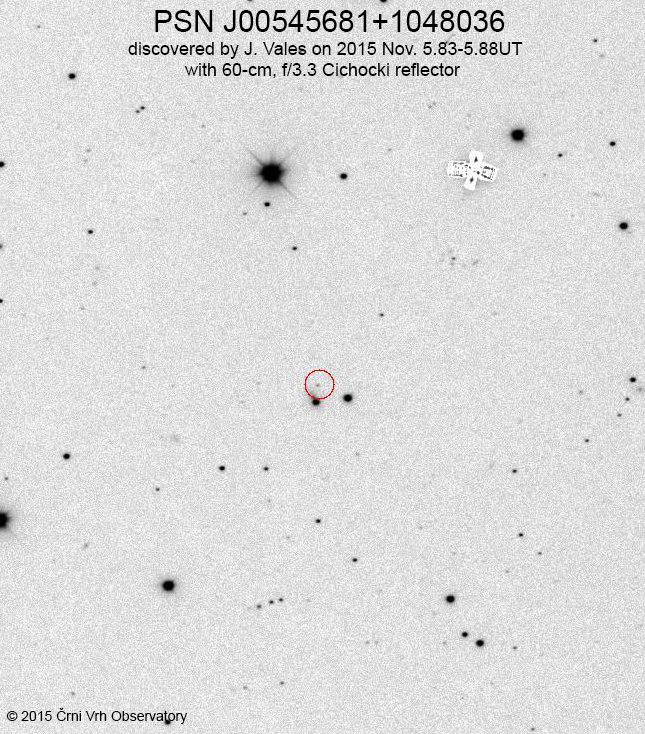 We confirmed optical afterglow found by UVOT. The object was clearly detected on first nine frames after which it dropped below the detection limit. Complete results are published in GCN 7078 Circular. A 90 second R filter image above was obtained on 2007 Nov 12.77490UT and clearly show the GRB optical counterpart (marked) in outburst at R=17.25 magnitude. The object faded rapidly below the detection limit. Copyright © 2006 by S Maticic & PIKA project, Črni Vrh Observatory, Slovenia. On images taken by S. Maticic in the course of the Crni Vrh Asteroid and Comet Search program PIKA, an apparent bright supernova (mag 14.4) was detected using software for automatic discovery of static objects. 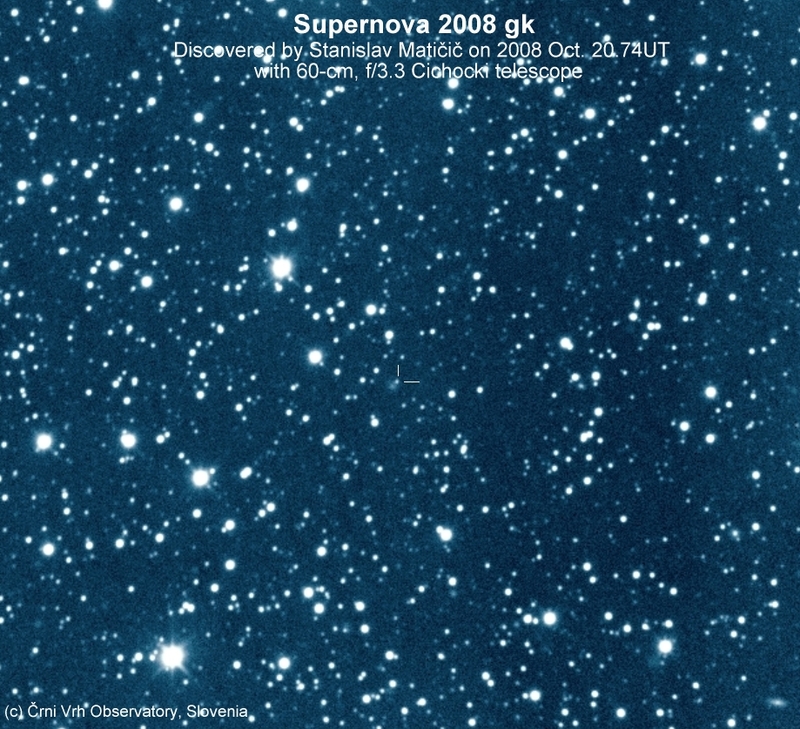 Supernova was found on four consecutive unfiltered CCD images taken around Nov. 2.850 UT with a 0.60-m f/3.3 Cichocki Sky Survey Robotic Telescope. Composite image of supernova 2007od was made by stacking four 40 second unfiltered discovery frames taken around 2007 Nov. 2.850UT with 60-cm, f/3.3 Deltagraph telescope. Image scale is 1.8 arc sec/pixel. Copyright © 2007 by S. Maticic, Crni Vrh Observatory. The new object is located at R.A. = 23h55m48s.68, Decl. = +18o24'54".8 (equinox 2000.0), which is approximately 38" east and 31" south of the center of the nearby galaxy UGC 12846. Nothing is visible at this location on PIKA archive images obtained on 2004-09-11, 2005-09-30, 2006-09-01, 2006-09-20 and 2006-10-18. Limiting magnitude on this images is 18.5 - 19.0. We checked POSS2/UKSTU Red, POSS2/UKSTU Blue, POSS2/UKSTU IR, POSS1 Red and POSS1 Blue at STSCI archives but there was no trace of any object at this position. Confirming images of 2007od, obtained with the 60-cm Cichocki reflector on Nov. 3.713 reveal magnitudes R = 13.9 and B = 14.5. Discovery was announced in CBAT Electronic Telegram No. 1116. Spectroscopic observations (CBET No. 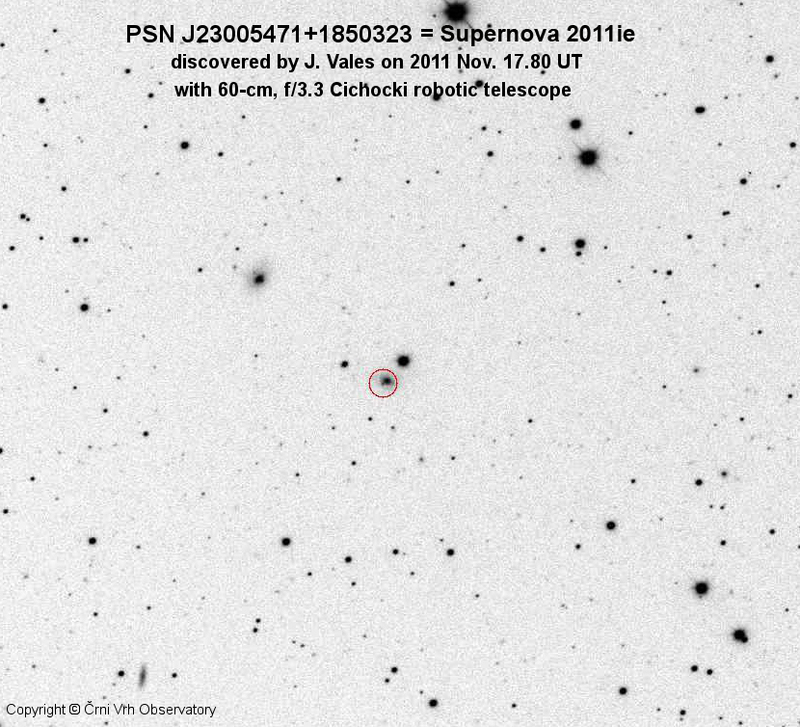 1119), obtained on Nov. 4.11 UT with F. L. Whipple Observatory 1.5-m telescope shows it to be a type-II supernova about two weeks past the explosion. 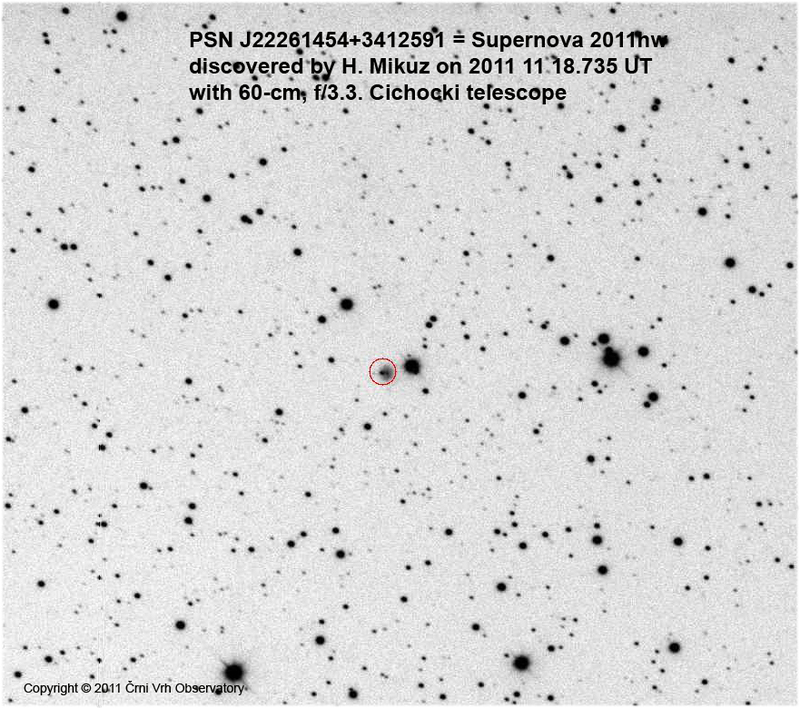 On images taken by H. Mikuz in the course of the Crni Vrh Asteroid and Comet Search program PIKA, an apparent supernova (mag 17.1) was detected using software for automatic discovery of static objects. Supernova was found on four consecutive unfiltered CCD images taken around Sept. 22.90 UT with a 0.60-m f/3.3 Cichocki Sky Survey Robotic Telescope. Composite image of supernova 2007kg was made by stacking four 25 second discovery frames taken around 2007 Sept. 22.90UT with 60-cm, f/3.3 Deltagraph telescope, operating in Scanning Along the Great Declination Circles mode. The inserted DSS image shows the area around the supernova host galaxy (barely visible on discovery image) to approximately the same scale. Image scale is about 1.5 arc sec/pixel. Copyright © 2007 by H. Mikuz, Crni Vrh Observatory. The new object is located at R.A. = 23h58m37s.43, Decl. = +60o59'06".7 (equinox 2000.0), which is approximately 7".0 east and 6".0 north of the center of a nearby faint galaxy. Nothing is visible at this location on several Palomar Sky Survey images (limiting B and I magnitudes 20.0; limiting R mag 20.5) and 2MASS images from the Aladin database. Further confirming CCD photometry with the same telescope on Sept. 23.974 using the USNO-B1 R2 catalogue yields R = 17.17 +/- 0.04 and B = 18.62 +/- 0.10. Discovery was announced in CBAT Electronic Telegram No. 1086. Spectroscopic observations (CBET No. 1095), obtained with F. L. Whipple Observatory 1.5-m telescope shows it to be a type-Ia supernova about three months past maximum. A new star-like object with coordinates ra=03:57:28.01, dec=+35:37:16.3 (J2000) was found by H. Mikuž on unfiltered CCD images (limiting mag 19.0) in the course of the PIKA project with the 0.60-m f/3.3 Cichocki telescope at Črni Vrh Observatory. The object was visible on all four images of the same region taken around 2007 Sep. 16.078UT. The magnitude was 17.9+-0.05, (using comparison stars from USNO B catalog), roughly equivalent to R band and no motion was detected for this object. Nothing is visible at this location on our archive images with 19.0 limiting magnitude taken on 2005-01-11, 2004-02-09 and 2003-09-26, as well as on several POSS and 2MASS images from the Aladin database. However, the object position is consistent with USNO-B1 catalogue star 1256-0061977 with B magnitude 21.51. MPC checker returned no hits of slowly moving objects at this location. Discovery image is a 25 second exposure obtained in Drift Scan Along the Declination Circles mode, now used in searching for new objects. The variable star was found using software for detection of new static objects. Copyright © 2007 by H. Mikuz. Crni Vrh Observatory team member Jure Skvarc observed the 2007 Perseids next to the Jacobus Kapteyn Telescope on the Roque de los Muchachos mountain on La Palma Island. The night was perfectly clear with some wind but it did not affect observations. The images were taken on the night of Aug. 12-13, 2007 using a Canon 350D digital camera and 8 mm/f3.5 Peleng fisheye lens on static photo mount. The camera was controlled from a notebook computer. He obtained dusk to dawn long series of 30 second exposures at ISO 1600 and composed a (61 MB) AVI video animation. A 47 MB WMV video animation is also available. 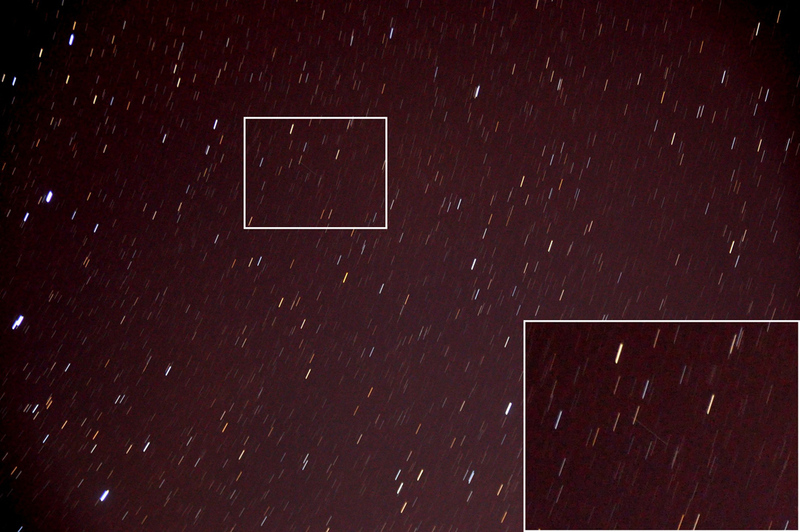 The image with bright Perseid shown on left is a 30 second exposure at ISO 1600, starting on Aug. 13 at 2h05m55sUT. 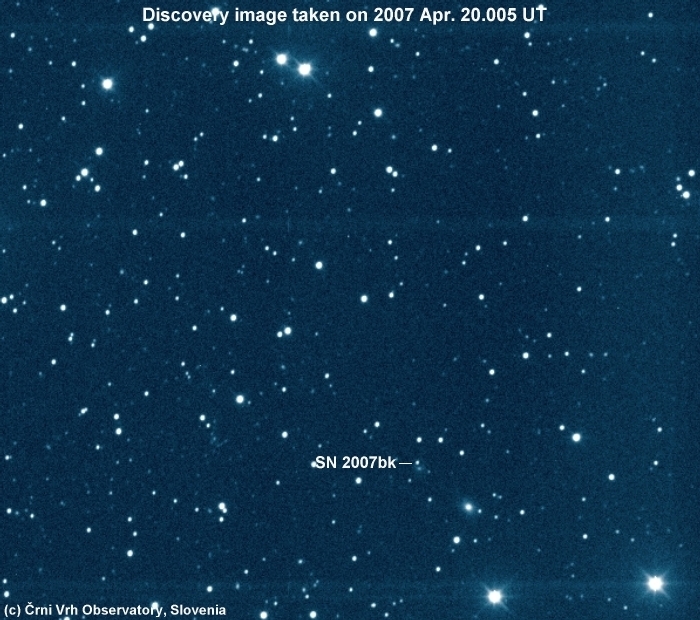 Copyright © 2007 by J. Skvarc, Crni Vrh Observatory. 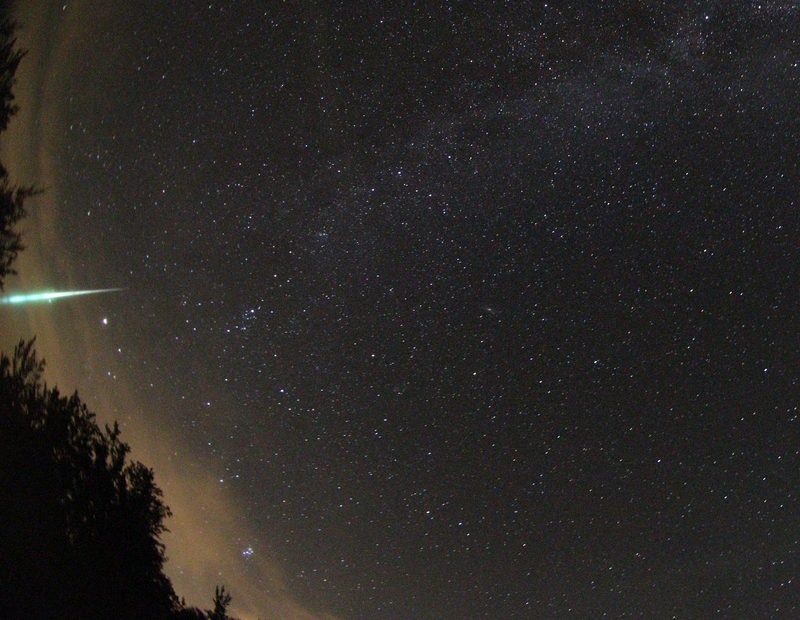 Another bright Perseid meteor was recorded just before dawn on Aug. 13 at 4h43m08sUT. Also there is conspicious zodiacal light extending from just rising constellation Gemini up to Taurus. 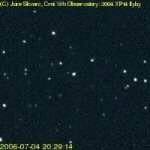 Copyright © 2007 by J. Skvarc, Crni Vrh Observatory. Bright fireball of about magnitude -8 was recorded over the eastern horizon with the All-Sky camera on 2007 Apr. 22 at 23h11m25s UT (center). Trace of fireball afterglow and its motion toward the south is evident on several successive exposures. The animation was prepared by Javor Kac and cover the time span of about 8 minutes. Copyright © 2007 by J. Kac and Crni Vrh Observatory. On images taken by H. Mikuz in the course of the Crni Vrh Asteroid and Comet Search program PIKA, an apparent supernova (mag 16.5) was detected using software for automatic discovery of static objects. Supernova was found on four consecutive unfiltered CCD images taken around Apr. 20.005 UT with a 0.60-m f/3.3 Cichocki Sky Survey Telescope. Composite image of supernova 2007bk was made by stacking four 25 second discovery frames taken around 2007 Apr. 20.005UT with 60-cm, f/3.3 Deltagraph telescope, operating in Scanning Along the Great Declination Circles mode. Image scale is 2.49 arc sec/pixel. Copyright © 2007 by H. Mikuz, Crni Vrh Observatory. 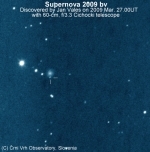 Supernova 2007bk as displayed in user interface for verification of new object candidates. Copyright © 2007 by B. Dintinjana, Crni Vrh Observatory. The new object is located at R.A. = 15h28m45s.58, Decl. = +58o52'12".8 (equinox 2000.0), which is approximately 5".0 east and 12".5 north of the center of a nearby faint galaxy. Nothing is visible at this location on three consecutive unfiltered PIKA images obtained on 2005 Apr. 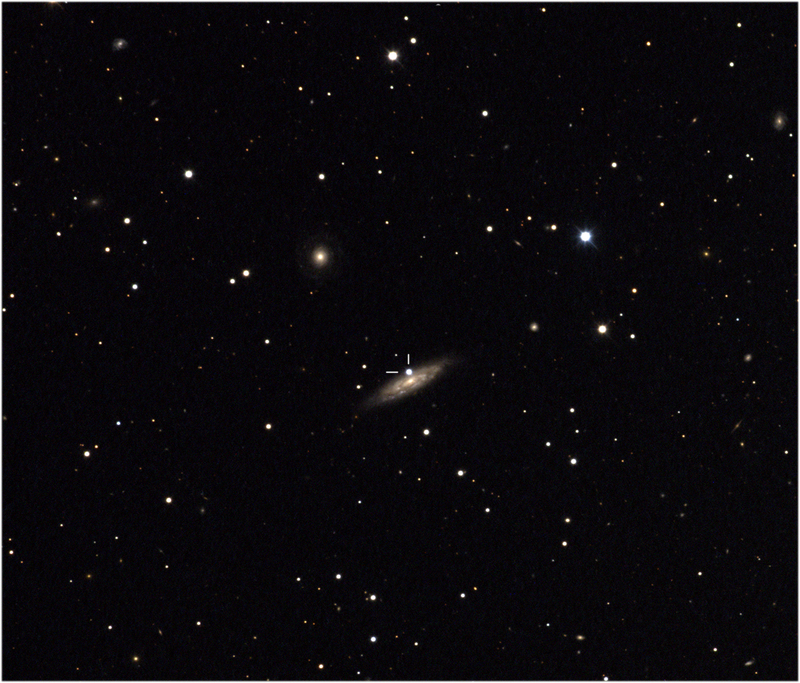 4.882 (limiting mag 18.5) or on several Palomar Sky Survey and 2MASS images from the Aladin database. A confirming R-filtered image of 2007bk taken on Apr. 20.950 yields magnitude R = 16.65 +/- 0.02. Discovery was announced in CBAT Electronic Telegram No. 933. Spectroscopic observations (CBET No. 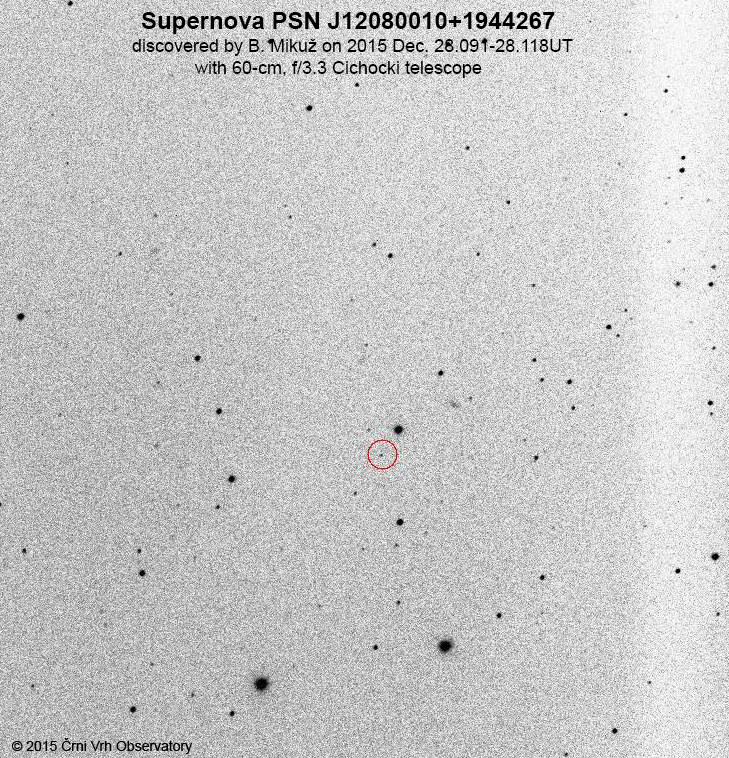 937), obtained with Heute Provence Observatory 1.93-m telescope shows it to be a type-Ia supernova around 50 days after maximum. We observed optical counterpart of Gamma Ray Burst GRB070411 (Swift trigger 275087) using 60 cm Cichocki robotic telescope at Črni Vrh Observatory. A variable object was detected at ra=07:09:19.95, dec=+01:03:52.8. 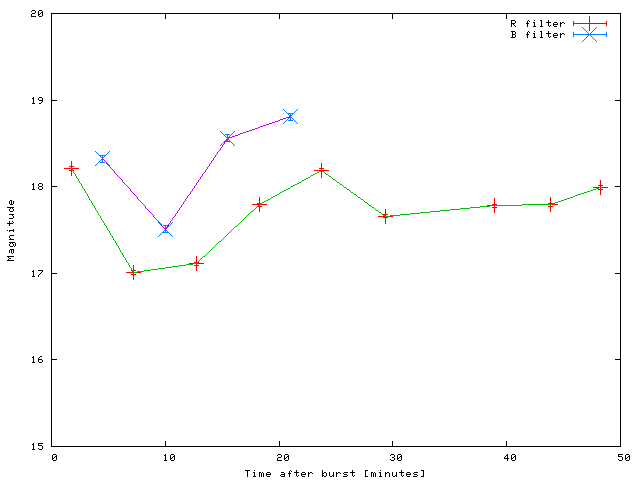 Alternating exposures using R and B photometric filters were taken. Full results are published in GCN 6270 Circular. Detailed B and R photometry, confirming the object rebrightening was performed and published in GCN 6288 Circular. A 90 second R filter image above was obtained on 2007 Apr 11 20:19:31UT and clearly show the GRB optical counterpart (green circle) in outburst at R=18.2 magnitude and the surrounding comparison stars used in analysis. The object faded rapidly below the detection limit. The first image with GRB detection started only 48 seconds after the receipt of SWIFT alert. Copyright © 2006 by B. Dintinjana and H. Mikuz, Črni Vrh Observatory, Slovenia. Those interesting to study our original images may download them here. It is a 15MB tar file, including 12 individual exposures in B and R filters. In case you intend to publish results, obtained from our images, please credit them to PIKA program at Črni Vrh Observatory, Slovenia. On 10-11 March 2007 a small asteroid 2007 EH flew by the Earth at a distance of only 165000 km. At a point of the closest approach it had sky motion of about 20 arc-minutes / minute. In spite of the cloudy weather we managed to make more than 300 images of this object and composed an animation showing the curved trajectory relative to the star field. 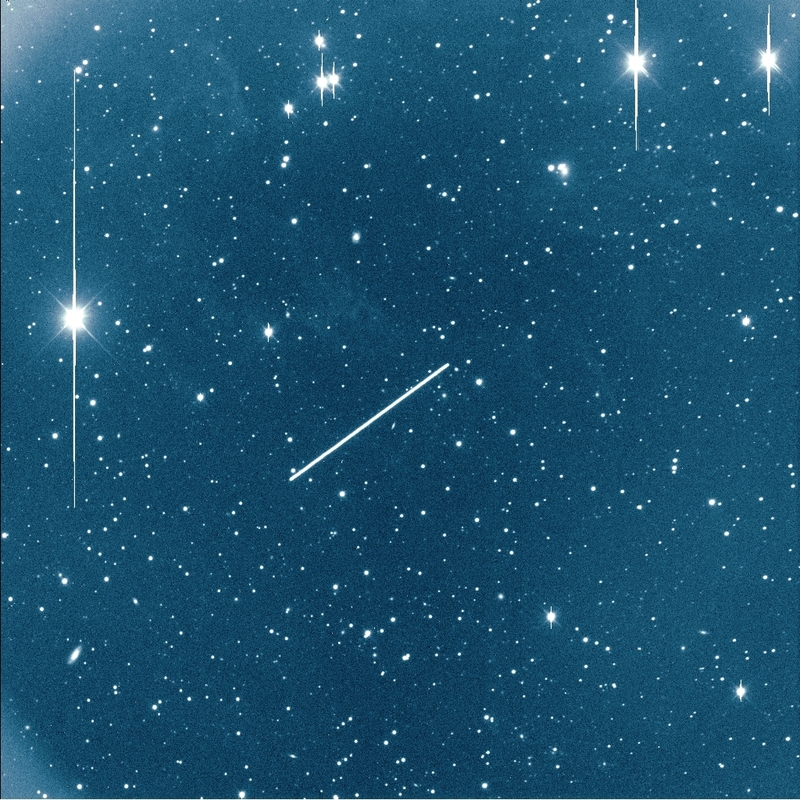 The 60-cm Cichocki telescope was tracking on the object, therefore the stars appear as streaks. Exposure times were 7 second, and images were made using 2x2 binning, giving pixel size of 5 arc seconds. The animation cover a time span of 80 minutes, starting at 23h12UT on March 10. Flyby ephemeris for 106 Crni Vrh Observatory. Copyright © 2007 by J. Skvarc and H. Mikuz, Crni Vrh Observatory. High resolution movie. Posnetki popolnega Luninega mrka so bili narejeni na Astronomskem observatoriju Črni Vrh. Po začetnem oblačnem vremenu se je kako uro pred mrkom nebo zjasnilo. Šele po koncu mrka se je spet pojavilo nekaj oblakov. Sodeč po meritvah vsenebne kamere in naprave Unihedron je bilo nebo med mrkom za okoli 0,2m temnejše kot je sicer za to lokacijo običajno v nočeh brez Lune. Podrobnosti so objavljene na tej strani. Click for animation of NEO asteroid 2007 DB83 discovery. Animation image was made by stacking three 25 second discovery frames taken on 2007 March 24.07 - 24.09UT with 60-cm, f/3.3 Deltagraph telescope and CCD. Image scale is 2.49 arc sec/pixel. Copyright © 2005 by S. Matičič, Črni Vrh Observatory. 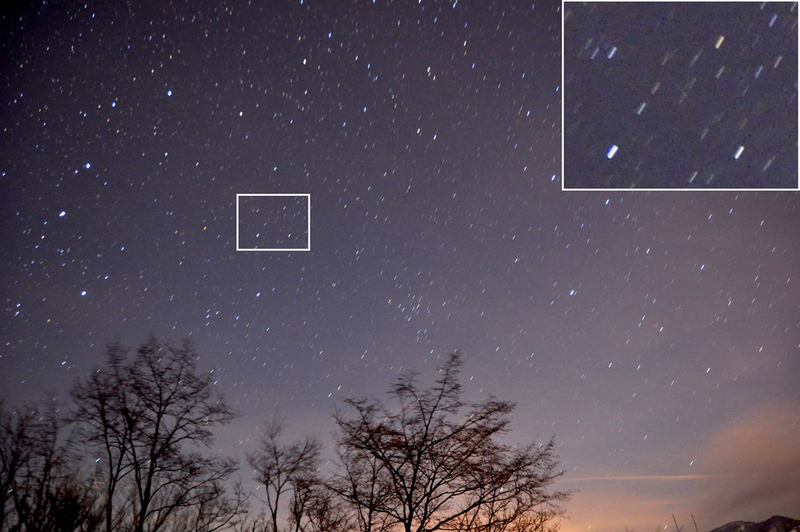 On images taken by S. Matičič in the course of the Črni Vrh Asteroid and Comet Search program PIKA on February 24, 2007 an asteroid with unusual motion was automatically detected. 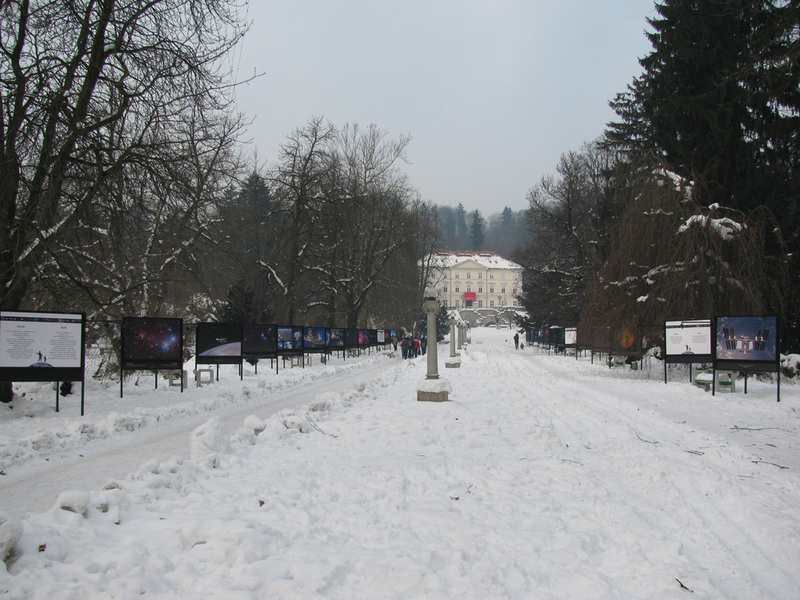 Confirmation images were taken on the night 26-27 February, again by S. Matičič at 106 Črni Vrh. With the semimajor axis of 1.75 AU, inclination of 11 degrees and eccentricity of 0.30, this object belongs to the Amor asteroid family. Estimated object diameter is about 1400 m. Closest approach to Earth will be 0.35 AU on April 15, 2007. The orbit has been linked to observations made on 1996 Oct. 9 by 691 Steward Observatory, Kitt Peak and by 703 Catalina Sky Survey on Jan. 16 and Feb. 10, 2007. Further observations and orbit details are in MPEC 2007-D78. 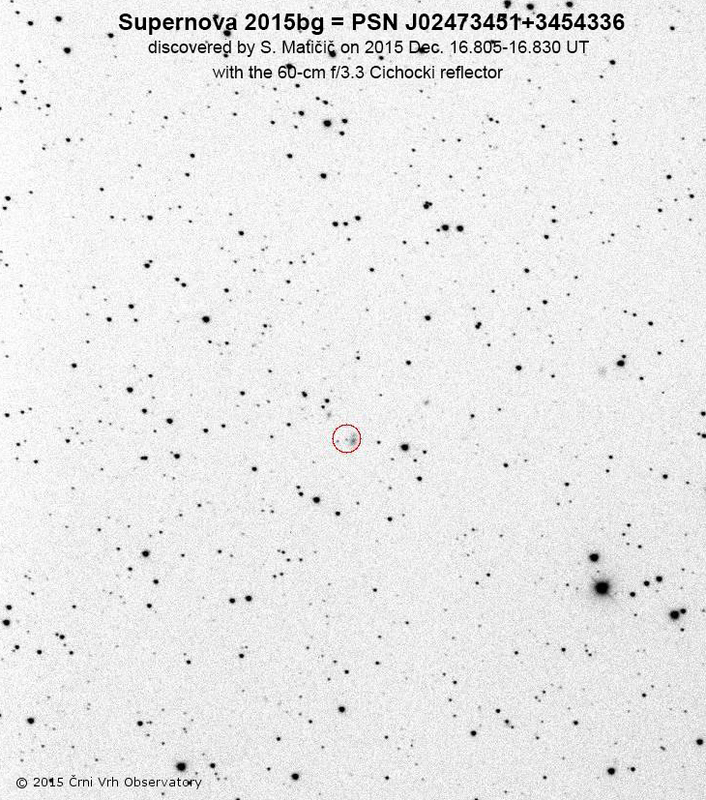 The NEO asteroid 2007 DB83 was discovered with the drift-scan along the declination circles technique that we regularly use on the 60-cm Cichocki robotic telescope. The telescope was operated remotely and the new object was automatically found by Fitsblink software. 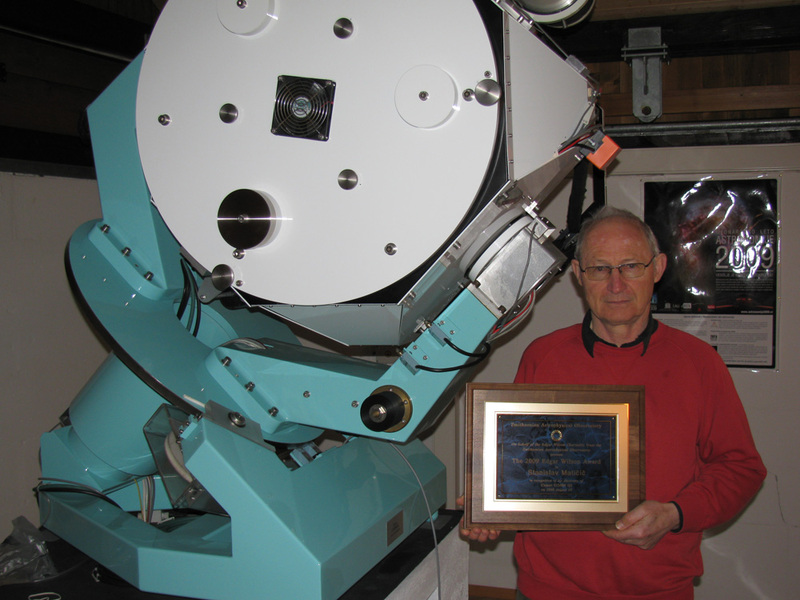 Asteroid (89818) was recently named in honour of our team member Jure Skvarč. He is one of key members of Črni Vrh Observatory team, creating the Fitsblink software for automatic detection and astrometry of asteroids and comets. Also he give indispensable contribution by developing electronics and software for the 60-cm Cichocki telescope as well as part of hardware and software for remote robotic observations at Črni Vrh Observatory. The naming is important recognition to our observing team and will stimulate further activities. It was proposed by Asiago-DLR Asteroid Survey at University of Padova. See full citation below. Discovered 2002 Jan. 2 by the Asiago-DLR Asteroid Survey at Cima Ekar. Jure Skvarč (b. 1964, Slovenia) created data analysis software for automatic astrometric measurements and asteroid search used in the scope of asteroid and comet search project at the Črni Vrh Observatory (Slovenia) and in the Astrovirtel survey at University of Padova (Italy). Naming published in MPC 58597, issued on 2007 Jan. 6. We observed high activity of Geminid meteors during the nights 12. - 15. December 2006. Several fireballs were recorded during the night of Dec. 14./15. 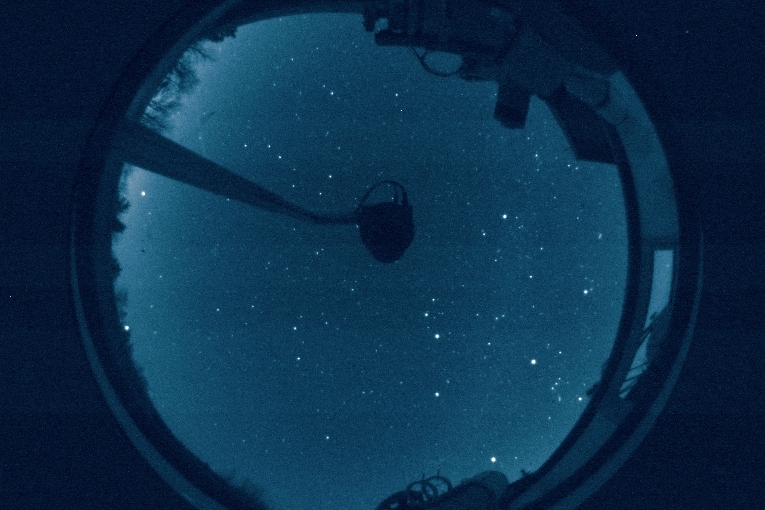 with the Crni Vrh Observatory All Sky Camera. 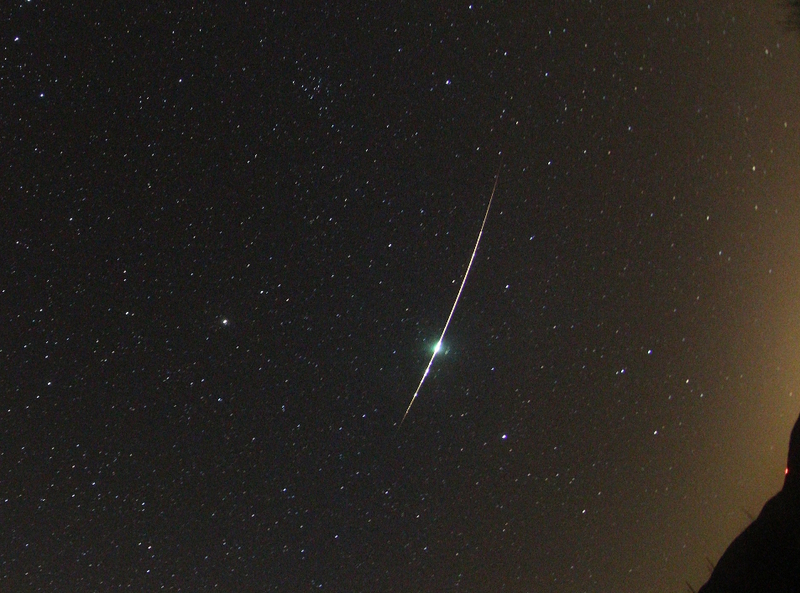 The 30 sec color image of a Geminid fireball was obtained on 2006 Dec. 14 at 23:06UT (start) with Canon EOS 20D DSLR camera and Peleng 3.5/8 mm fisheye lens closed to f/4. The camera gain was set to ISO 1600. Copyright © 2006 by H. Mikuz, Crni Vrh Observatory. 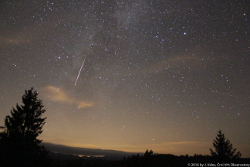 This year predicted maximum of Leonid meteors was expected for Nov. 19 at about 4h45UT. One of potentially best observing places with darkness and meteor radiant high on the sky was La Palma, Canary Islands. Unfortunately, the observations were strongly affected by clouds, so that only few meteors were recorded. 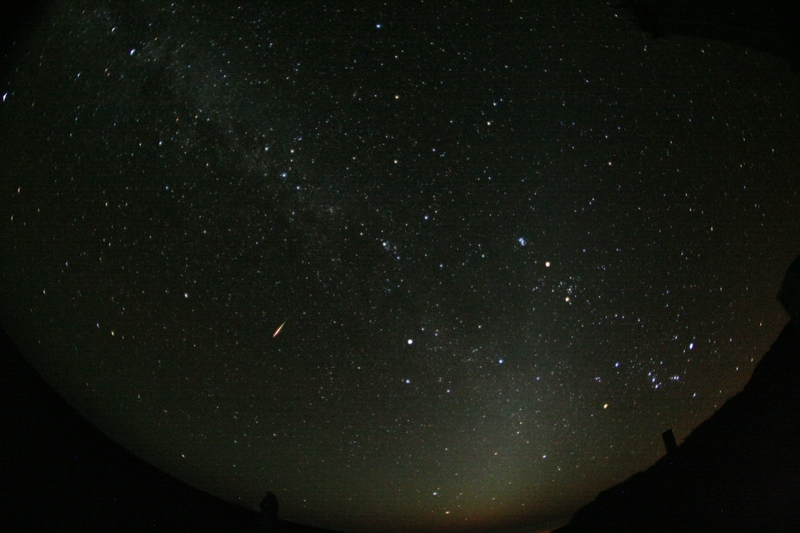 Although the sky was partially obscured by clouds, a trail of bright Leonid meteor was recorded on this wide field image, obtained from 2400m elevation Roque de los Muchachos mountain on La Palma. Image was taken on 2006 Nov. 19 (starting at 03:34:11UT) with 8mm, f/3.5 Peleng fisheye lens attached to Canon 350D DSLR camera. Exposure time was 30 seconds at camera gain set to ISO 1600. See also this video animation taken from the same location on 18-19 Novemeber 2006. High activity of Leonids was predicted at about 5 UT, but nothing unusual was observed. Clouds and high humidity, causing water condensation on the camera, prevented creation of an uninterrupted animation, therefore only discontinuous patches could be joined together. Copyright © 2006 by J. Skvarč. Follow-up observations published in CBET 701 indicate that the object is most probably SU UMa-type cataclysmic variable. Copyright © 2006 by J. Skvarč. We observed optical counterpart of Gamma Ray Burst GRB060904B (Swift trigger 228006) using 60 cm Cichocki robotic telescope at Črni Vrh Observatory. 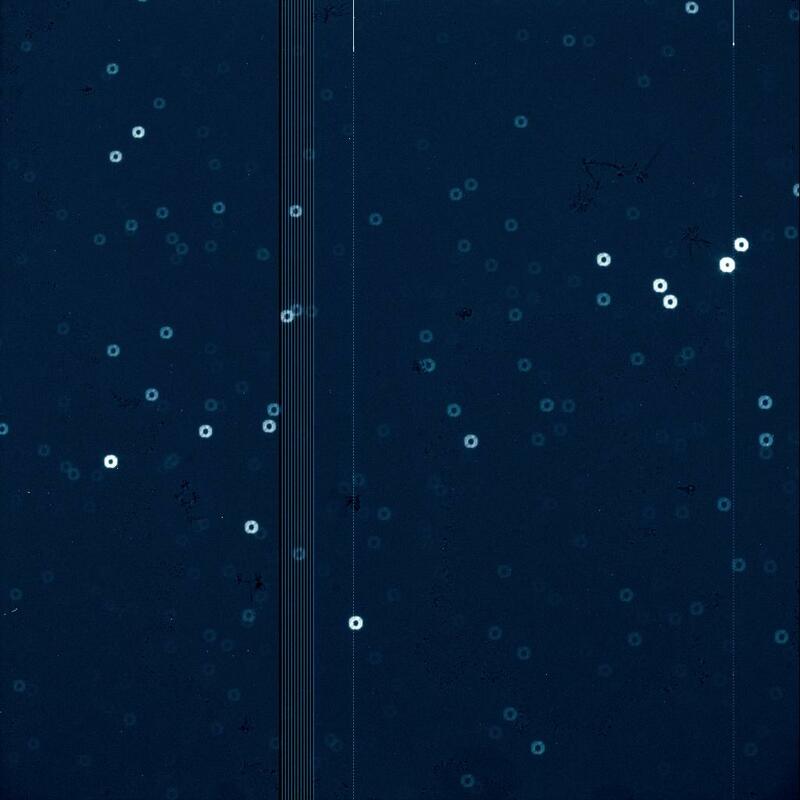 A variable object was detected at ra=03:52:50.52, dec=-0:43:30.9. Alternating exposures using R and B photometric filters were taken. Full results are published in GCN 5511 Circular. The movie shows fast fading of this distant cosmic explosion. The animation above was obtained with R filter and cover the time span of 47 minutes, starting 45 seconds after the trigger from Swift satellite was received. Copyright © 2006 by J. Skvarč, Črni Vrh Observatory, Slovenia. First quasi real time detection of a Gamma Ray Burst (GRB) optical afterglow at Črni Vrh Observatory exhibits a peculiar light curve with a distinct peak about 10 minutes after the burst. This has been observed both using R and B filters. Copyright © 2006 by J. Skvarč, Črni Vrh Observatory, Slovenia. Those interesting to study our original images may download them here. It is a 15MB tar file, including 10 individual exposures. 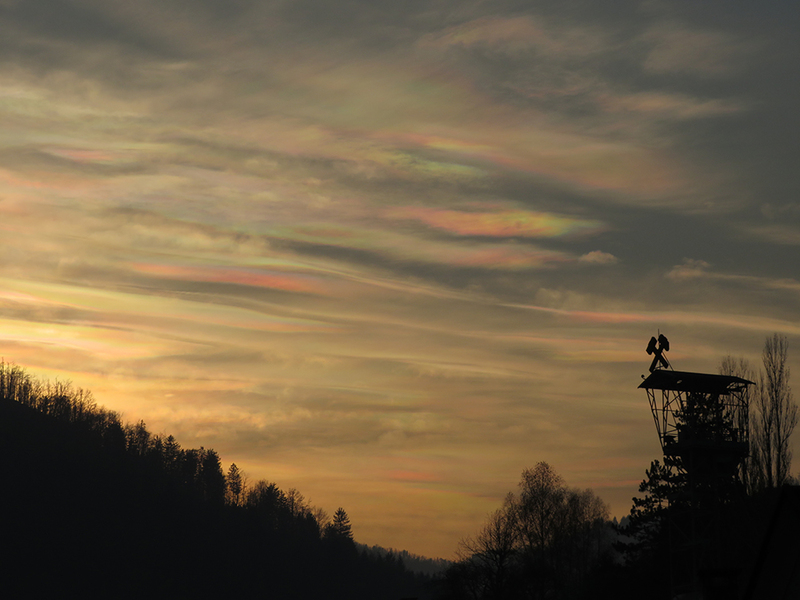 In case you intend to publish results, obtained from our images, please credit them to Črni Vrh Observatory, Slovenia. Misel, da živimo na mirni in okolju prijazni Zemlji, se nam na vrhu aktivnega vulkana takoj spremeni v zmotno. Od nastanka Zemlje, pred 4,5 milijardami let in vse do danes, naša Zemlja ni povsem ugasnila in se ohladila. Ker njeno delovanje in s tem povezani vulkani vznemirjajo vsakega preprostega človeka, sva se z Matejem Mihelčičem v avgustu 2006 odpravila na posebno odpravo - vzpon na vulkan Stromboli in si na lastne oči ogledati njegove izbruhe. Vulkan Stromboli je otok, ki se nahaja v Eolskem/Liparskem otočju v Italiji. Pred 160.000 leti je Stromboli pokukal iznad morske gladine in začel je nastajati otok, ki ima sedaj nadmorsko višino 924 metrov. Vzrok za njegov nastanek je enak kot za vse ostale vulkane (Etna in Vezuv) v Italiji - trk dveh litosferskih plošč. 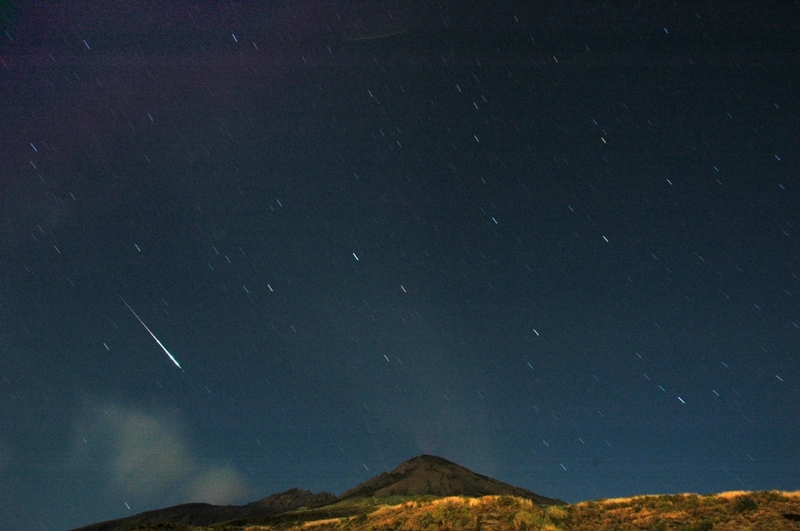 Fireball belonging to Perseid meteor shower was recorded on 2006 Aug. 12 (22h12UT), during the nightime imaging of Stromboli vulcano (Italy) from the coastal village San Vicenza. The wanning moon illuminate the scene with constellations Hercules and Corona Borealis far in the background. Nikon D70s DSLR with 18mm, f/8 lens, 180 second exposure at ISO 400. Copyright © 2006 by Matej Mihelčič & Teja Fabjan, Kobdilj, Slovenia. Stromboli vulcano is located in Lipari chain of islands in Italy. Its creation started some 160.000 years ago with magma ejections that continue to occurr until today. At present, the vulcano island, is composed of lava deposits that rise some 925 meters above sea level. Outstanding video animation (20Mb) about the visit of this active vulcano was composed by Teja Fabjan. Copyright © 2006 by Teja Fabjan, Kobdilj, Slovenia. 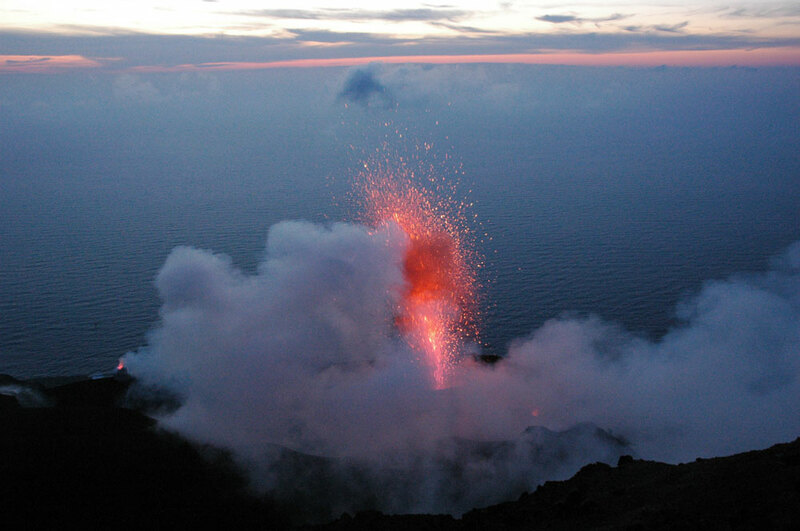 Stromboli is active vulcano with periodical eruptions occurring at about 10 minutes intervals. However, this periodicity is sometimes interrupted by stronger eruptions or even lava ejections. Due to safety reasons, visit to the top is admitted only with a qualifyed guider. The ascenscion to the vulcano begins in late afternoon, starting from the village San Vincenzo. 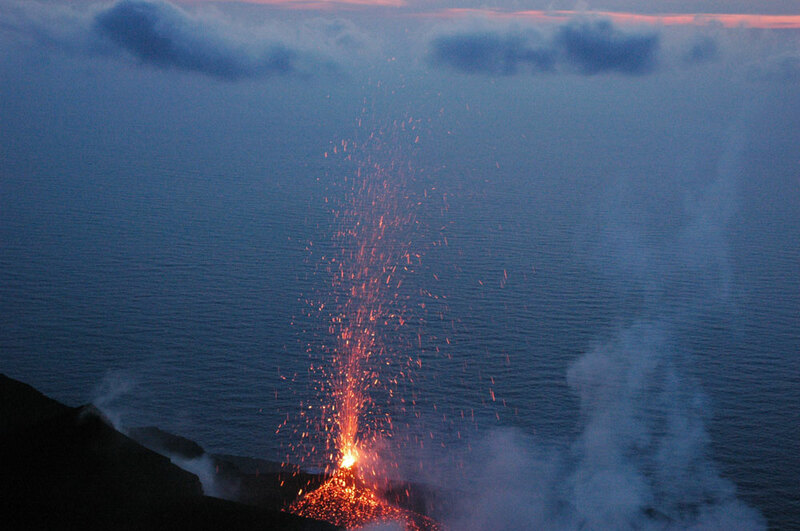 The summit is reached after 2,5 hours and observed in complete darkness when the eruptions are visible at its best and are even most impressive. Copyright © 2006 by Matej Mihelčič & Teja Fabjan, Kobdilj, Slovenia. Stromboli je zanimiv po svoji aktivnosti, ki se ponavlja na približno vsake 10 minut v obliki bruhanja kosov magme. Vendar od časa do časa se tudi ta »urejenost« izbruhov poruši in lahko nastopi močnejši izbruh ali celo izliv lave. Tako se je decembra 2002 zgodil izliv lave, ki je povzročil večmetrski tsunamij, ko se je lava potopila v morje. Aprila 2003 pa je močnejši izbruh lažje poškodoval vas Ginostro na jugozahodni strani otoka. Kljub temu lahko vsak, ki si želi videti Strombolsko aktivnost, pripleza na vrh vulkana. To pa samo pod enim pogojem: da te po celotni poti vodi vodič, ki je za to usposobljen. Hoja na vrh traja 2,5 uri. Na vrhu se ostane 1 uro. Vzpon se začne v poznih popoldanskih urah v vasi San Vincenzo, tako da se izbruhe opazuje v mraku oziroma že temi, saj so takrat bolje vidni in bolj impresivni. Spust pa traja 1,5 ure po mehki vulkanski mivki v popolni temi in z lučjo na glavi. Vsekakor obisk Strombolija priporočava vsakomur, ki ga tovrstne stvari pritegnejo, saj v nas pusti poseben prečat. Besedilo, slike in avtorske pravice © 2006 by Matej Mihelčič & Teja Fabjan, Kobdilj, Slovenia. Near Earth asteroid 2004 XP14 made a close approach to our planet on July 4 2006. On the night of 4 - 5 July a sequence of images was taken with the 60 cm Cichocki telescope using 15 second R filter exposures and tracking on the asteroid. The animation consists of 134 images taken in a time span of 1 hour 40 minutes. The asteroid was moving at a rate of 15 arcseconds / minute. Copyright © 2006 by J. Skvarc, Crni Vrh Observatory, Slovenia. Images of total solar eclipse were obtained near Side, Turkey very close to central line with totality duration 3min 45 sec. We used a wide range of observing equipment, including 500mm, f/8 telephoto lens and Canon EOS 20D DSLR camera, Olympus DSLR with 7.2 megapixels for taking both video and still images and Sony digital video camera which we used for making video animation of the eclipse. Beside digital cameras, we observed also with two classical cameras having ordinary film for color slides (Velvia 100). 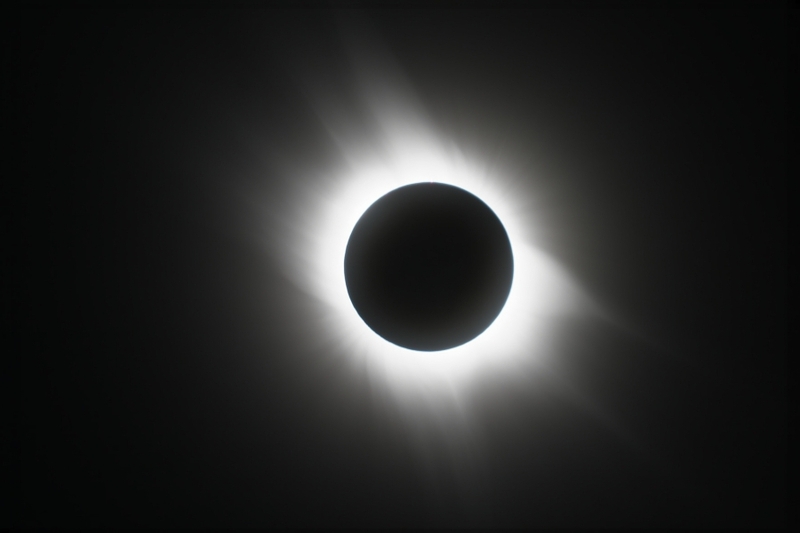 The 250 mm, f/4 lens was used for making wide field images of the corona, while Peleng 8 mm fisheye lens was used for imaging the entire sky during the totality. A 12V/220V power converter was connected to our rental car and supplied 220V current for the video and Canon 20D cameras. Image is stacked from 7 individual exposures, obtained with 500mm, f/8 telephoto lens and Canon EOS 20D DSLR camera. Camera gain set to ISO 200. Copyright © 2006 Crni Vrh Observatory. On images taken by B. Dintinjana and H. Mikuz in the course of the Crni Vrh Asteroid and Comet Search program PIKA, an apparent supernova (mag 17.1) was detected using software for automatic discovery of static objects. Supernova was found on four consecutive unfiltered CCD images taken around Mar. 8.055 UT with a 0.60-m f/3.3 Cichocki Sky Survey Telescope. Composite image of supernova 2006at was made by stacking four 25 second discovery frames taken around 2006 Mar. 8.055UT with 60-cm, f/3.3 Deltagraph telescope, operating in Scanning Along the Great Declination Circles mode. Image scale is 2.49 arc sec/pixel. Copyright © 2006 by B. Dintinjana and H. Mikuz, Crni Vrh Observatory. Image of user interface for verification of new object candidates. Copyright © 2006 by B. Dintinjana, Crni Vrh Observatory. The new object is located at R.A. = 13h12m41s.11, Decl. = +63o16'45".4 (equinox 2000.0), which is approximately 8".0 east and 10".5 north of the center of a nearby very faint galaxy. Nothing is visible at this location on three consecutive PIKA R-band images obtained on Feb. 12.074 (limiting mag 18.5) or on a Digital Sky Survey (DSS) image from 1993 Mar. 19 (limiting blue mag stated as 19.6). Discovery was announced in CBAT Electronic Telegram No. 424 and confirmed by H. Yamaoka, Kyushu University; and H. Naito and N. Tokimasa, Nishi-Harima Astronomical Observatory. They obtained a low-resolution spectrum, indicating that it may be a very young supernova. On September 8-11, 2005, former NASA astronaut Russell L. Schweickart visited Slovenia together with his wife Nancy Ramsey. He piloted Apollo 9's lunar module in 1969 and served as a backup commander for the first Skylab mission in 1973. He currently chairs the board of directors for the B612 Foundation. Since we have common interest in NEO asteroids, he also visited Crni Vrh Observatory. His current interest is devoted to the NEO asteroids that are potentionally threatening our planet and plans to send the unmanned space mission trying to deflect such body and prevent it from hitting Earth. In October 2001, more than 20 like-minded engineers and astronomers, including few former and current astronauts gathered in the Johnson Space Center in Houston to discuss what they saw as the missing element in the space program - attention to the possibility of our planet being struck by a near Earth asteroid. 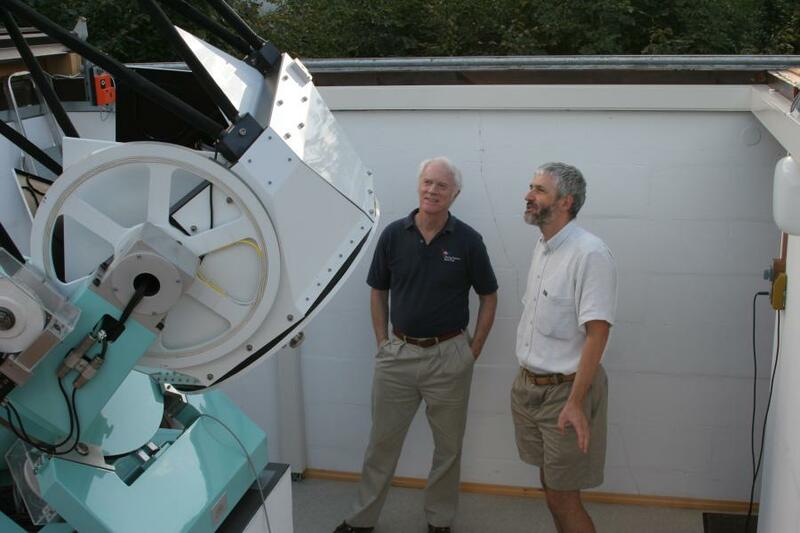 R. Schweickart and H. Mikuz during the inspection of the 60-cm Cichocki robotic telescope at Crni Vrh Observatory. 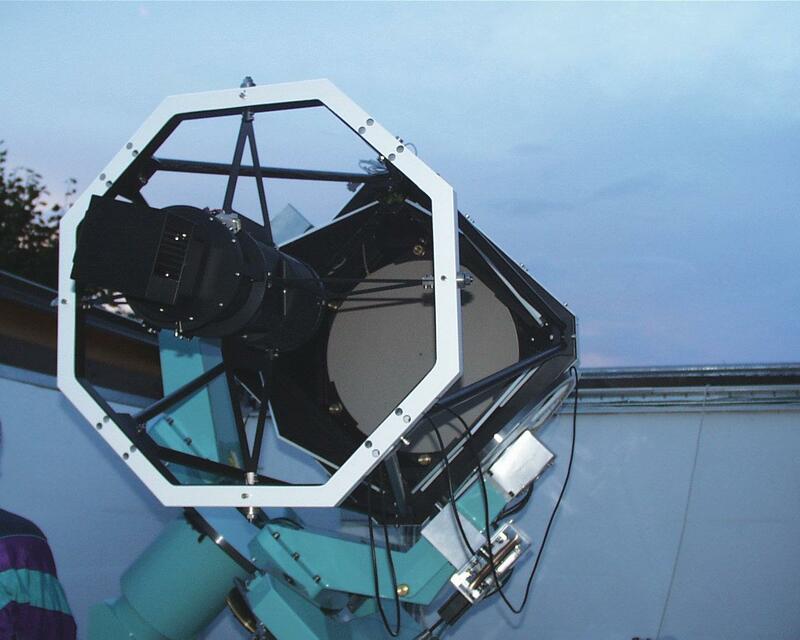 In the course of PIKA search programe, 7 NEO asteroids were discovered so far with this telescope. Copyright © 2005 Crni Vrh Observatory. 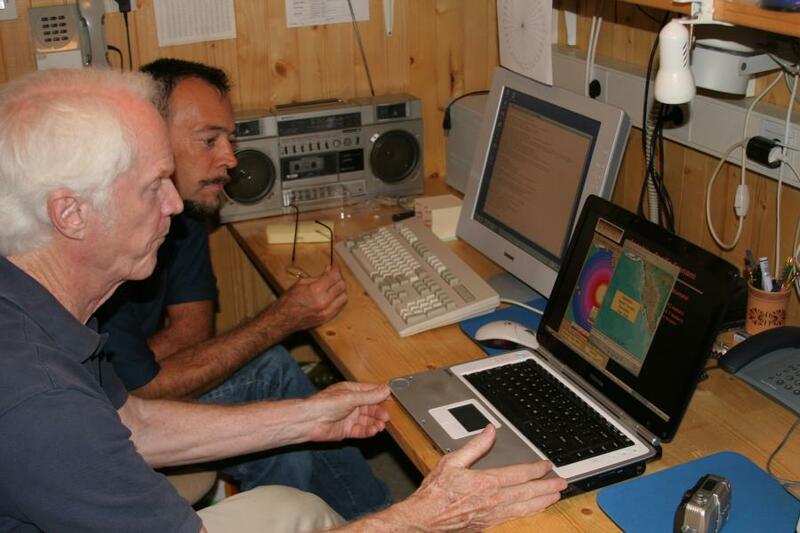 R. Schweickart and B. Dintinjana in the control room of Crni Vrh Observatory, inspecting the virtual asteroid impact on Earth and its consequences. See California for a simulation of a 2004MN4 impact generated tsunami in the Pacific Ocean and same object impacting in the Gulf of Mexico. Copyright © 2005 Crni Vrh Observatory. In order to facilitate their work, they formed the B612 Foundation, a non-profit corporation named after the home asteroid of the title character in Antoine de Saint-Exupery's The Little Prince. Also they proposed to NASA a B612 Mission that would be sent to appropriate NEO asteroid with well known orbit and either speed up the body by pushing it in the direction of its orbital motion or slow it down by pushing in the opposite direction. Rather than giving the asteroid a powerful shove, they proposed the asteroid-tug concept that would deliver a gentle but constant pressure, causing a slight but large enough deflection of orbit. The space tug would need to rendezvous with a target asteroid, attach itself to the surface and show its ability to maneuver the object. Thus the goal of a B612 mission is to significantly alter the asteroid's orbit in a controlled manner. If successfull, they would clearly demonstrate that the deflection of small Solar System bodies from hitting Earth is possible. In a recent article published in Sept.-Oct. 2005 issue of American Scientist they stressed the importance of such space mission, following a recent addition of the 330-m diameter asteroid designated 99942 Apophis to the list of small bodies that have small but real chance of striking the Earth. During the night of 2005 Aug. 12-13, Crni Vrh Observatory team member Jure Skvarc set up his Canon Digital Rebel DSLR camera and Peleng 3.5/8 mm fisheye lens on a fixed tripod atop the 2400m elevation Roque de los Muchachos mountain on La Palma Island - one of the best observing places on our planet. He obtained dusk to dawn long series of 30 second exposures, covering nearly the whole sky. During the photo session, he recorded many meteors and two bright fireballs. Animation of a -10 magnitude fireball from Aug. 13 at 3h38UT and its afterglow. Copyright © 2005 by J. Skvarc. These objects were successfully imaged with 60-cm Cichocki Sky Survey Telescope during the July 29 - Aug. 2 period. We took a series CCD exposures on each night and co-added them to obtain a single, long exposure image of distant Solar System objects. Transneptunian object 2003 UB313, so called 10th planet recently reported in IAUC 8577 was successfully imaged on July 31 and Aug. 2 early morning sky with 0.6-m, f/3.3 remote robotic telescope, R+W filters and CCD. The object was nearly 97 astronomical units from the Earth (current Sun-Pluto distance is 30 a.u. ), slowly moving toward the S-SW at only 11 arc sec/day. Image scale is 2.49 arc sec/pixel. Further details are displayed on images. Copyright © 2005 by J. Skvarc & H. Mikuz, Crni Vrh Observatory. Transneptunian object 2003 EL61, recently reported in IAUC 8577 was successfully imaged on two consecutive nights July 29-30, 2005 with 0.6-m, f/3.3 robotic telescope, B+W filters and CCD. The object was nearly 52 astronomical units from the Earth, slowly moving toward the SE at about 50 arc sec/day. Further details are displayed on images. Image scale is 2.49 arc sec/pixel. Copyright © 2005 by J. Skvarc & H. Mikuz, Crni Vrh Observatory. While staying on the Island of Cres (Croatia) for holidays, I took some wide field night sky scenes using a fixed tripod and Canon EOS 20D DSLR camera. In spite of modest equipment (lack of motorized mount), I was able to obtain surprisingly good images of the central region of our Milky Way Galaxy. By chance, the Nova Sagittarii 2005 No. 2 was also recorded 2.9 days after discovery by William Liller in Chile (IAUC 8559). This true color view was taken on 2005 July 6.9UT. It is a composite image, made by adding four 30 second exposures obtained from a fixed tripod with Canon EOS 20D camera and 20 mm lens. In order to reduce the image smear due to Earth rotation, the camera sensitivity was boost to 1600 ASA. Stars down to -42o declination are visible just over the southern horizon (middle of frame). Some clouds moved over the horizon during the exposure, slightly reflecting the HP sodium light from the distant towns of Osor and Mali Losinj. Copyright © 2005 by H. Mikuz, Crni Vrh Observatory. 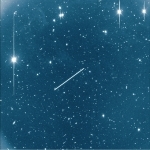 Enlarged part of the above image with the Nova Sagittarii 2005 No. 2 marked. Nova was at magnitude 8.0 at the time of discovery, reaching 7.2 on July 5.0 and faded to about mag. 8.5 on the above image. Copyright © 2005 by H. Mikuz, Crni Vrh Observatory. Island of Cres is the largest in Adriatic sea but so far also relatively unpopulated, with only few smaller tourist centers. The light pollution is consequently low. As soon as you move in the island countryside, the night sky is very dark -- a good place for imaging the sky and the Southern Milky Way in particular. Perhaps, one of the darkest places in Europe. 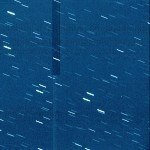 Click for animation of NEO asteroid 2005 FV2 discovery. Animation image was made by stacking three 25 second discovery frames taken on 2005 March 18.90 - 18.92UT with 60-cm, f/3.3 Deltagraph telescope and CCD. Image scale is 2.49 arc sec/pixel. 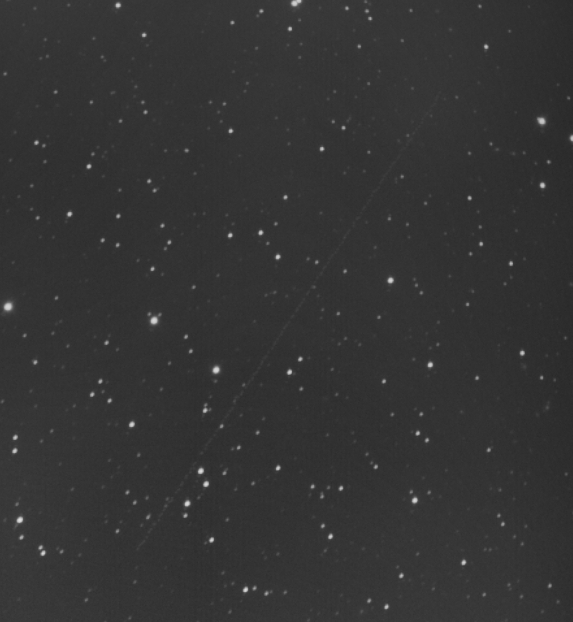 Bright trail on the 3rd image is due to artificial satellite passing through the telescope field. Copyright © 2005 by S. Maticic and B. Dintinjana, Crni Vrh Observatory. On images taken by S. Maticic in the course of the Crni Vrh Asteroid and Comet Search program PIKA on March 18, 2005 an asteroid with unusual motion was automatically detected. After being posted on the NEO Confirmation Page, further measurements were obtained by P. Birtwhistle (J95, Great Shefford) and S. Sposetti (143, Gnosca). They provided enough observations to determine basic orbital parameters. With the semimajor axis of 2.05 AU, inclination of 19 degrees and eccentricity of 0.71, this object belongs to the Apollo asteroid family. Estimated object diameter is ~500 m. Closest approach to Earth was 0.265 AU on March 11, 2005. Further observations and orbit details are in MPEC 2005-F28. 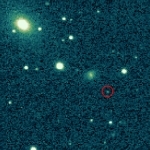 The NEO asteroid 2005 FV2 was discovered with the drift-scan along the declination circles technique that we regularly use on the 60-cm robotic telescope. The telescope was operated remotely and the new object was automatically found by Fitsblink software. Click for animation of NEO asteroid 2005 CR37 discovery. Animation image was made by stacking three 25 second discovery frames taken on 2005 February 8.14 - 8.16UT with 60-cm, f/3.3 Deltagraph telescope and CCD. Image scale is 2.49 arc sec/pixel. Copyright © 2005 by H. Mikuz and B. Dintinjana, Crni Vrh Observatory. On images taken by H. Mikuz in the course of the Crni Vrh Asteroid and Comet Search program on February 8, 2005 an asteroid with unusual motion was automatically detected. The rate and direction of motion indicated that the object does not belong to the main belt asteroids. After being posted on the NEO Confirmation Page, further measurements were obtained by observers worldwide. They provided enough observations to determine basic orbital parameters. With the semimajor axis of 1.9 AU, inclination of 26 degrees and eccentricity of 0.46, this object belongs to the Amor asteroid family. Estimated object diameter is ~900 m. Closest approach to Earth is 0.063 AU on February 27, 2005. Further observations and orbit details are in MPEC 2005-C32. The NEO asteroid 2005 CR37 was discovered with the new drift-scan along the declination circles technique that we regularly use on the 60-cm robotic telescope. The telescope was operated remotely and the new object was automatically found by Fitsblink software. Click for animation of NEO asteroid 2005 CC37 discovery. Animation image was made by stacking three 25 second discovery frames taken on 2005 February 6.86 - 6.87UT with 60-cm, f/3.3 Deltagraph telescope and CCD. Image scale is 2.49 arc sec/pixel. 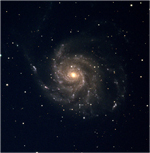 Copyright © 2005 by S. Maticic and B. Dintinjana, Crni Vrh Observatory. 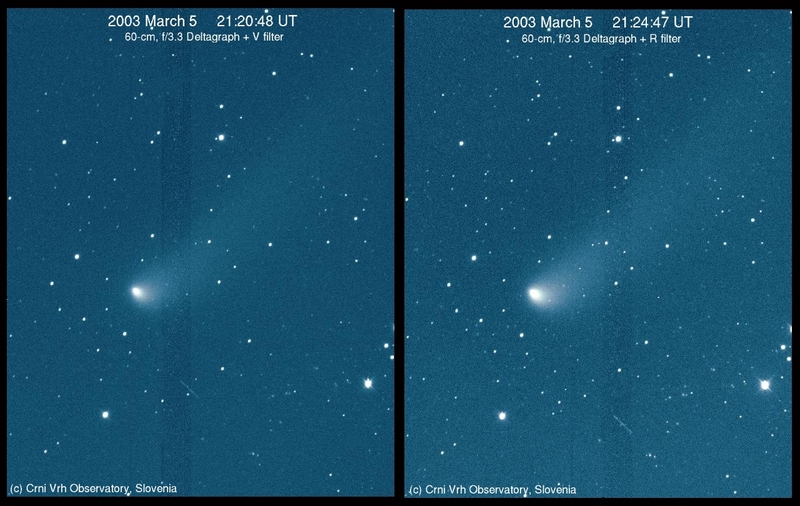 On images taken by S. Maticic in the course of the Crni Vrh Asteroid and Comet Search program on February 6/7 2005, an asteroid with unusual motion was automatically detected. The rate and direction of motion (2.6o/ day in PA 113o) indicated that the object does not belong to the main belt asteroids. After being posted on the NEO Confirmation Page, further measurements were obtained by H. Mikuz and other observers worldwide. They provided enough observations to determine basic orbital parameters. With the semimajor axis of 2.2 AU, inclination of 6 degrees and eccentricity of 0.56, this object belongs to the Apollo asteroid family. Estimated object diameter is ~200 m. Closest approach to Earth was 0.0534 AU on January 27, 2005. Further observations and orbit details are in MPEC 2005-C30. 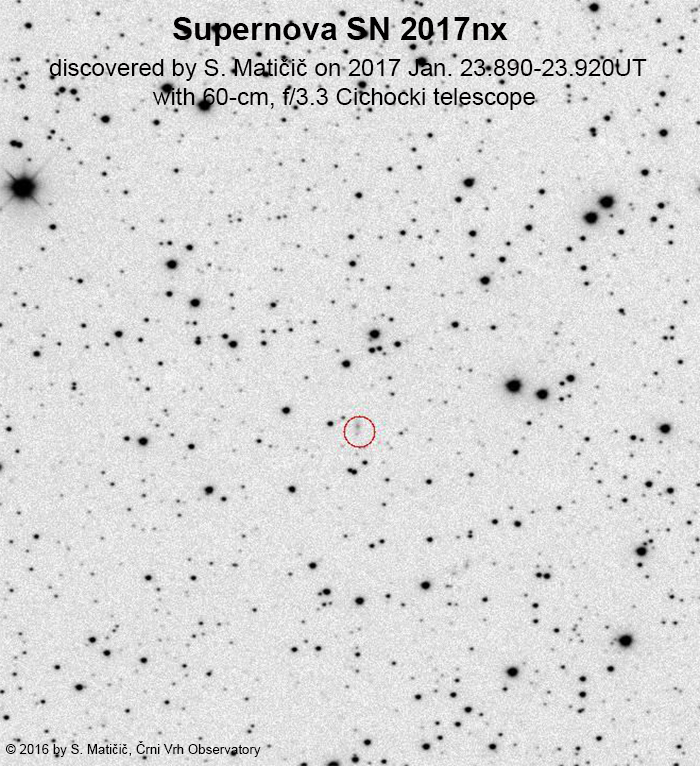 The NEO asteroid 2005 CC37 was discovered with the new drift-scan along the declination circles technique that we regularly use on the 60-cm robotic telescope. The telescope was operated remotely and the new object was automatically found by Fitsblink software. Bright fireball of about magnitude -10 was recorded with the All-sky camera on 2005 Feb. 6. One minute exposure was centered at 22h32m40s UT. Trace of fireball afterglow was also recorded on next image taken one minute later. 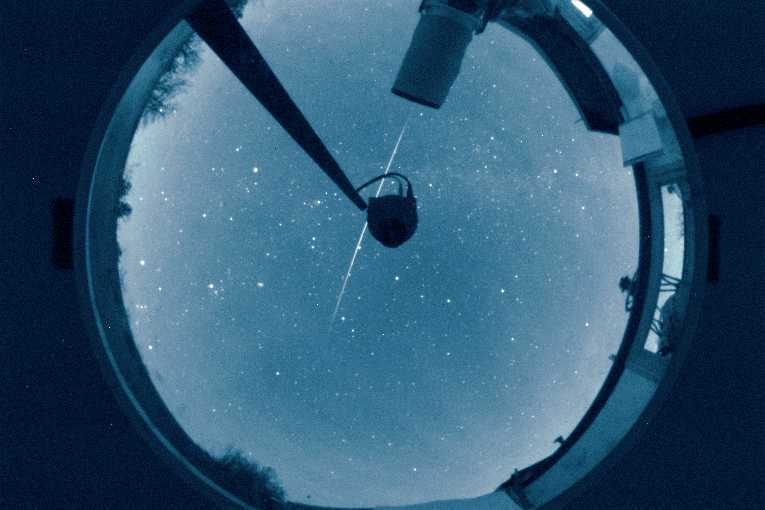 Several fireballs and other phenomena were recorded with this camera since we put it in regular operation in August 2004. Copyright © 2005 by H. Mikuz, Crni Vrh Observatory. 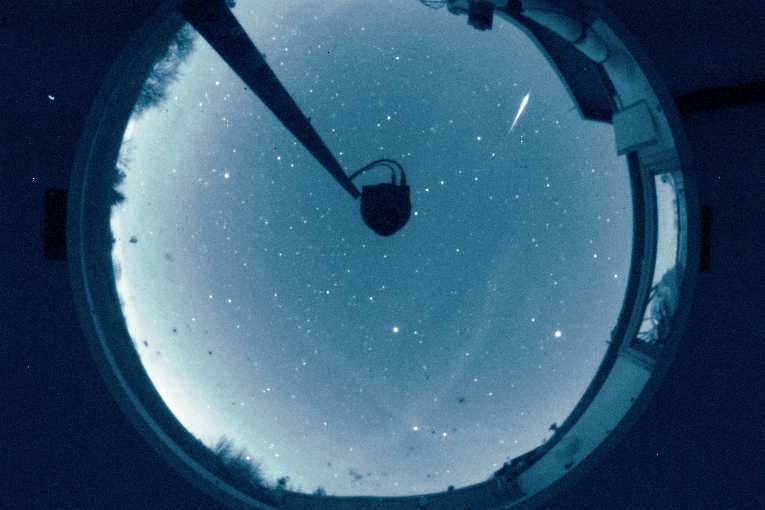 Bright fireball, belonging to Geminid shower was recorded with the All-sky camera in early morning of 2004 Dec. 12. One minute exposure was centered at 4h25m46s UT. 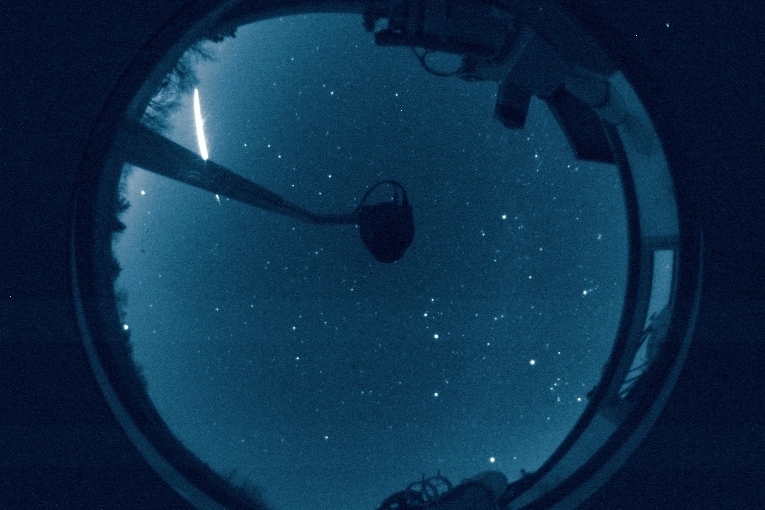 Several fireballs and other phenomena were recorded with this camera since we put it in regular operation last August. Copyright © 2004 by H. Mikuz, Crni Vrh Observatory. This scenic view of conjunction was obtained from Slovenia Karst region on early morning of November 5, 2004. Canon EOS 20D digital camera and 17-40 mm lens at f/4 was used. Exposure time was 30 seconds at ISO set to 400. Dark image of the same duration was automatically subtracted. Copyright © 2004 by H. Mikuz, Crni Vrh Observatory. Click for animation of NEO asteroid 2004 RS109 discovery. 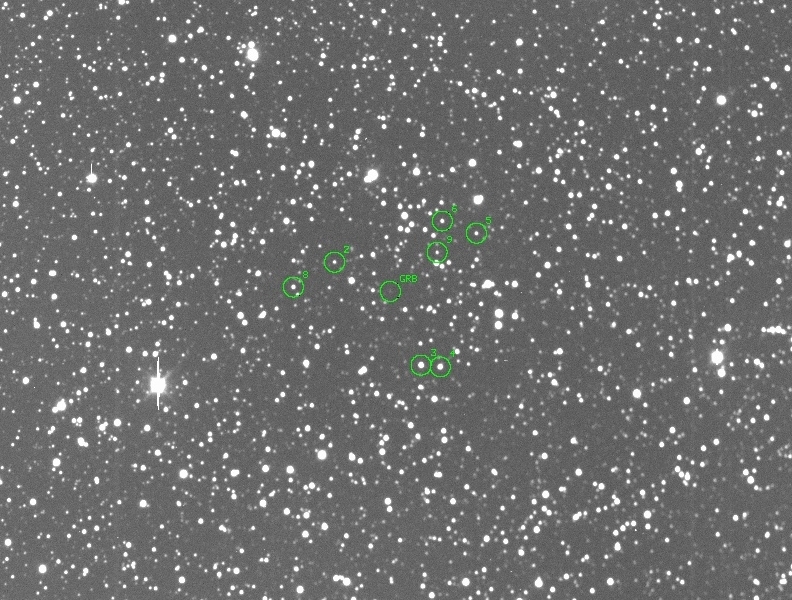 Animation image was made by stacking three 25 second discovery frames taken on 2004 September 10.96 - 10.98UT with 60-cm, f/3.3 Deltagraph telescope and CCD. 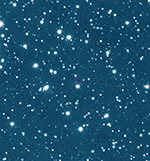 A numbered main belt asteroid 86034 is in the same field and marked with a green square. Note the difference in speed and direction of motion. Image scale is 2.49 arc sec/pixel. Copyright © 2004 by H. Mikuz and B. Dintinjana, Crni Vrh Observatory. On images taken by H. Mikuz in the course of the Crni Vrh Asteroid and Comet Search program on September 10/11 2004, an asteroid with unusual motion was automatically detected. The rate and direction of motion (3o/ day in PA 163o) indicated that the object does not belong to the main belt asteroids. After being posted on the NEO Confirmation Page, confirmation measurements were taken on the Sep. 11 evening by S. Maticic and other observers worldwide. They provided enough observations to determine basic orbital parameters. With the semimajor axis of 2.34 AU, inclination of 34 degrees and eccentricity of 0.5, this object belongs to the Amor asteroid family. Closest approach to Earth is on 2004 Sep. 16.5UT at the distance of 27 million km. Estimated diameter of this object is ~1 km. Further observations and orbit details are in MPEC 2004-R61. 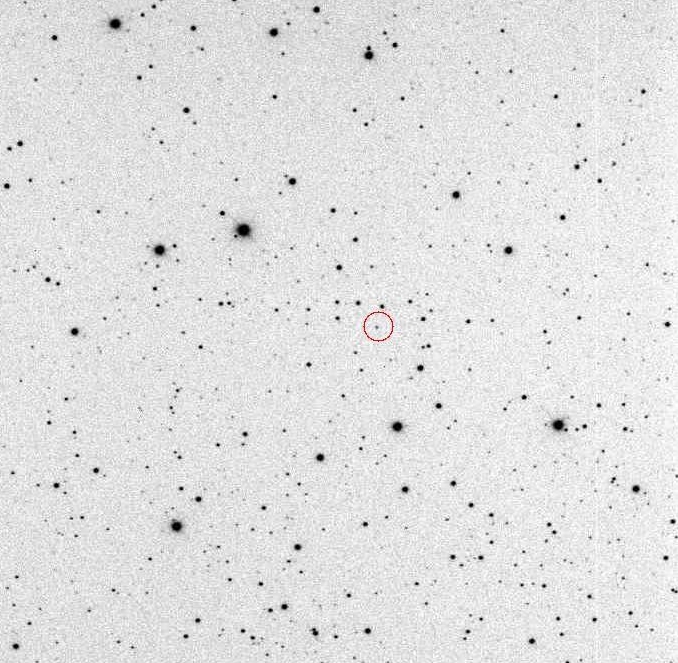 The NEO asteroid 2004 RS109 was discovered on the first night we used the new drift-scan along the declination circles technique on the 60-cm robotic telescope. It was operated remotely and the new object was automatically found by Fitsblink software. Some 15 comet observers from Italy, Hungary, Poland and Slovenia gathered on a two day CARA conference which take place at Crni Vrh elementary school. The aim of conference was discussion on how to improve the quality of comet observations by using new observational techniques (remote robotic telescopes, narrow band filters and various software tools). See conference programme for further details. On Sunday afternoon, participants visited nearby Crni Vrh Observatory where the new 60-cm robotic telescope is now in full operation. 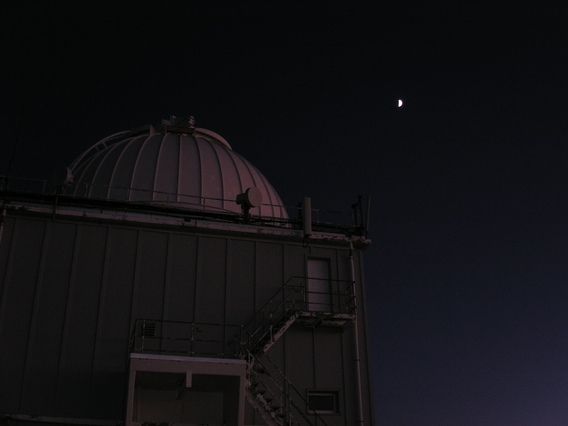 Part of telescope time is devoted also to comet observations. 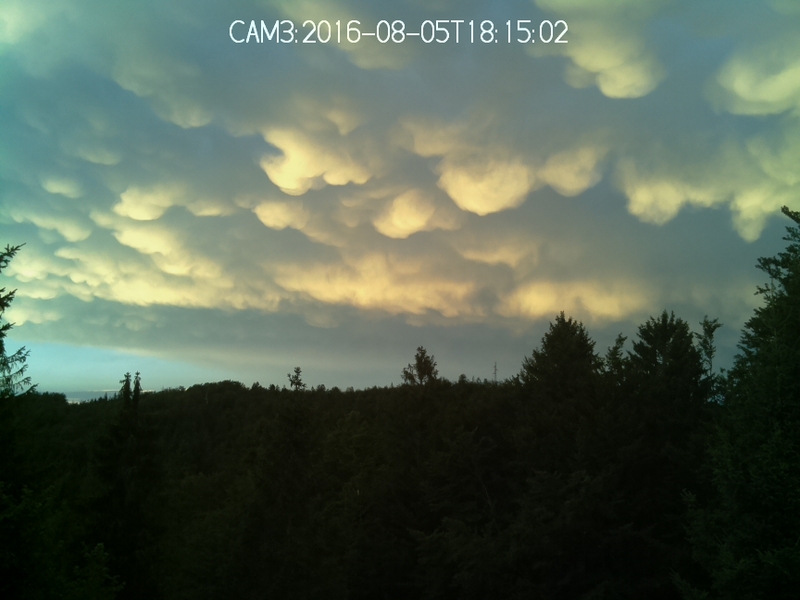 Unfortunately, evening remote observations were not possible due to bad weather. See also some nice pictures, taken during the conference. 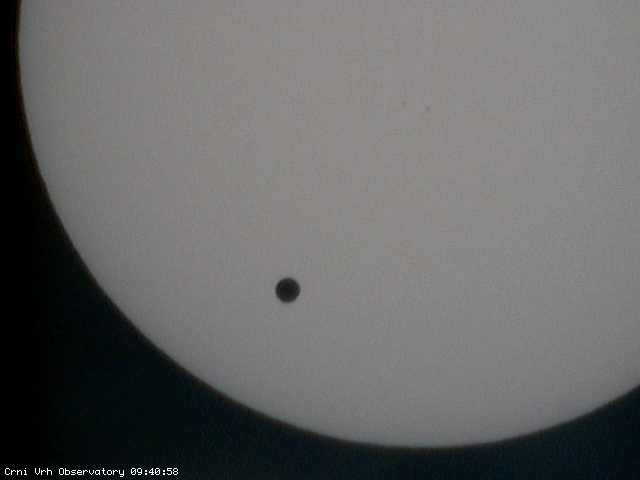 Venus transit was successfully imaged with 500 mm, f/8 lens, webcam and solar filter. Video animation was prepared by using 360 images taken at 1 minute intervals. Time recorded on images is Central European Summer Time (UT+2h). North is up and East to the left. Copyright © 2004 by H. Mikuz, B. Dintinjana and S. Maticic, Crni Vrh Observatory, Slovenia. We prepared also public observation at the Crni Vrh Elementary School where B. Mikuz and J. Vales conducted observations with 15-cm Maksutov telescope and solar filter. You can look at image archive which contain images at 10 sec intervals, starting from 5h30UT. The file name contain information on when particular image was obtained. Thus image 74154.jpg was taken at 7h 41min 54 sec. Click for animation of NEO asteroid 2004 FF29 discovery. Animation image is made by stacking three 30 second discovery frames taken on 2004 March 28.994 - 29.005UT with 60-cm, f/3.3 Deltagraph telescope and CCD. Image scale is 1.85 arc sec/pixel. 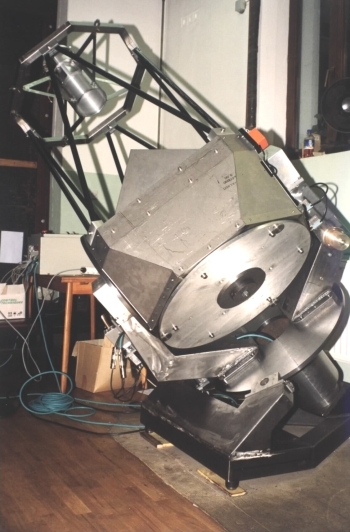 Copyright © 2003 by H. Mikuž, S. Matičič and B. Dintinjana, Črni Vrh Observatory. Click for animation of NEO asteroid 2003 SS214 discovery. Animation image is composed from three 30 second discovery frames taken on 2003 September 26.88UT with 60-cm, f/3.3 Deltagraph telescope and CCD. Image scale is 1.85 arc sec/pixel. 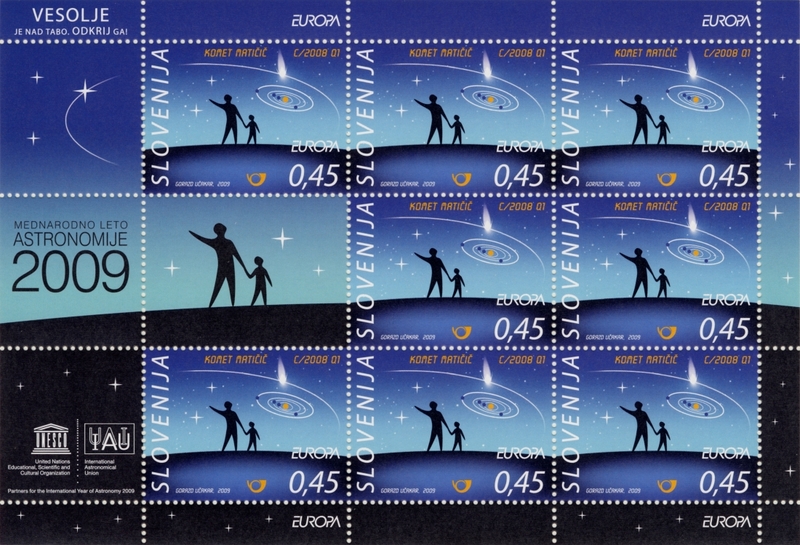 Copyright © 2003 by S. Matičič and J. Skvarč Črni Vrh Observatory. 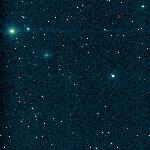 Images of comet C/2001 RX14 (LINEAR) with NEO asteroid 2003 EM1. On the right side image, taken with R filter the asteroid trace has unequal intensity which imply brightness changes due to rapid rotation. Copyright © 2003 J. Skvarč Črni Vrh Observatory, Slovenia. 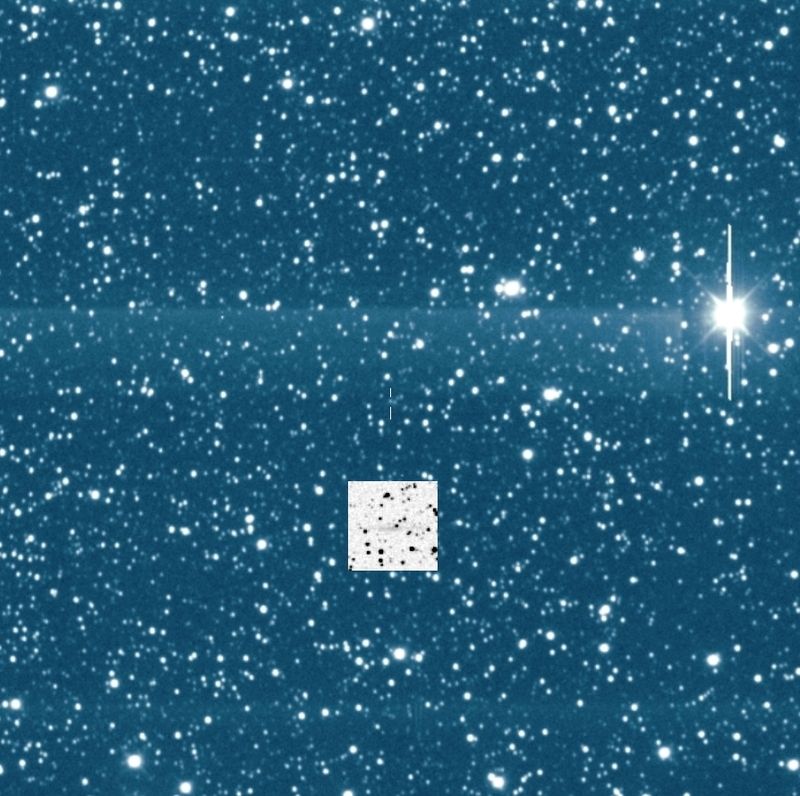 Fast moving object, crossing the field of Comet C/2001 RX14 (LINEAR) was found by J. Skvarc on 2003 March 5 in the course of our sky survey program with 60-cm, f/3.3 Deltagraph telescope. Due to rapid motion, the object left ~2 arc min trace on both 120 second images taken 4 minutes apart. NEO is just S-SW of the comet and moves toward the SW direction. After beeing confirmed by several observatories it received the designation 2003 EM1. Preliminary measurements indicate that this is a very fast rotating asteroid, probably first of this size with rotating period of less than 2 minutes. It belongs to Aten type of asteroids which have their orbit entirely inside the Earth's. Further orbit details are published in MPEC 2003-E28. Image scale is 2.49 arc sec/pixel. Dark columns in the middle of frames are due to bad CCD cosmetics. Copyright © 2003 by J. Skvarč, Črni Vrh Observatory, Slovenia. Early in the morning we obtained first images with the new 60-cm telescope. We carefully assembled all telescope parts and on Sept 1st, the system was ready for first light. After the laser collimation procedure, we performed the Faucault test and adjusted the telescope back-focus to within 0.1mm off the ideal position. Then we put 1k x 1k CCD and took few images. The first one was out of focus and shows the telescope is well collimated. After some focus adjustment, we obtained second image with sharp stellar images accross the whole field. 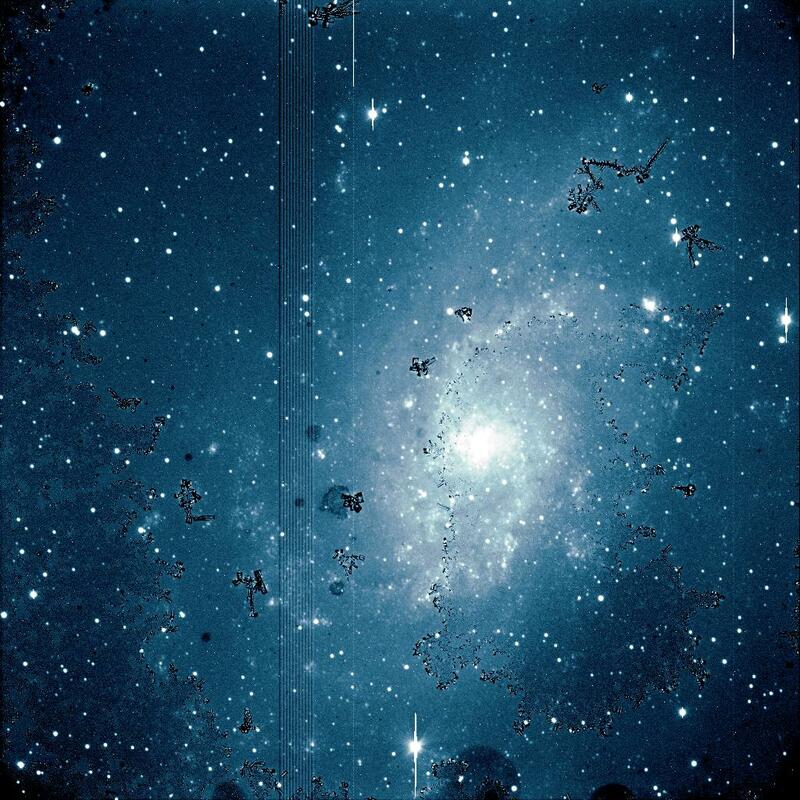 We slewed the telescope to M33 and took a 3-min unguided exposure with R filter. Again, stellar images remain pin-point, although the mount was not yet aligned and the telescope drive constants only roughly set. Since the CCD was not used for a few months, all images have lot of ice crystalls all over the frame and are unprocessed. We just want to demonstrate that the optics, mechanics and electronics performed well. Real images will follow soon. See also one minute CCD exposure of M15 globular cluster, using a 60-cm telescope and R filter. Works on the construction of a 60-cm telescope are well in progress. The telescope optics was ordered at Astrooptik Co. in August 2000 and delivered in April 2001. Technical solutions and project drawings were completed early in 2001. Later, we switched our activity to observatory reconstruction. In August 2001, we received servo motors and drive electronics. At the same time, work on the completion of control electronics started. During November 2001 - March 2002, most of telescope parts were made in a local workshop and on March 22, we started to assemble all parts together. The upper ring, containing corrector and motorized focusing device was assembled first. On April 25th, the telescope servo drives were successfully tested for the first time. The most time consuming and rather difficult process was the making of motorized flaps that cover the mirror cage and protect it from moisture and dust. After all parts were assembled, the telescope was tested in a workshop once again on May 13, 2002. Mechanical and electronics tests passed well and the telescope was disassembled for painting. It will be installed at the Crni Vrh Observatory in June 2002.